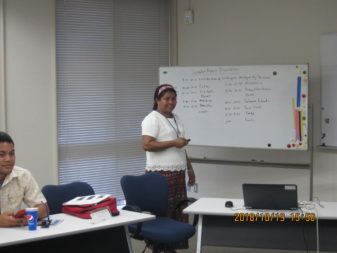 The entire training program was completed by yesterday. 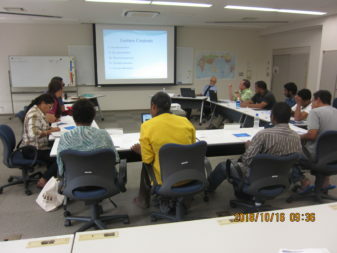 Evaluation meeting was held at 10:00 today to get feedback from each participant. 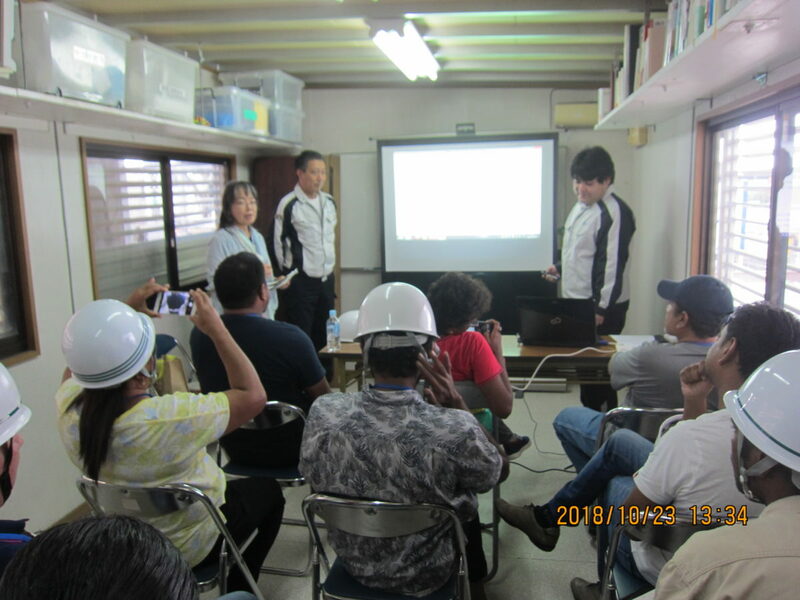 The training program was highly evaluated with some suggestions for founding the detailed field training course (Waste treatment method, Drone & 3D, Traffic planning, Structure design and calculation, Safety management at construction site, etc.). 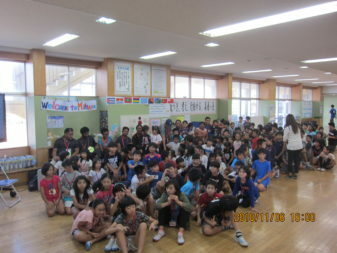 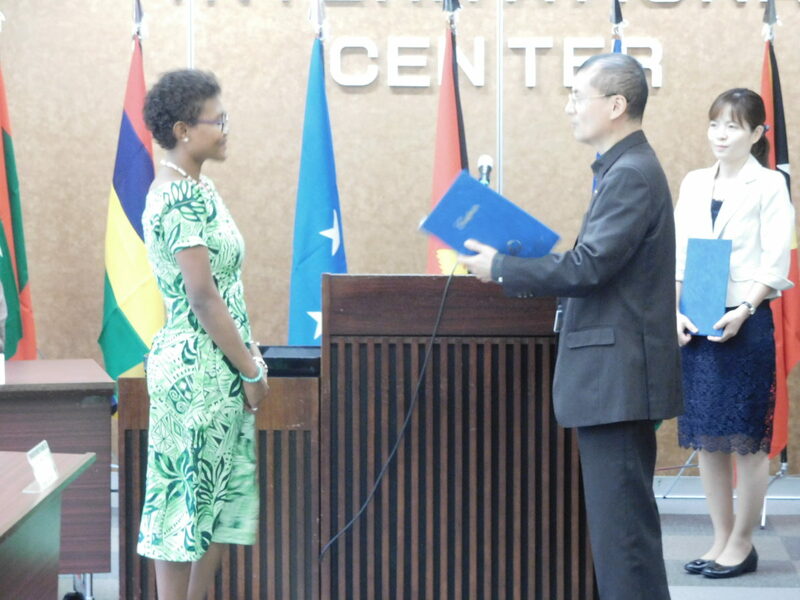 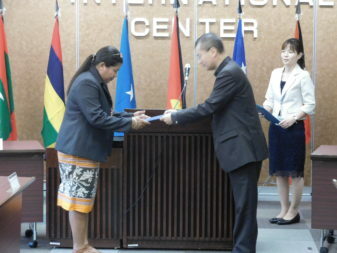 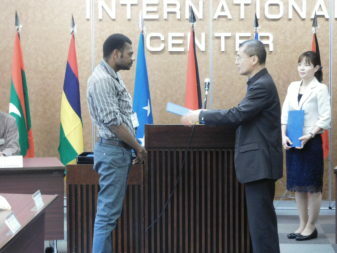 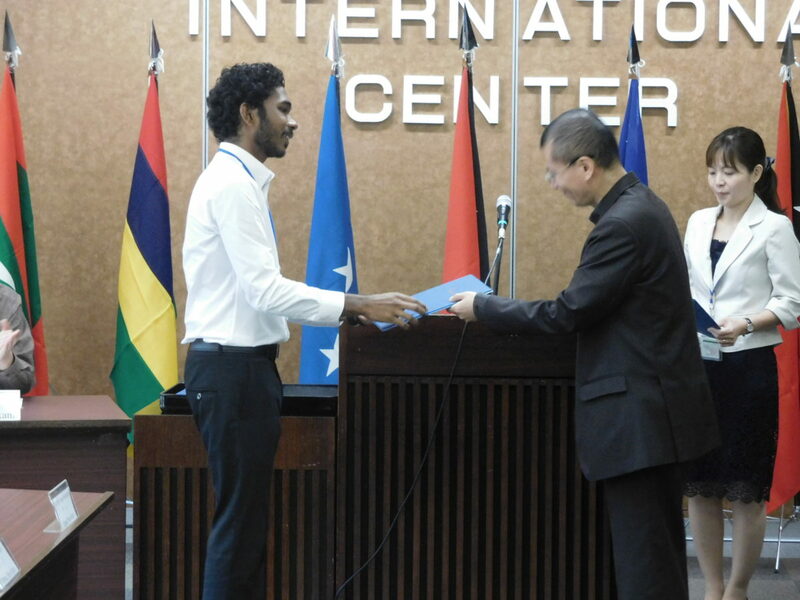 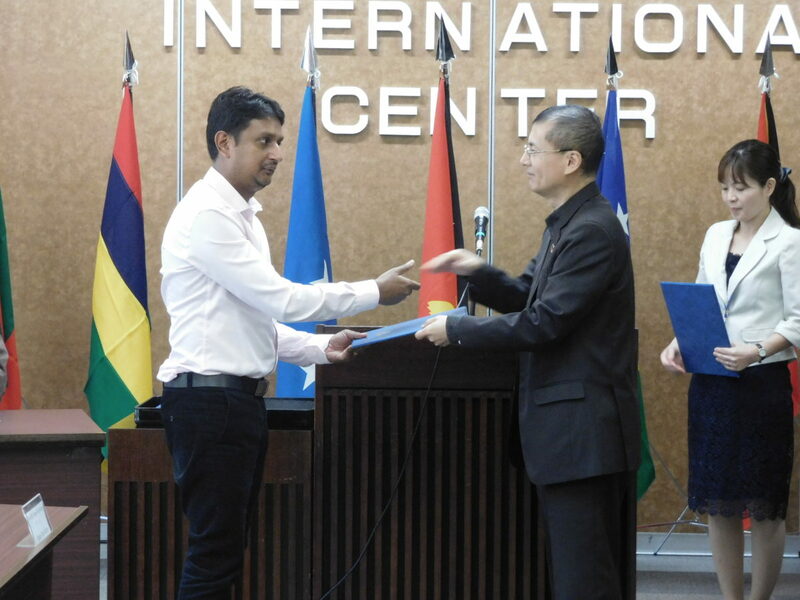 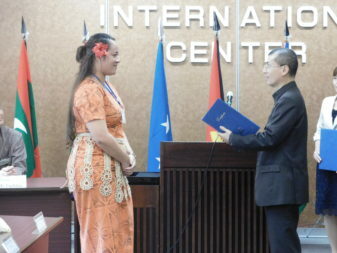 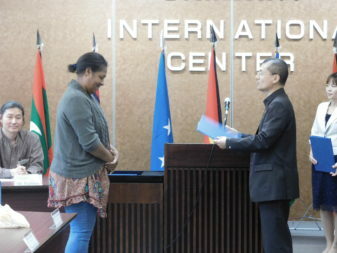 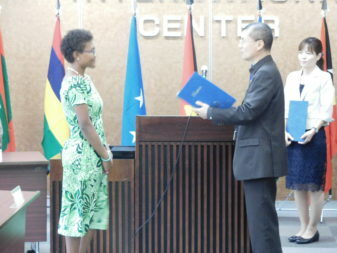 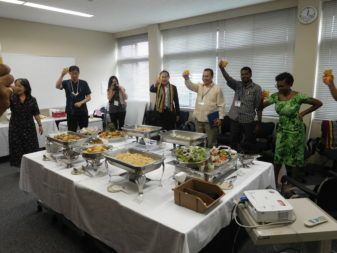 The Closing ceremony was held at 11:30, followed by farewell party. 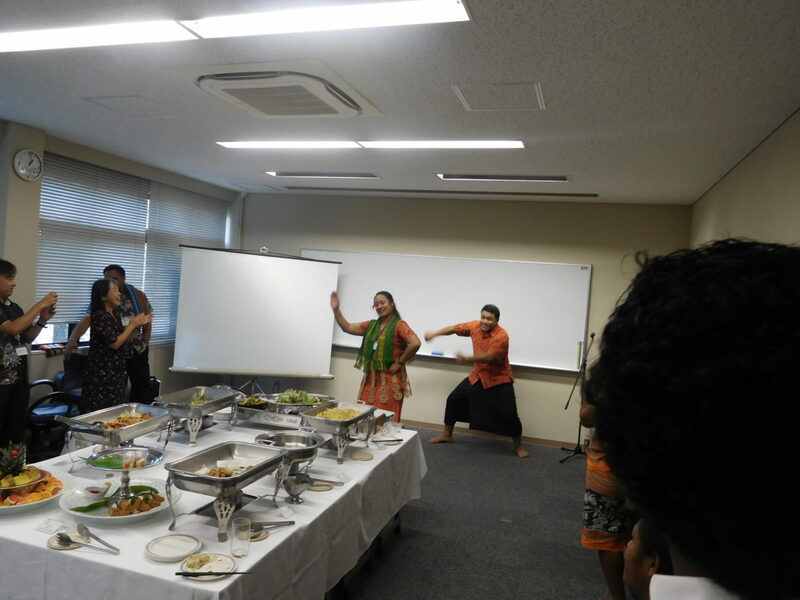 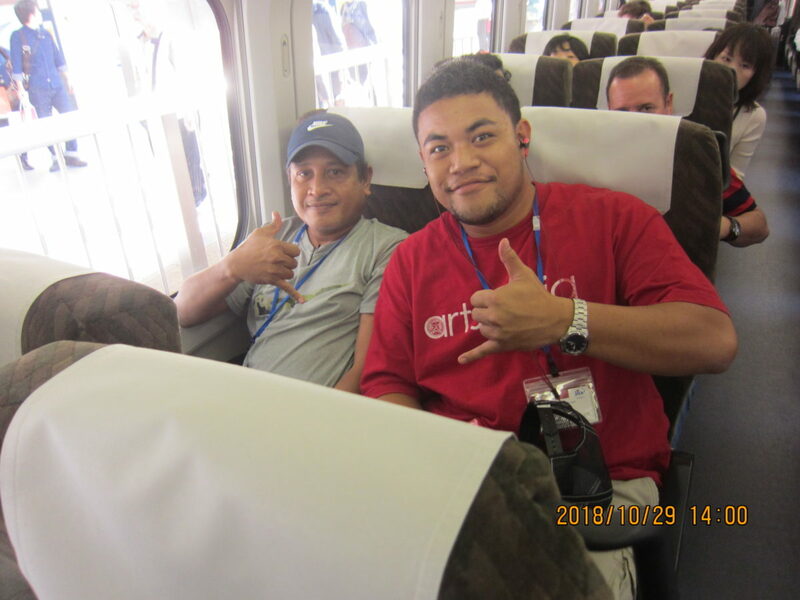 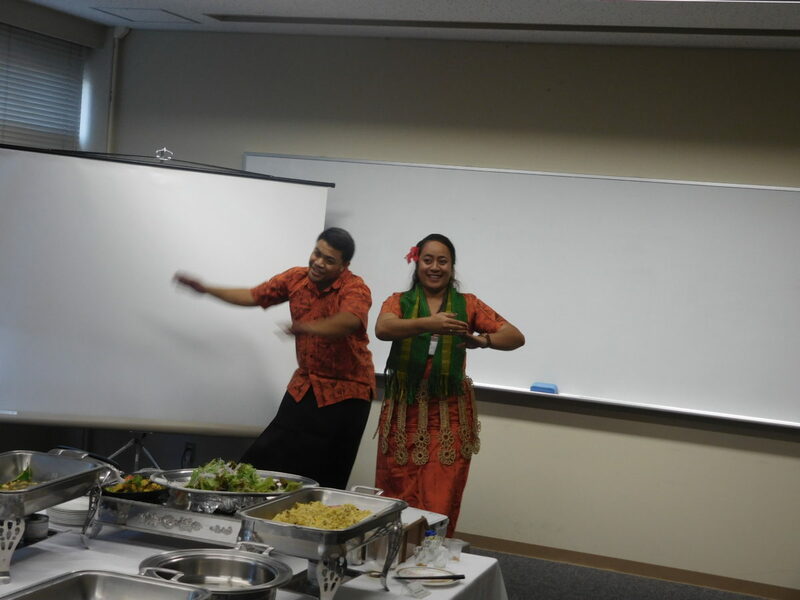 Everyone enjoyed the last memorable moments at the party while watching the slideshows created by JICA officer and Tongan dance by participants from Tonga. 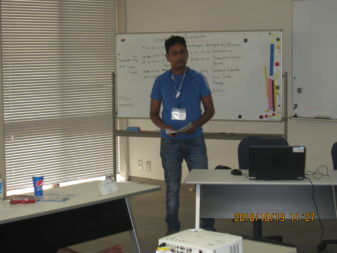 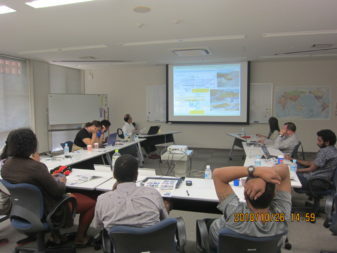 We spent two days for presentation of participants’ summary reports. They summarized what they have learnt during this training in the report and presented to audience. The audience who were invited to give comments and questions to the presentations were Hon. 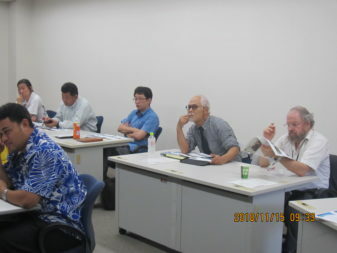 Prof. Yabuki (University of the Ryukyus), Prof. Aydan (University of the Ryukyus), Mr. Mochizuki (Senior Officer for Planning and Coordination at Okianwa General Bureau), Mr. Nishizato (Chief Engineer at Civil Engineering Dept., Okinawa Pref. Gov. 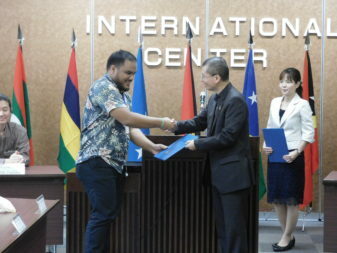 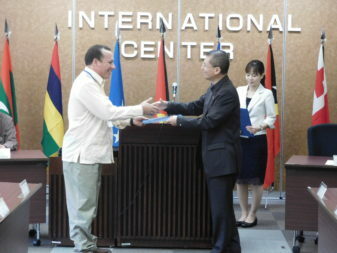 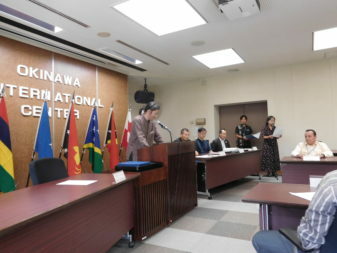 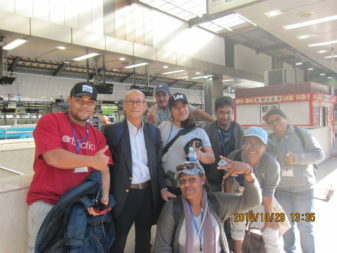 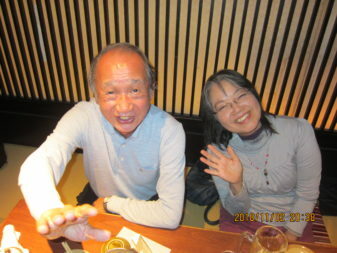 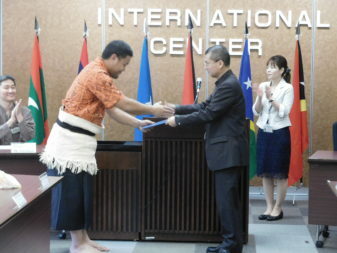 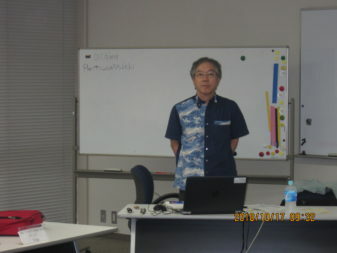 ), and Mr. Matsuda (Director of Planning Section, Okinawa Shimatate Association). 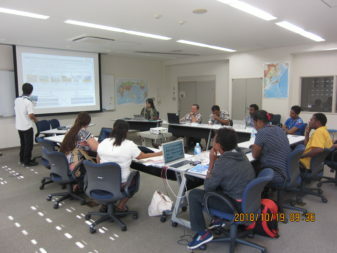 The reports also included the technical issues of each country and suggestions to this training which will be reflected to the future curriculum. 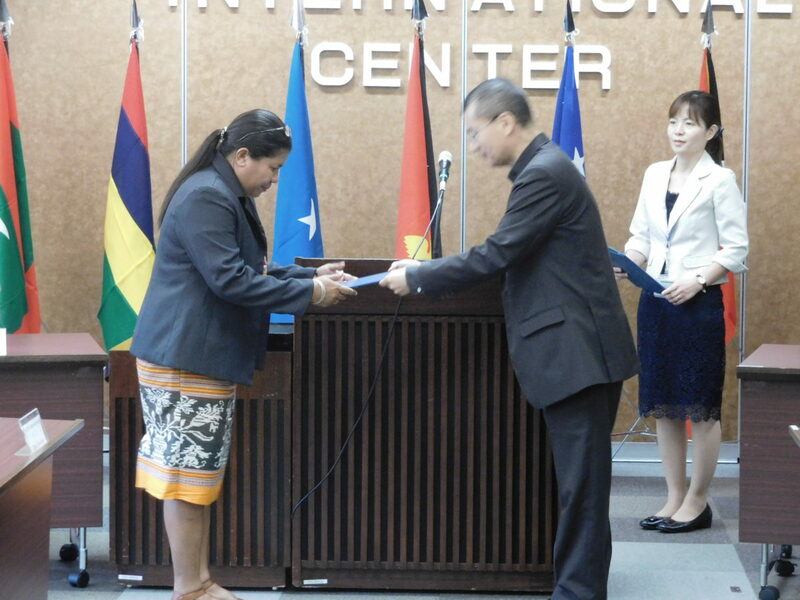 We found that the preventive measures, preparedness and response for disasters, e.g. earthquake, tsunami, and flood, were thecommon issue for many countries. 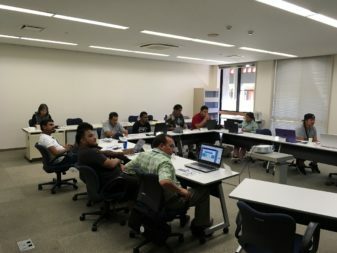 The group attended a lecture, “Road Engineering II”, given by Prof. Omar Aydan at a conference room of Integrated Innovation Center for Community Building. 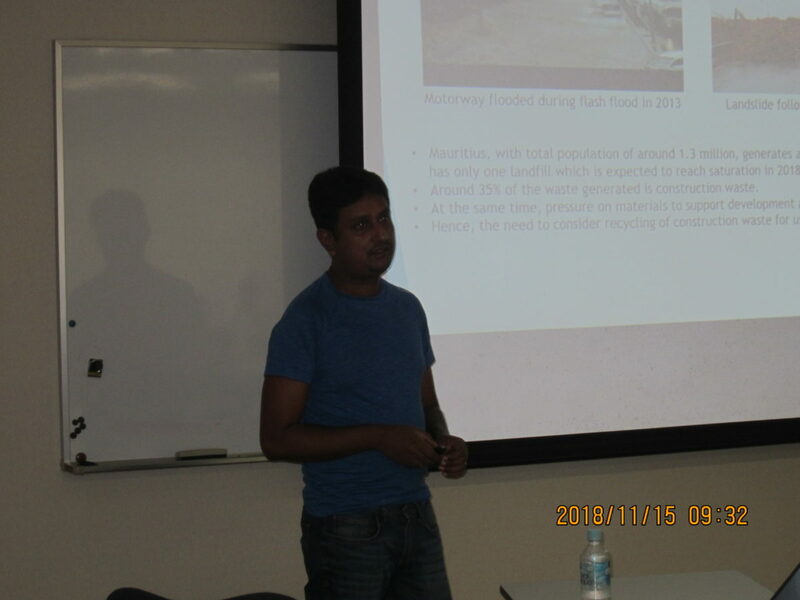 In his presentation, he showed many pictures illustrating damages to infrastructure (road, bridge, tunnel, slope, embankment) in Japan, in particular, and in the world. 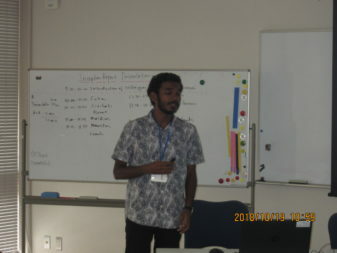 He introduced examples and elaborated on the issues in road maintenance, non-destructive tests, and new design techniques utilizing Finite Element Method and drone. 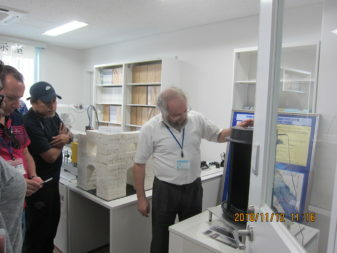 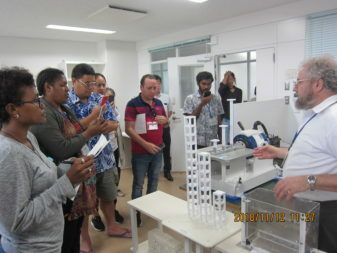 He then invited the group to his laboratory to show simulation tests of earthquake and tsunami. 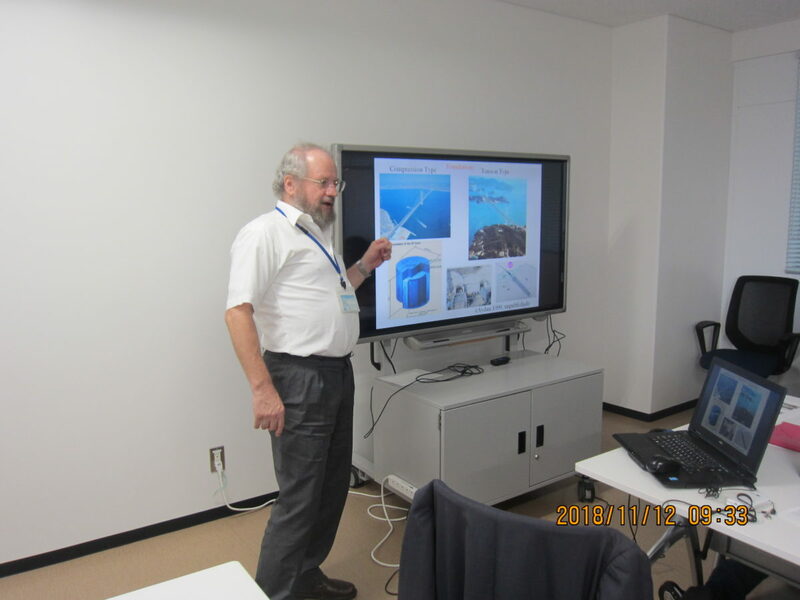 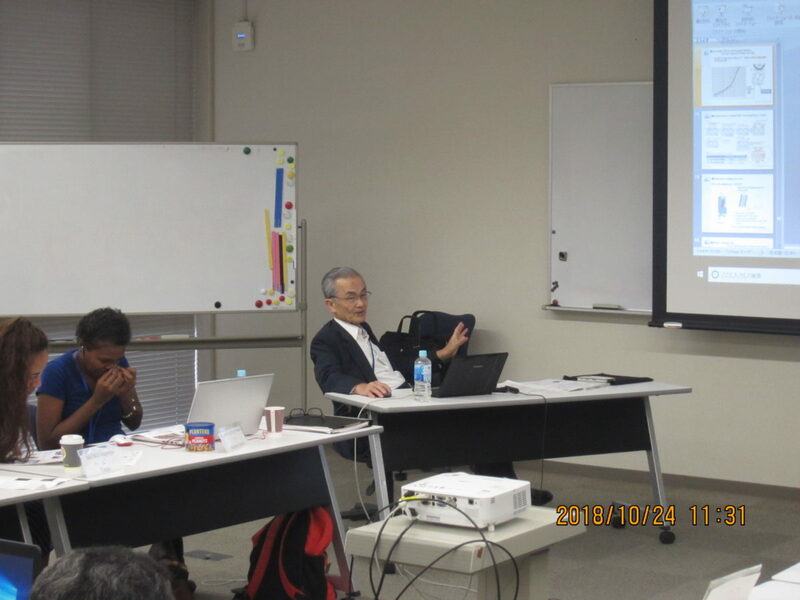 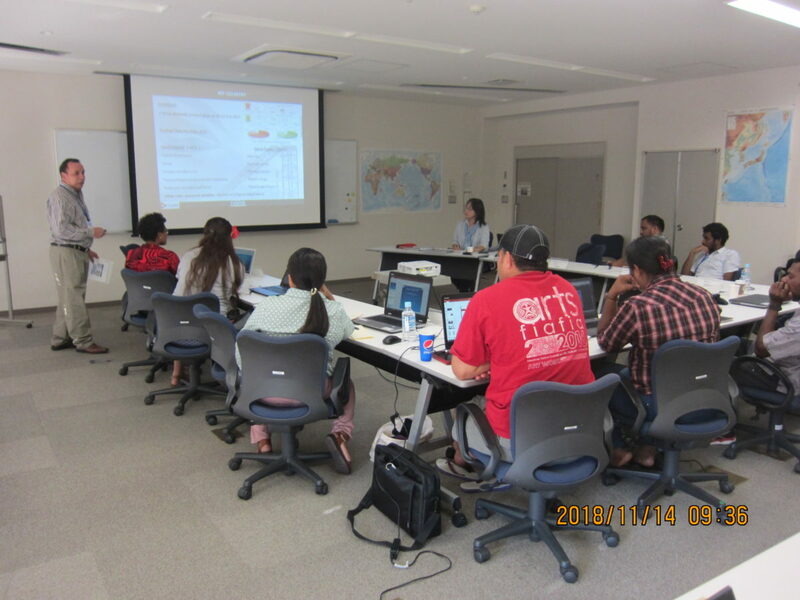 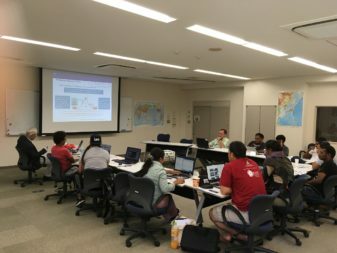 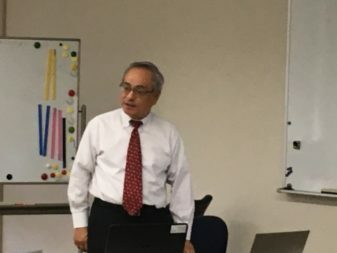 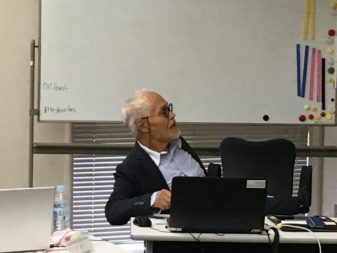 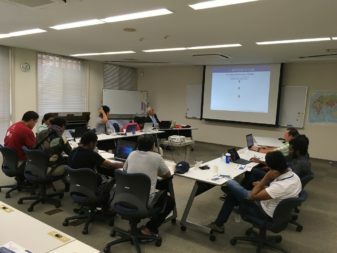 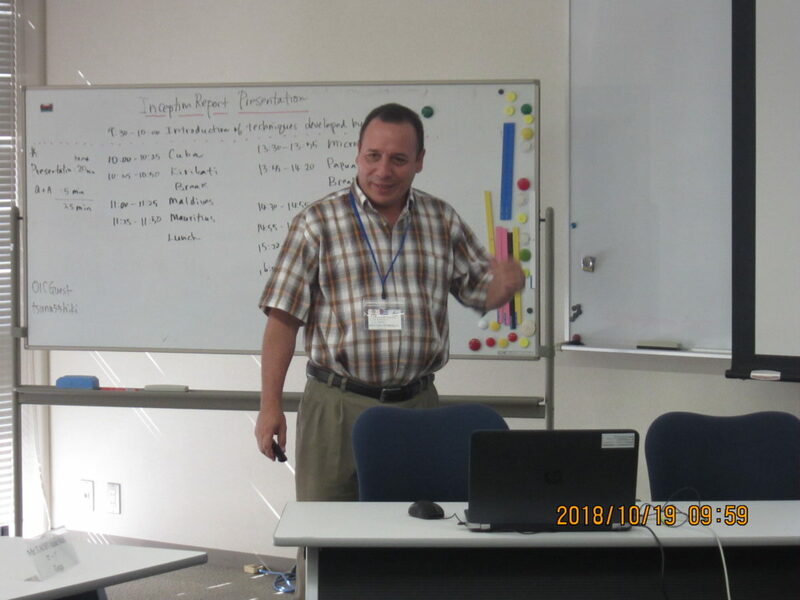 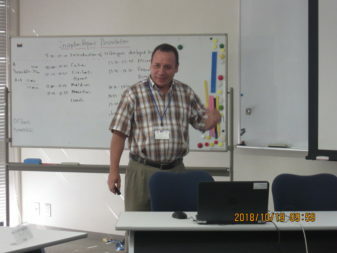 In the afternoon, Dr. Shimozato, Associate Professor, spoked about salt attack in Okinawa in his lecture at a conference room in Department of Engineering. 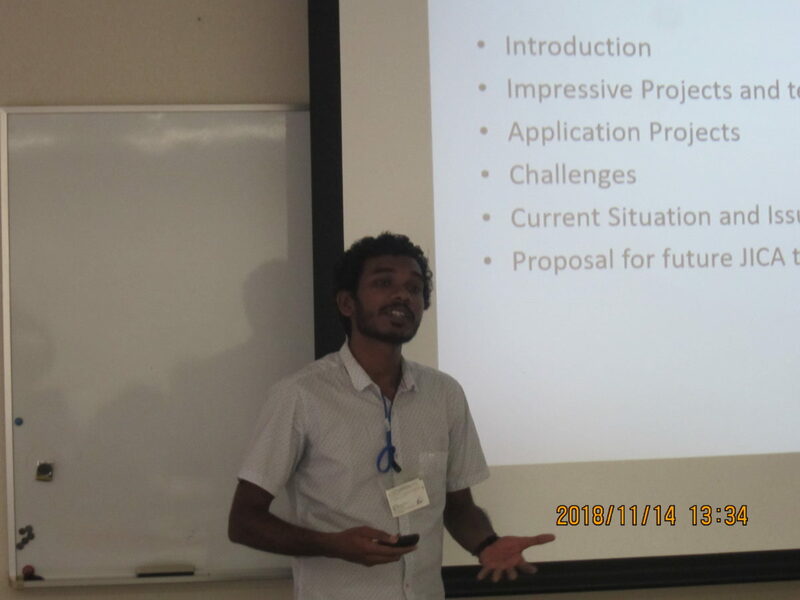 One of his graduate students from overseas presented about hist study on load test on bridge girders. 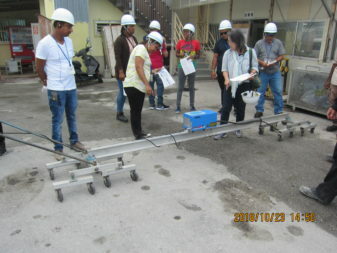 Then the faculties showed us their research equipment such as 100t load test machine and exposure test facility. 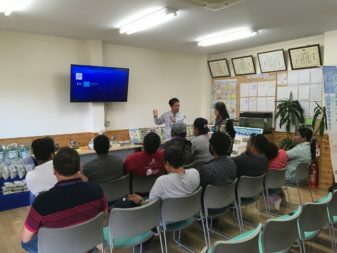 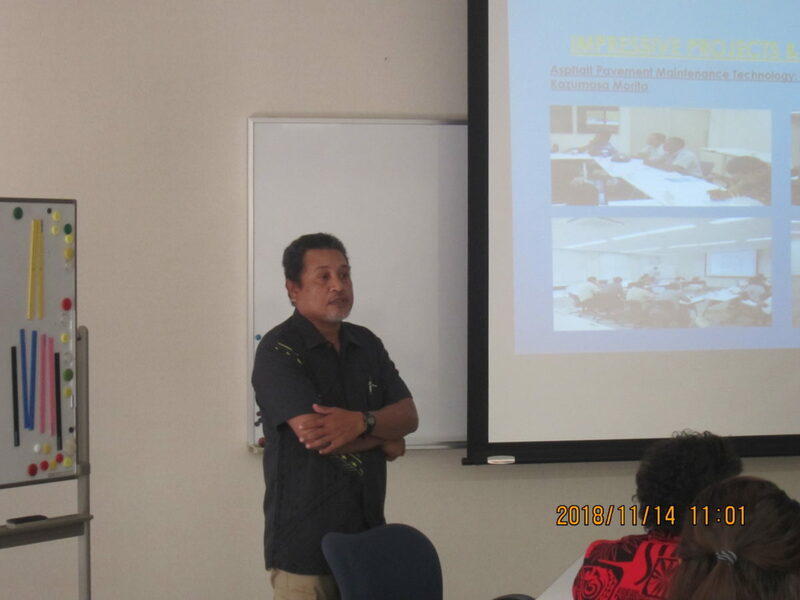 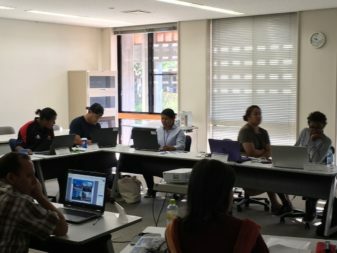 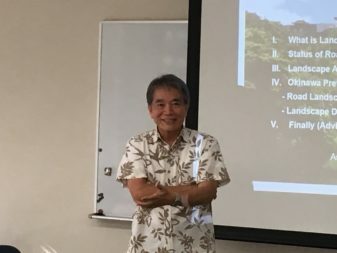 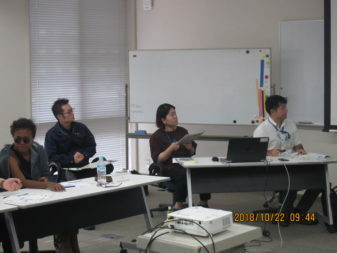 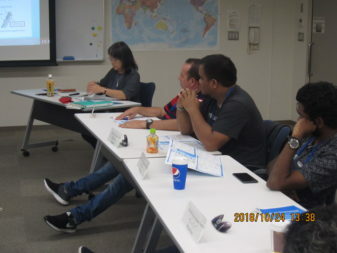 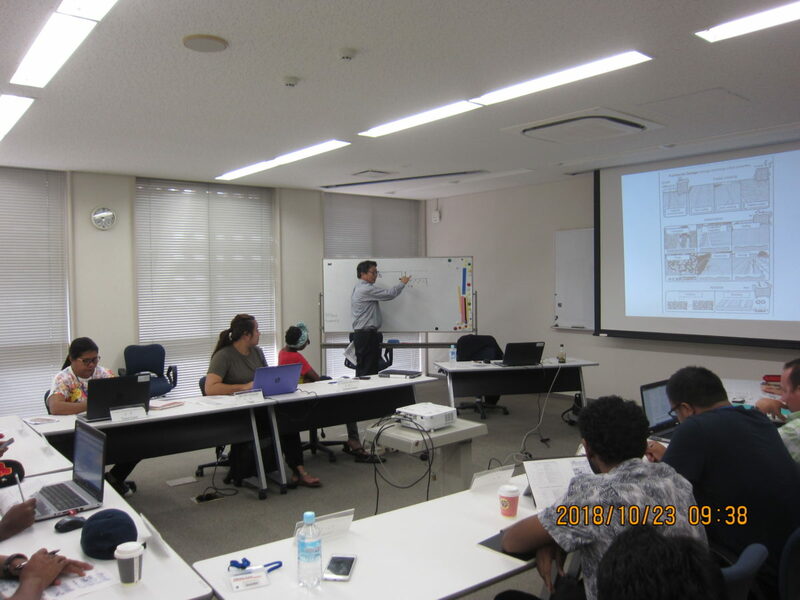 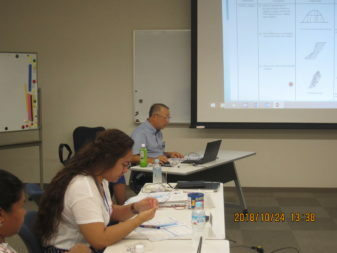 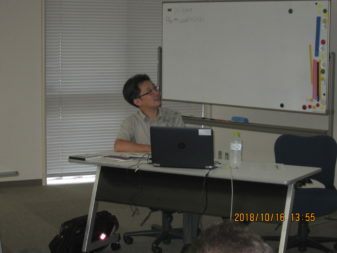 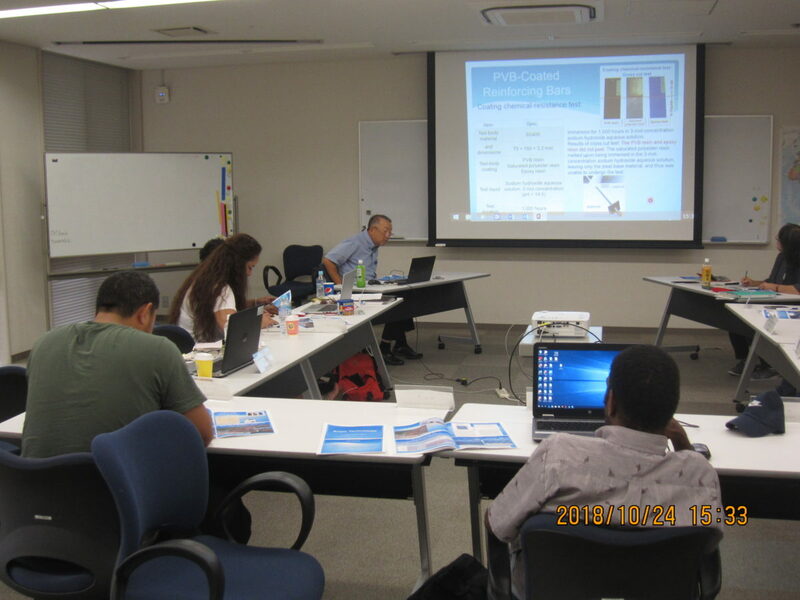 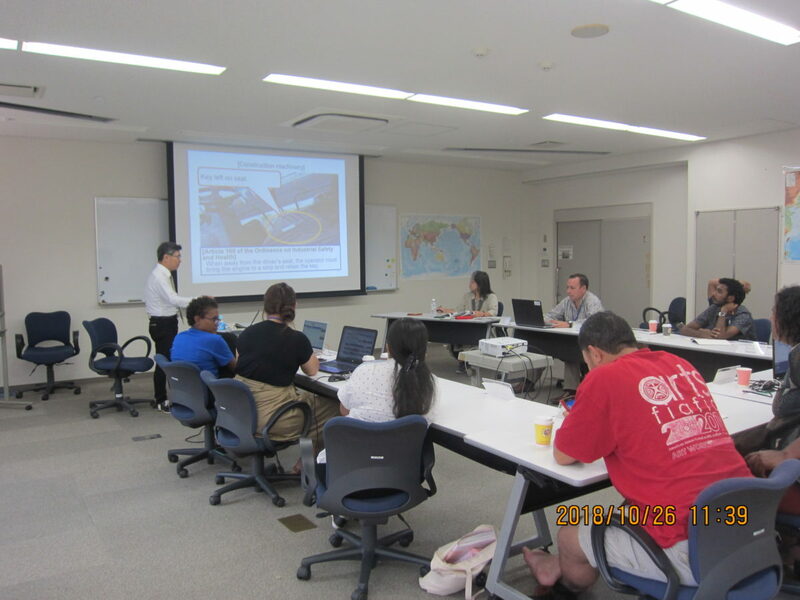 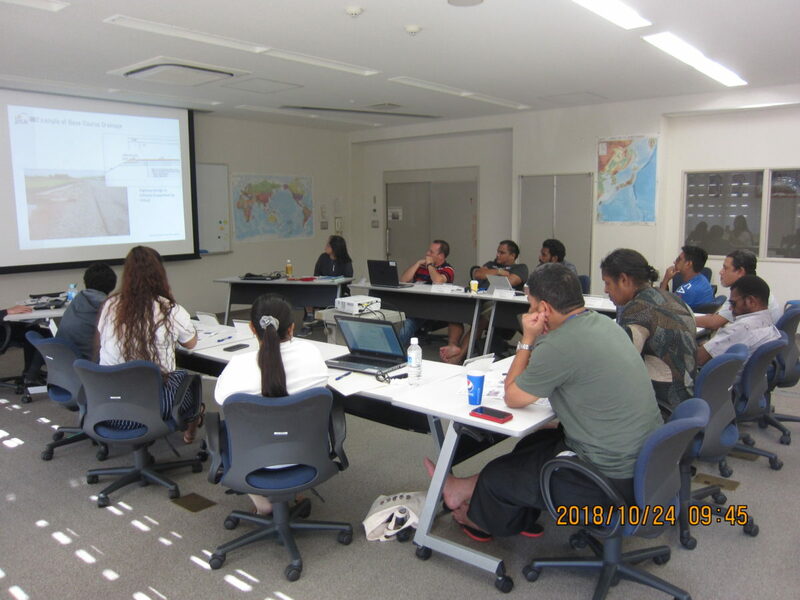 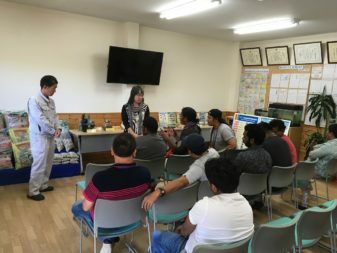 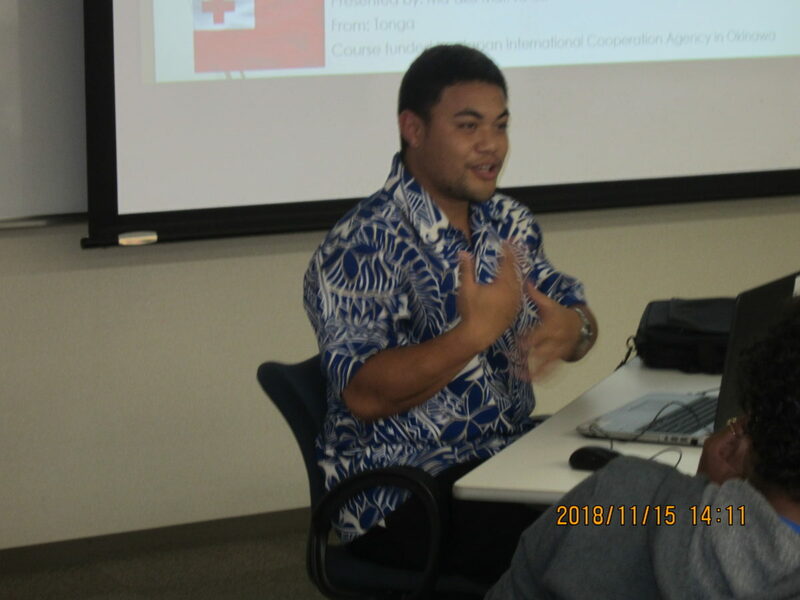 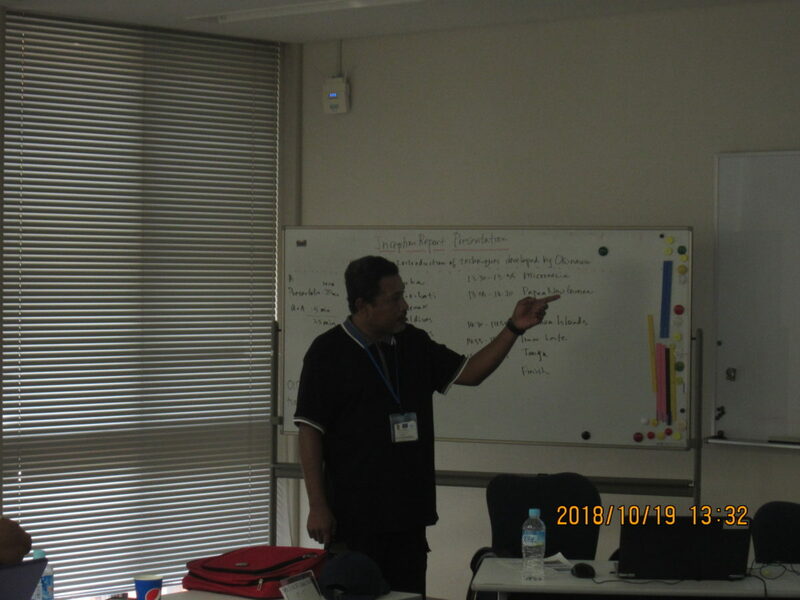 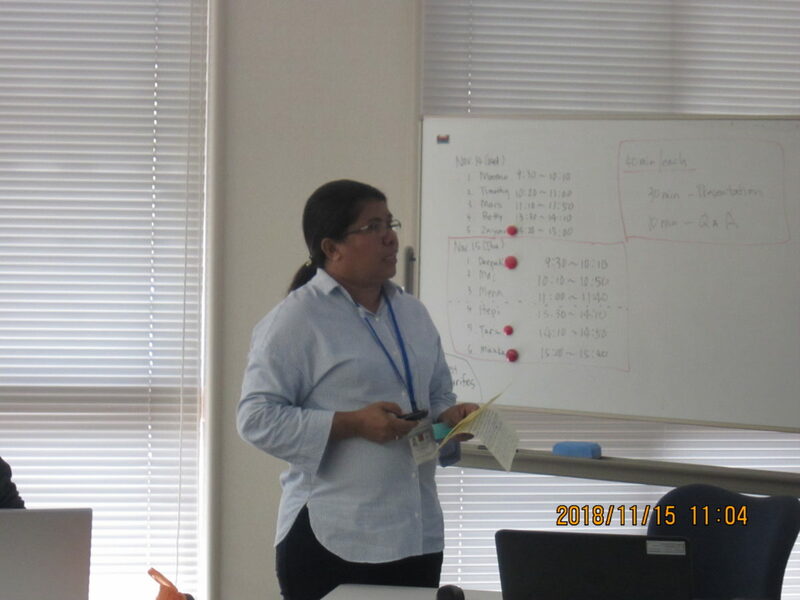 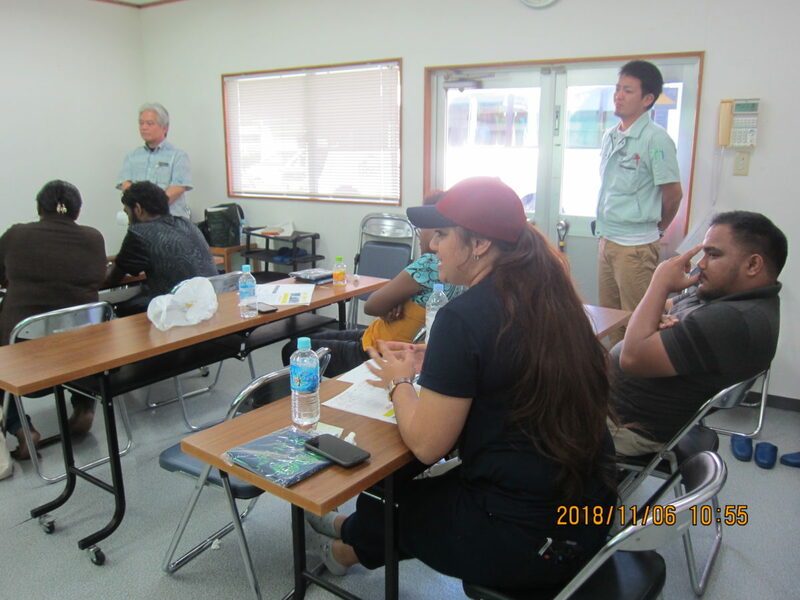 In the morning, the group had a lecture titled “Road Landscape in Okinawa” delivered by Mr. Ken Kohagura, a counselor at Asahi Construction Consultant Co. Ltd. 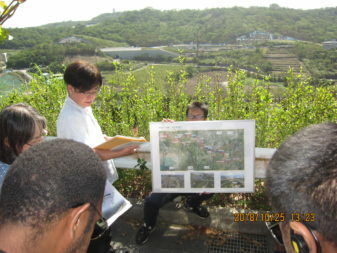 He pointed out problems with road landscape design in Okinawa and elaborated on new strategies showing actual examples. Participants asked many questions about the maintenance and management of street plants. 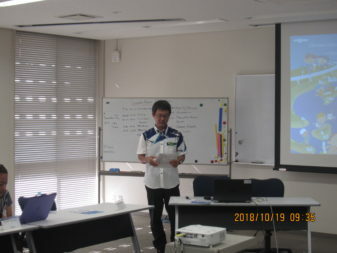 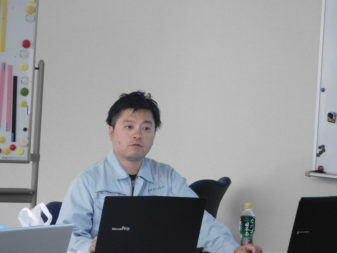 The lecture in the afternoon, Mr. Nishikawa, Representative Director of NDC Co., Ltd., gave a lecture on “Introduction and construction of NATM”. Given that many of the participants’ had never been faced with the need of tunnel construction, to explain about the design and execution of mountain tunnel construction, he chose to illustrate the basics of tunnel construction by showing video and animation so that the participants would find it easy to understand. In the morning, the group visited Trim Co. Ltd., a waste glass recycling plant. 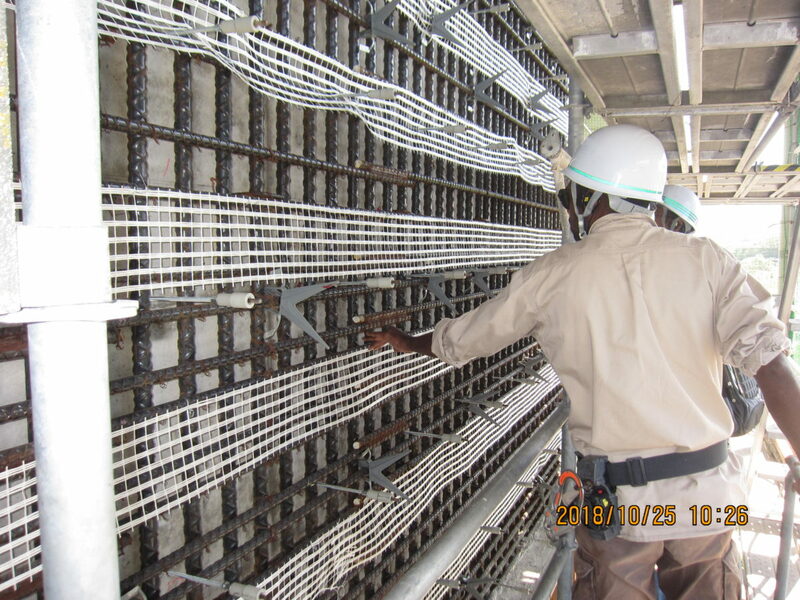 This company produces Super Sol, multi porous light-weighted formed material. 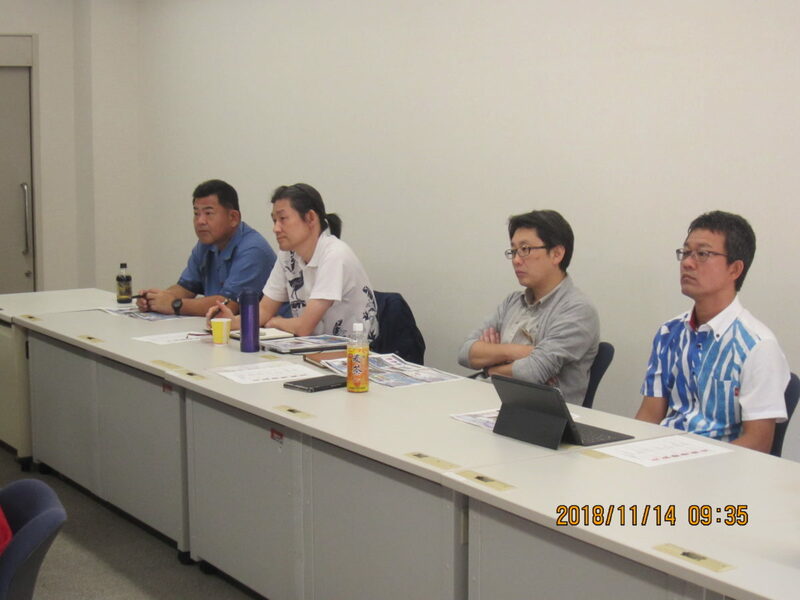 From the company’s promotional video and explanation given by Mr. Kawai, Sales Promotion Section, we learned about the characteristics and usage of Super Sol. Then we were escorted to the interior of the plant to study the specifics of production procedure. 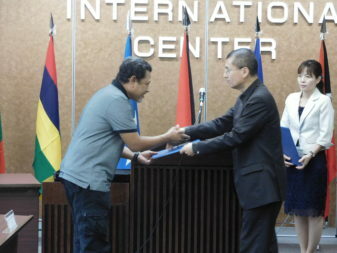 Participants were owed with the company’s successful business strategy and with their highly distinctive manufacturing techniques. 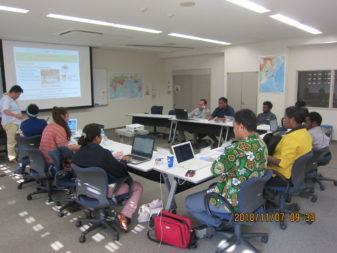 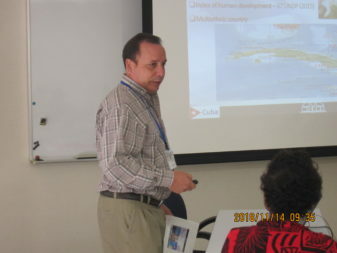 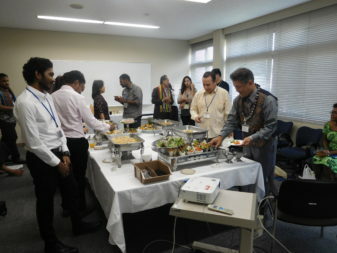 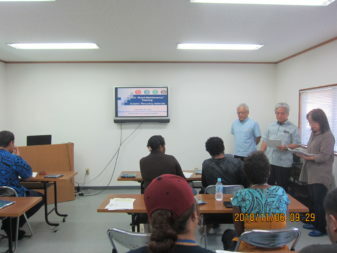 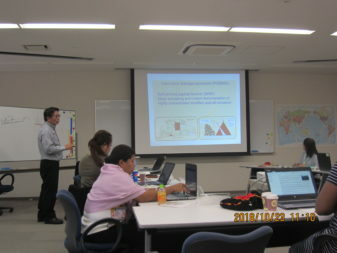 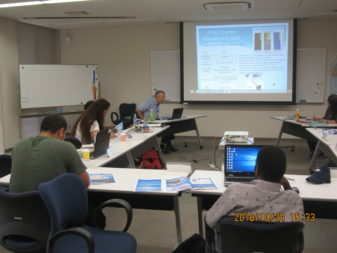 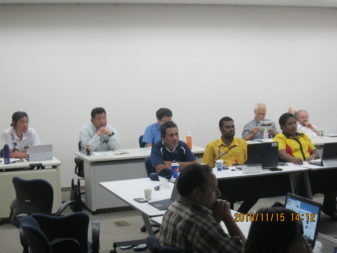 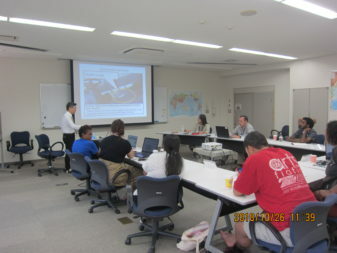 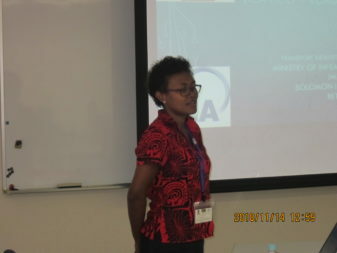 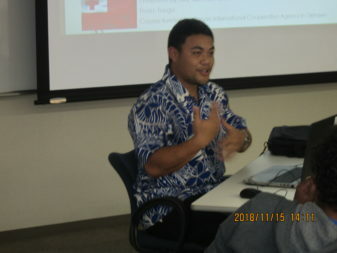 In the afternoon, participants joined a lecture given by Prof. Yabuki, Emiretus Professor at University of the Ryukyus. 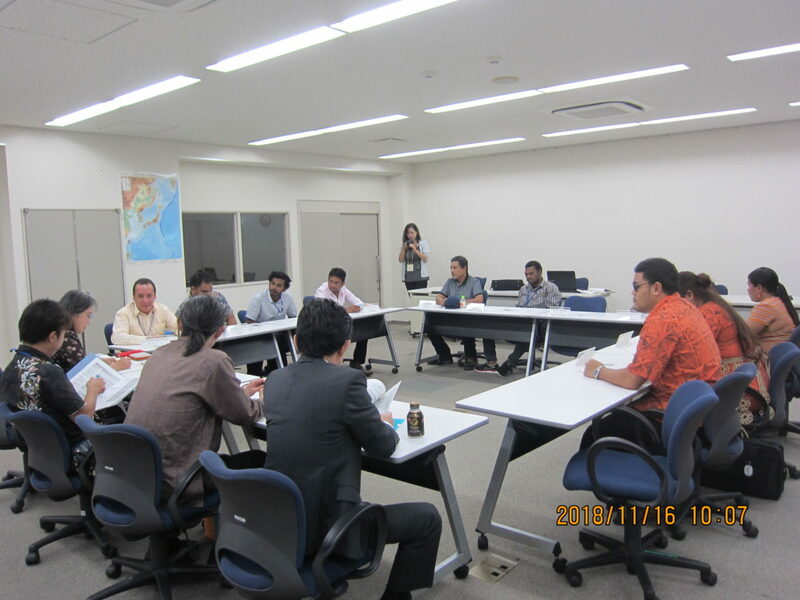 He discussed on maintenance engineering of steel bridge (countermeasures against corrosion ofsteel bridge). 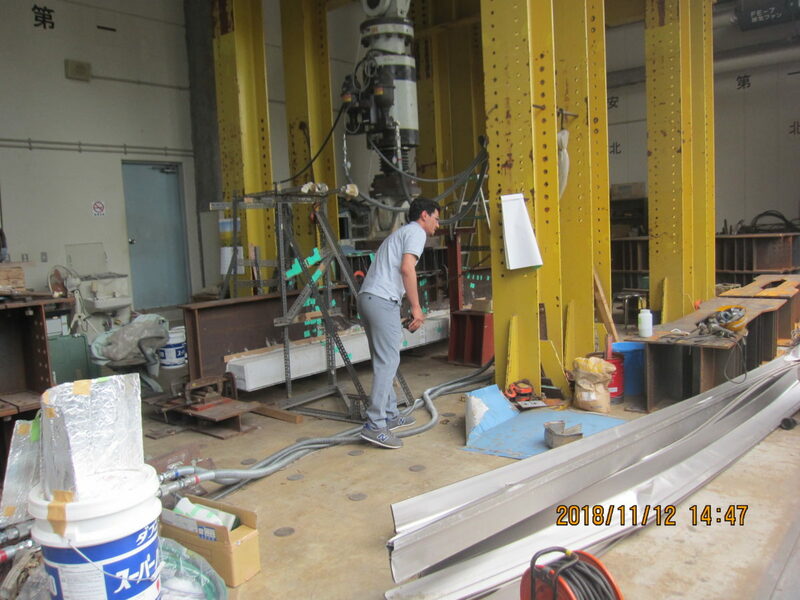 He elaborated on the environment which causes steel bridge to corrode, and its mechanism based on verified data. 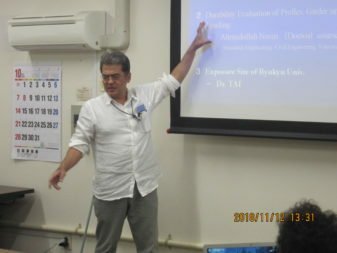 He explained that Okinawa is the most suitable site for experiment for verification as its natural environmentis harsh on steel bridge more than other places in Japan. 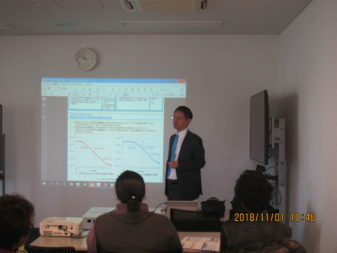 He showed various anti-corrosive measures and important points in maintenance and inspection, developed based on the knowledge relating to corrosion. 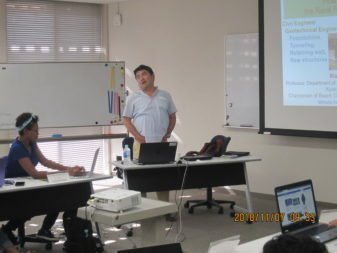 The lecture in the morning was given by Prof. Kimura of Graduate School of Kyoto University on “How to Maintain the Rural Road by Ourselves”. He shared his experiences and achievements of NGO activities, developed under his leadership, in many countries especially in Africa. 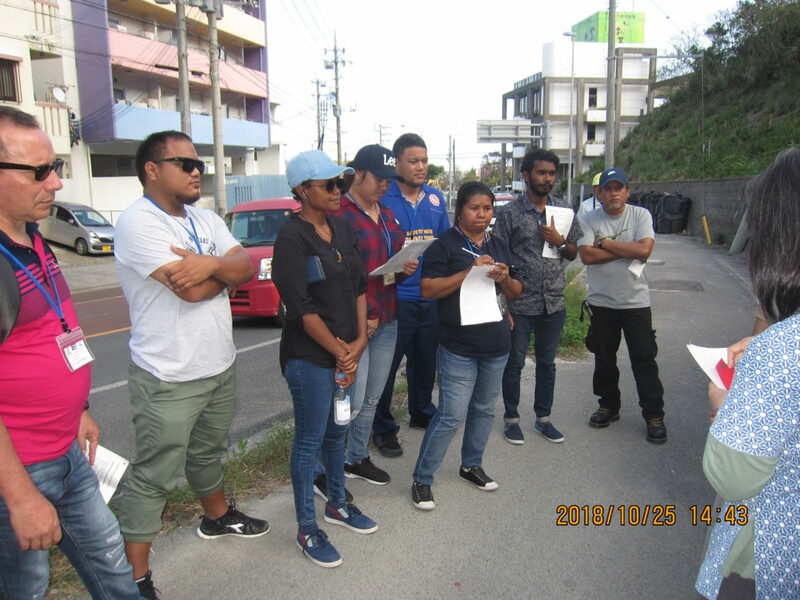 He emphasized the effectiveness of use of “do-nou” to maintain unpaved roads of rural areas. 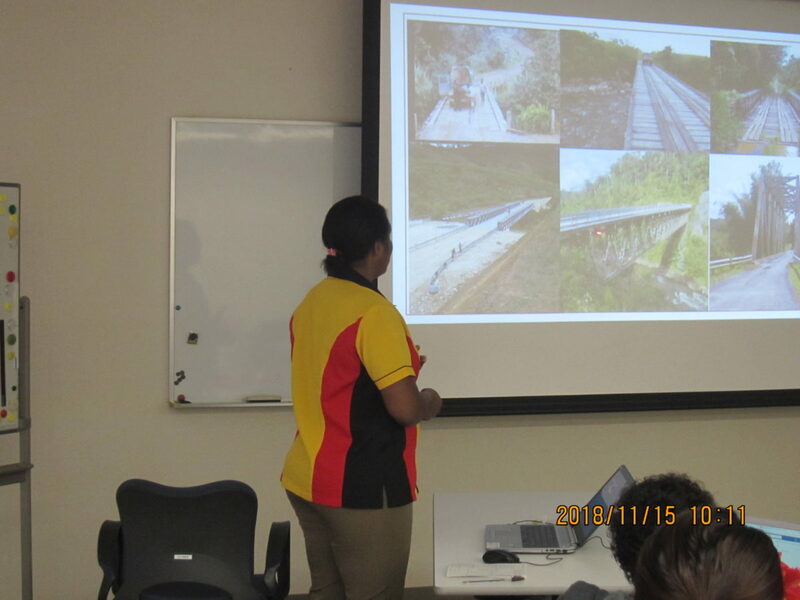 He also stressed on the importance of road among different infrastructures by giving actual overseas examples, showing video. His talk with good sense of humor attracted participants’ attention throughout the lecture. 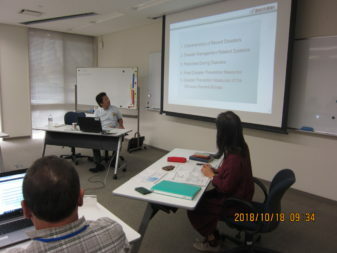 In the afternoon, Mr. Yoshihiko Ueno,Director of Construction Technology of Toyama City gave a lecture on “Bridge Management”. He discussed that Japanese social trend has been shifted from “age of infrastructure construction” to “age of maintenance and management” and stressed on the importance of maintenance and management skills (skill of making decision) of structure manager. He also emphasized the significance of “human resource development in public, academic, and public sectors” as Japan faces the issue of aging of structures. “The only source of knowledge is experience” said by Albert Einstein. 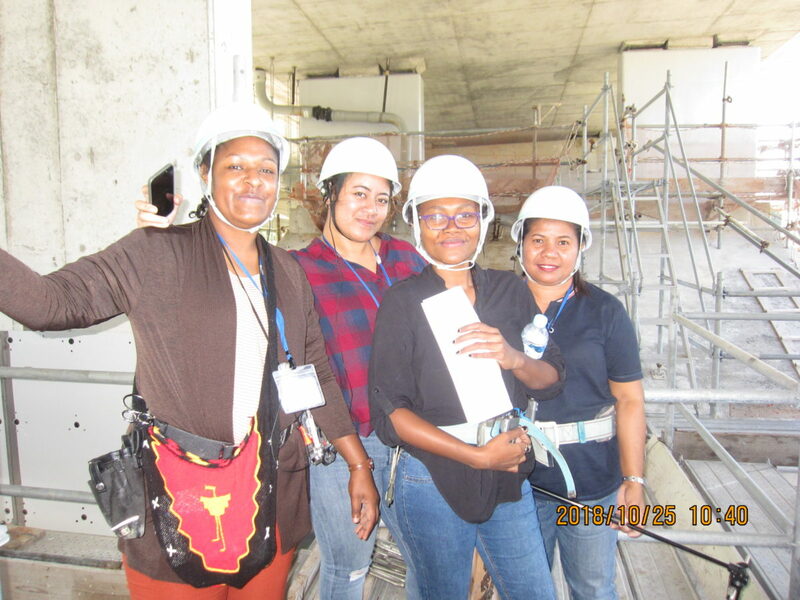 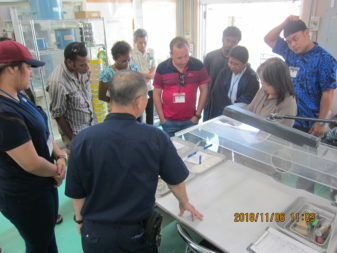 The group visited Okinawa Prefectural Center of Construction Technology in the morning. 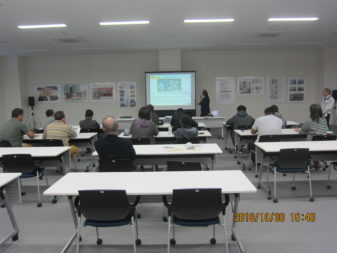 There, two lectures were given, “Recycling Materials” and “Paving Material Test”. 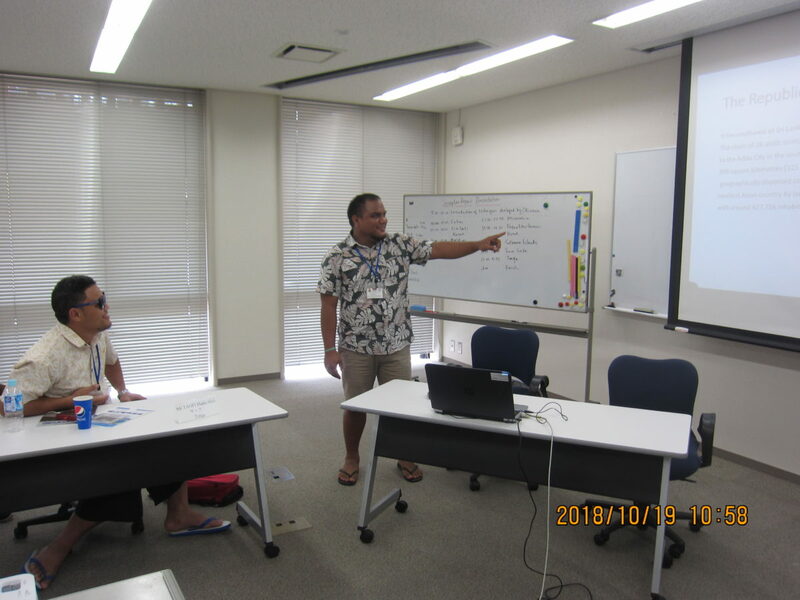 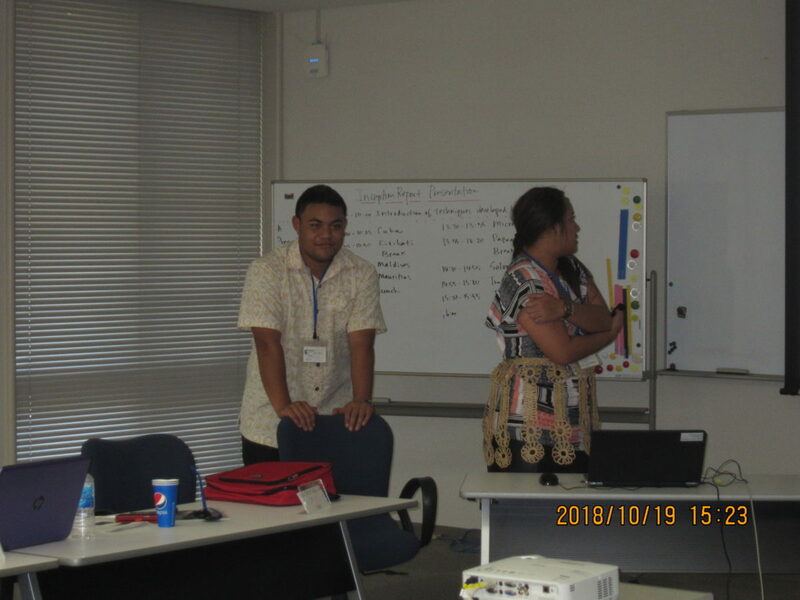 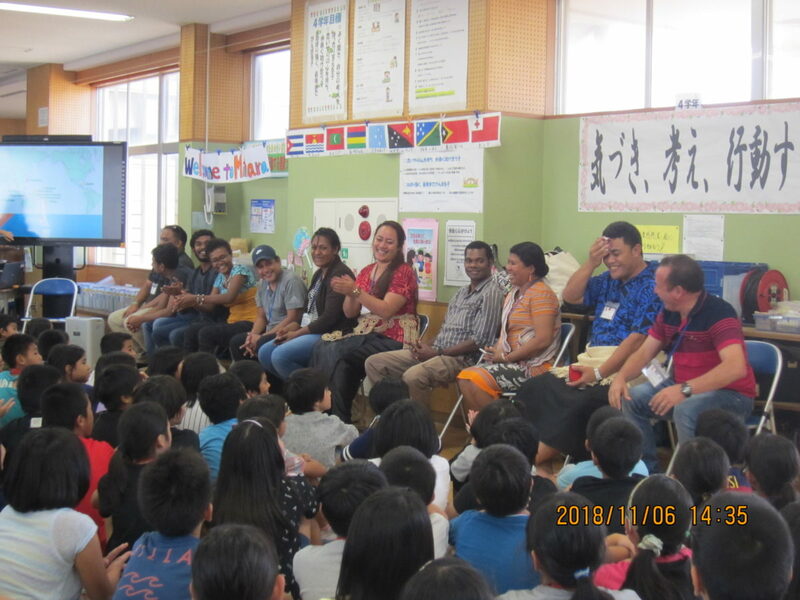 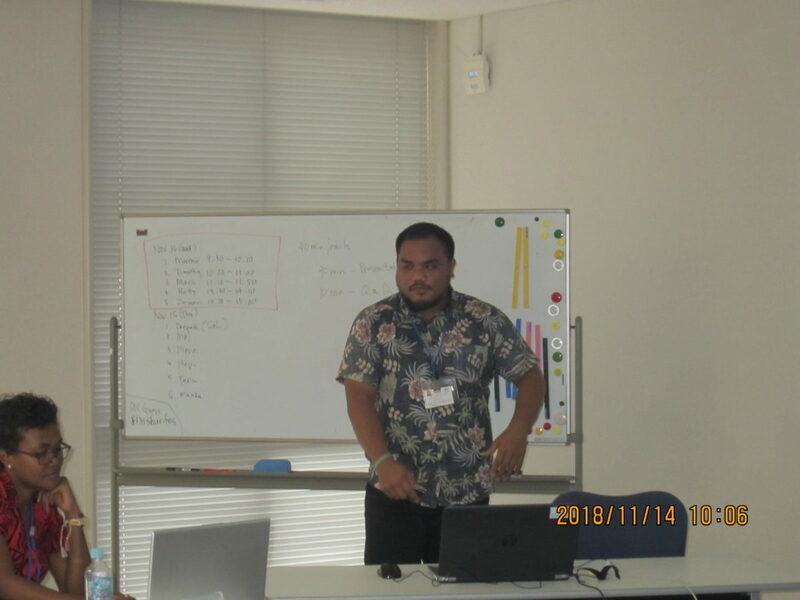 Participants developed interest in the tests as the explanation given by Mr. Akamine was in detail and easy to understand, and asked questions. 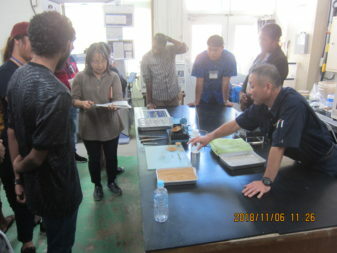 They showed interest in recycled materials as well and asked many questions such as the usage of the recycled materials and the prices. 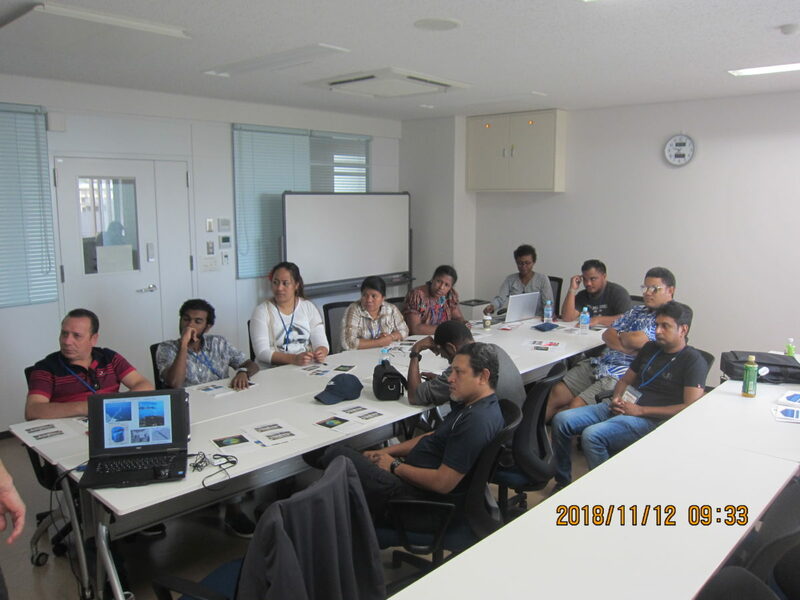 The topic given today was “3D-CAD and Drone” instructed by Mr. Suzuki, Mr. Miyara, and Mr. Miyagi from Okabe Maintenance Co. Ltd. 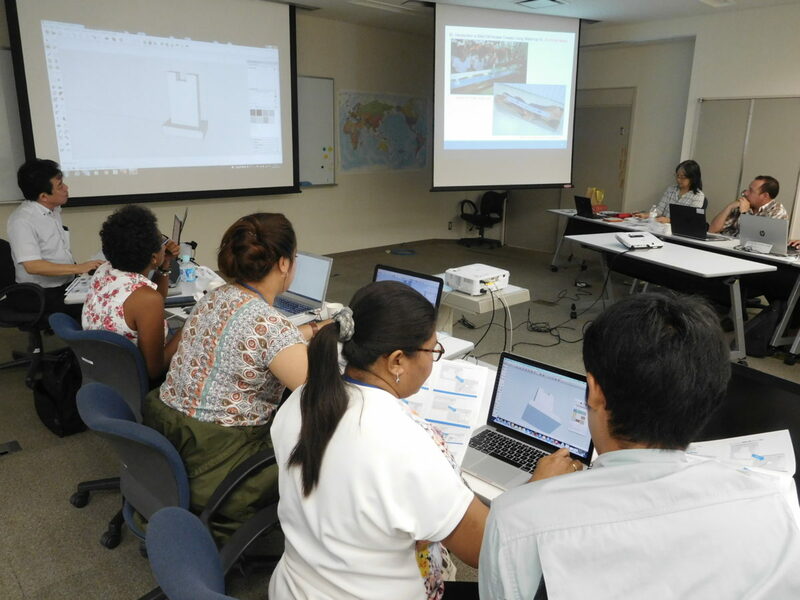 Participants practiced making 3D modeling using SketchUp, a 3D design software, in the morning. 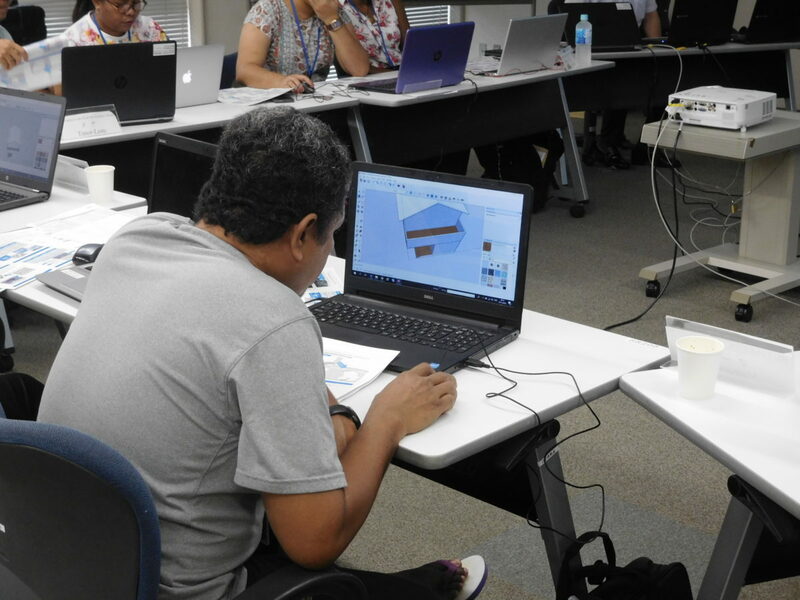 They installed the software to their PCs and did practical modeling of a house and bridge pier. 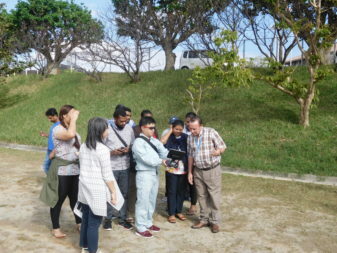 In the afternoon, after covering the outline of 3D geological survey with aerial photo taken by drone and some matters that required attention for operating drone, each participant had an experience of flying drone at OIC playground. 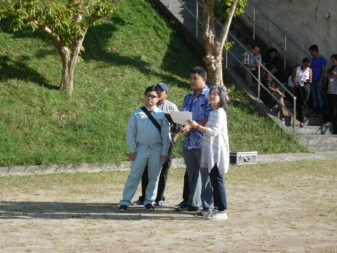 In classroom, they checked the aerial photos, movie taking by drone, and 3D models. 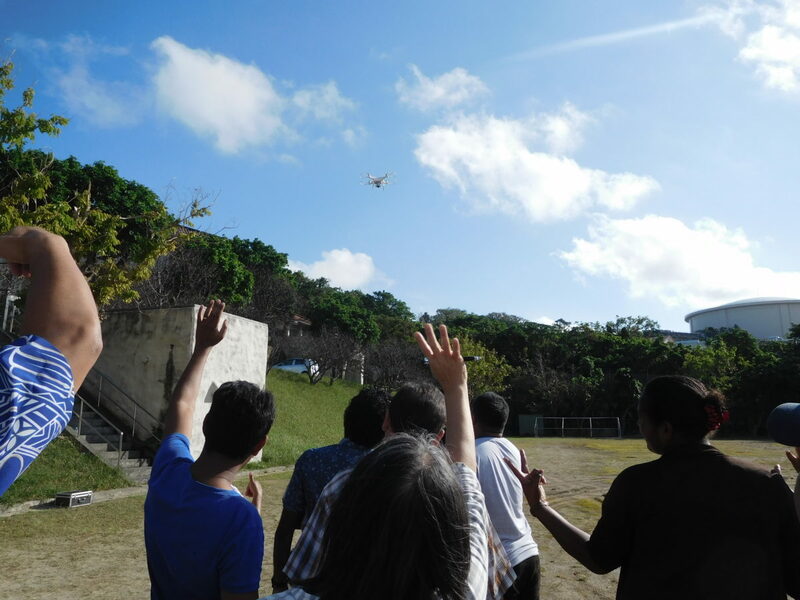 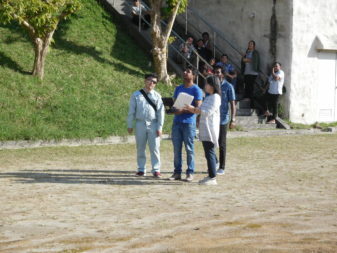 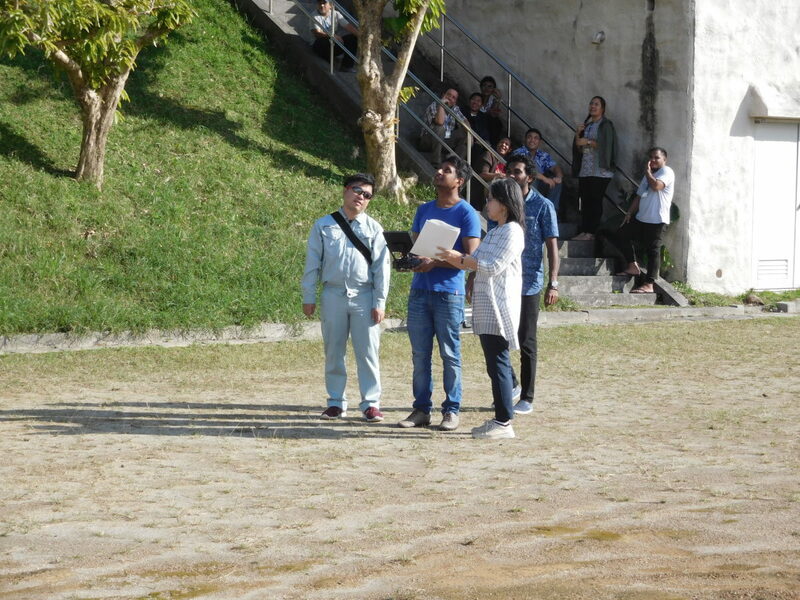 Participants became well aware of the significance of survey with use of drone. 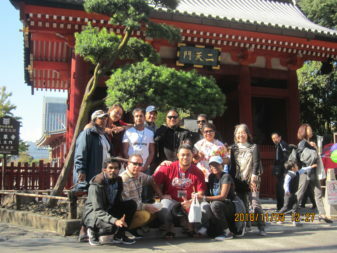 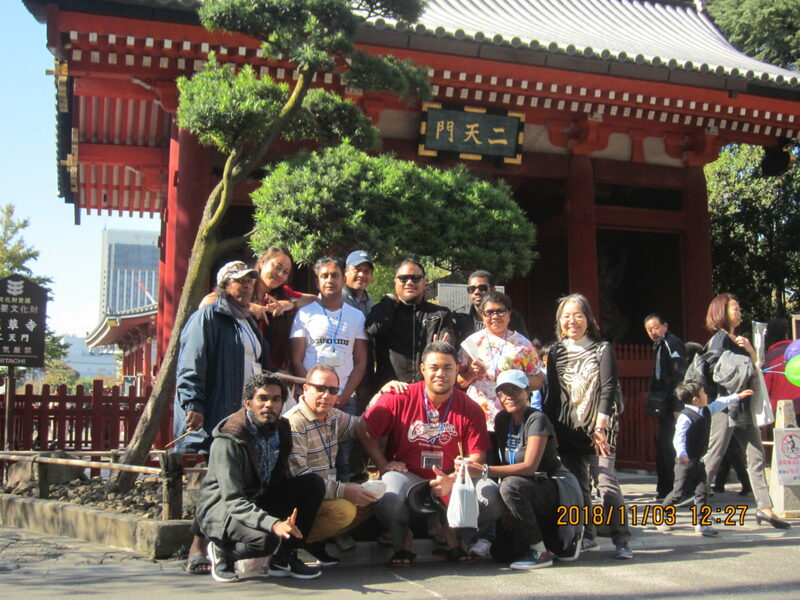 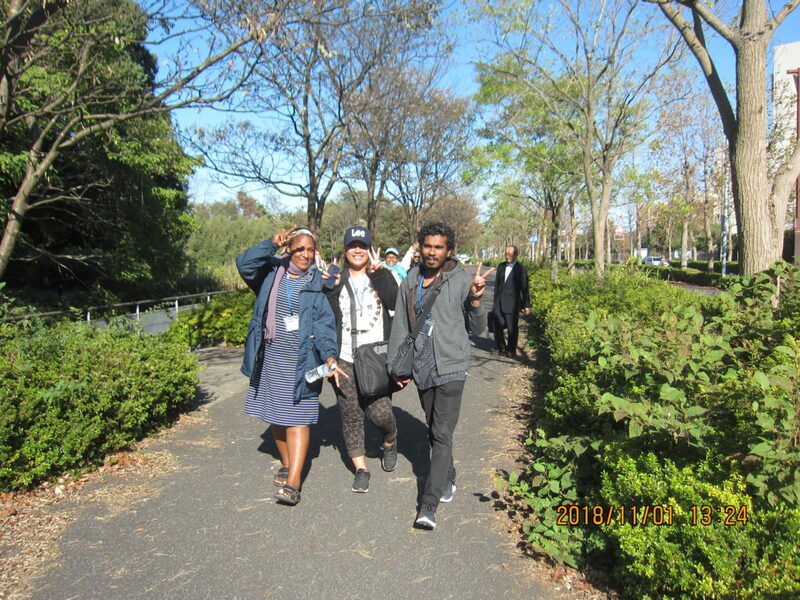 Last day in Tokyo, the group observed Asakusa area to study community road where visitors can appreciate its history, tradition, art and culture. 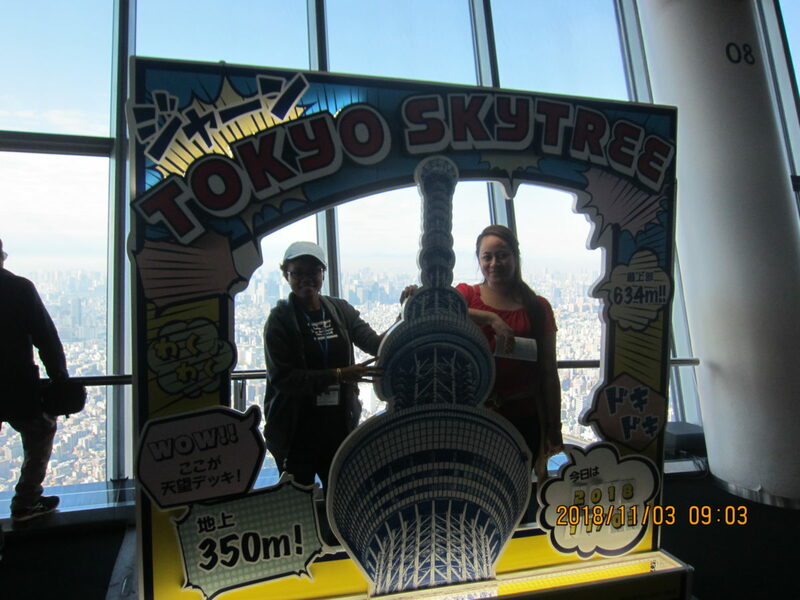 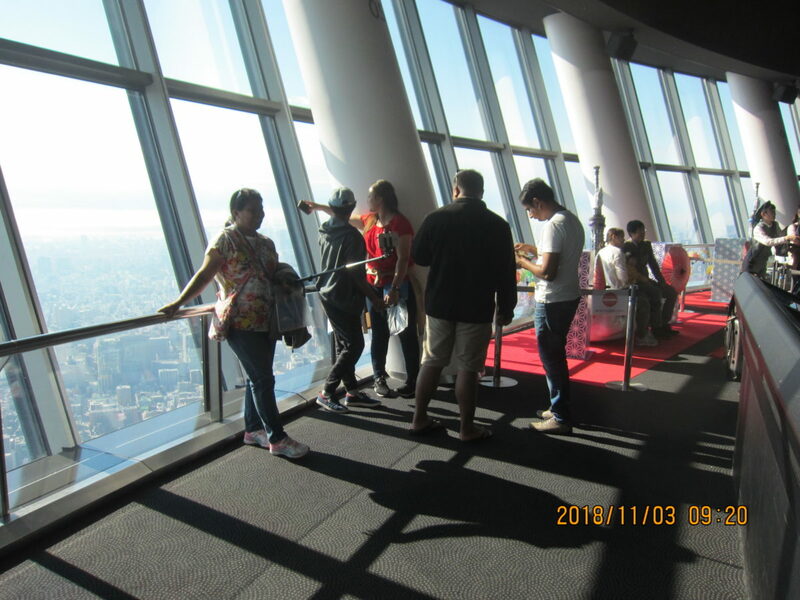 We first went up to the observatory of Tokyo Sky Tree tower, 350m from sea level, to observe streets in Tokyo near and far from the tower and beautiful sceneries of Japan. 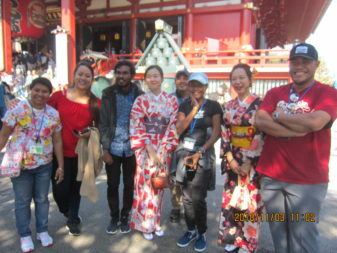 Then we walked through Rokku- Kogyogai and Sensoji Temple, enjoying different cultural features contained in the downtown Tokyo. 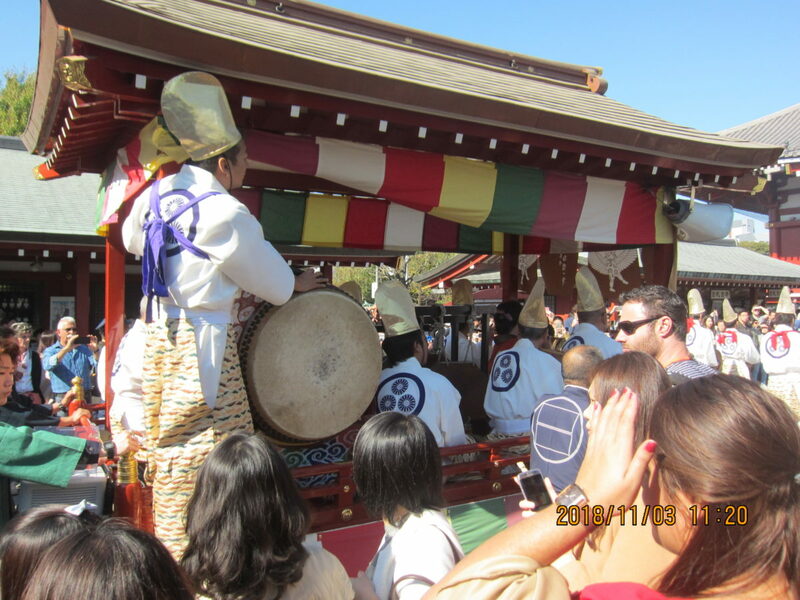 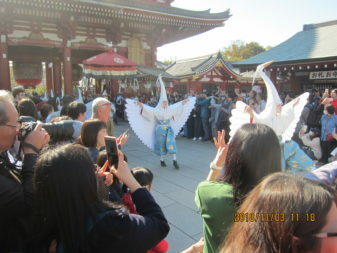 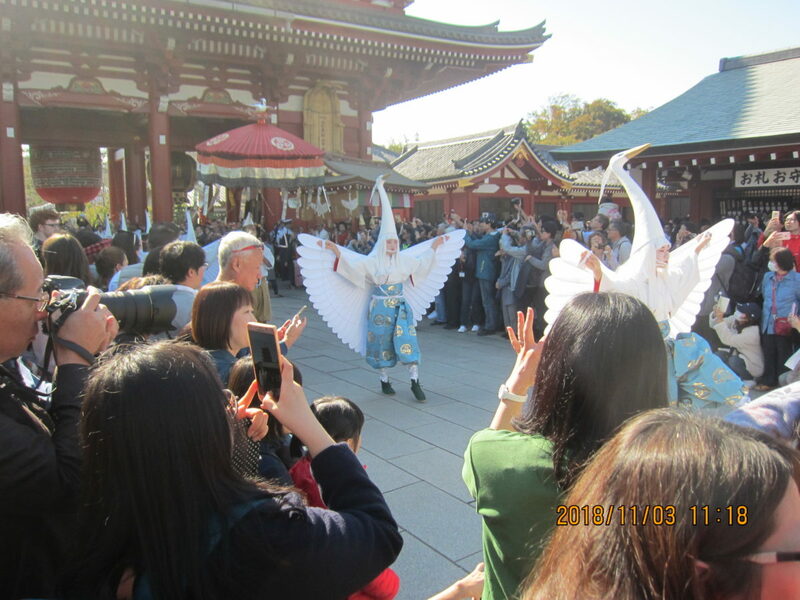 To our surprise, we had a wonderful encounter of a special parade of “Shirasaki-no-mai” (Dances of White Heron). 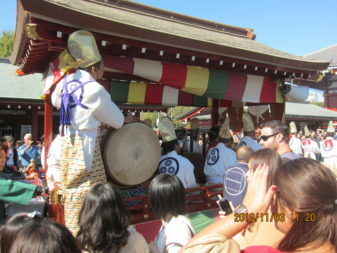 We gazed in the performance, feeling as if we looked at an old painting. 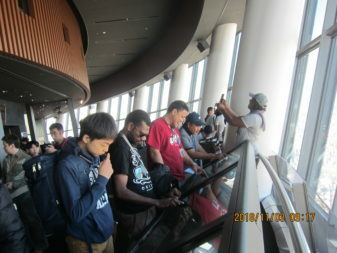 The whole schedule of Tokyo tour was tight but we arrived to its end. 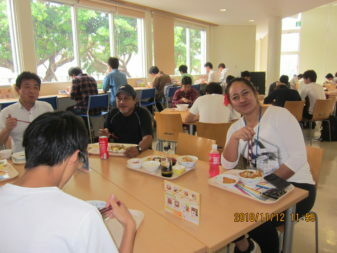 We landed in Naha before 7pm. 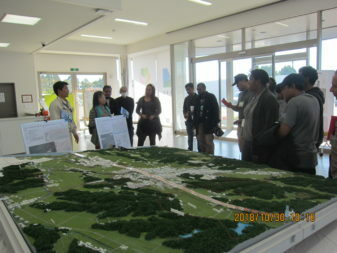 We visited National Institute for Land and Infrastructure Management (NILIM) and Public Works Research Institute (PWRI) in the morning. 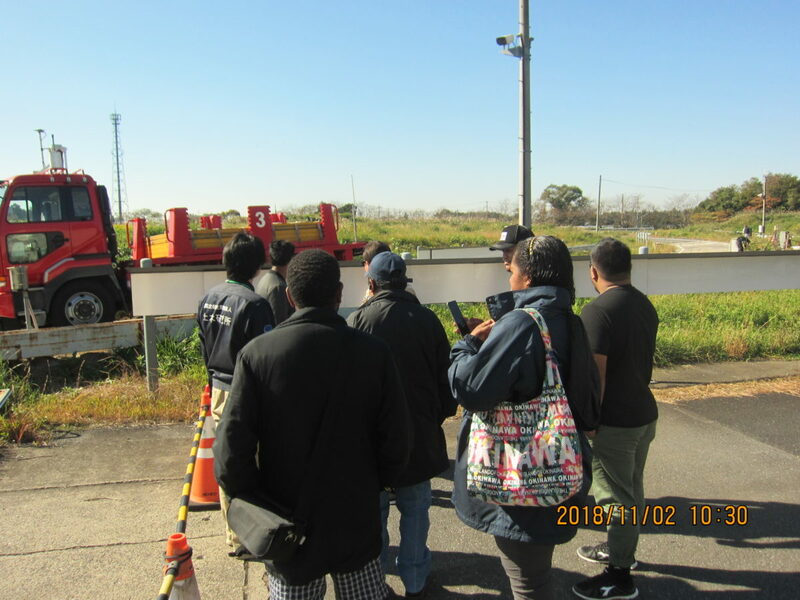 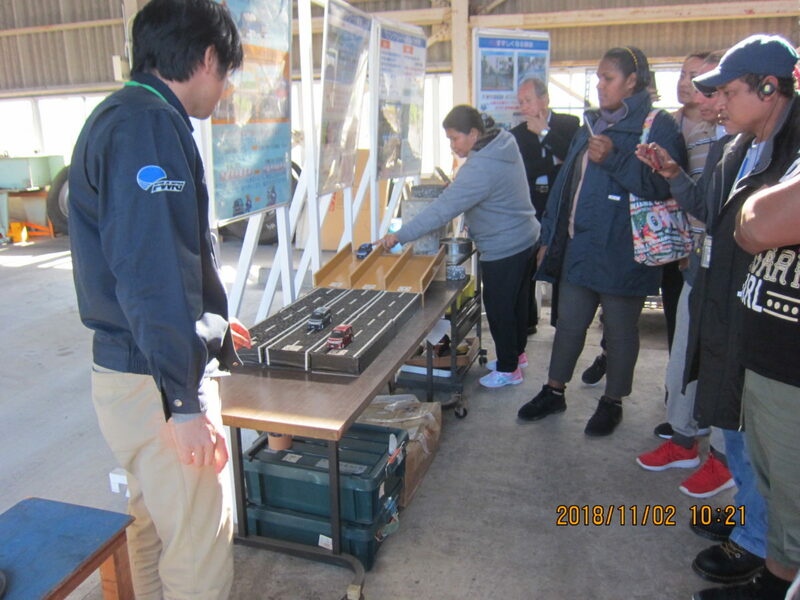 We were shown the test run field, paved road test field, experimental facilities for structure members, and stockyard of removed members from bridges all over Japan. The staff in charge of each section explained in detail. 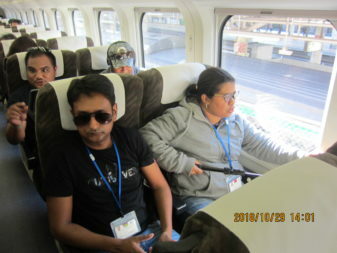 As an experience, our bus run the test bank at the speed of 100km/h which was one exciting event. 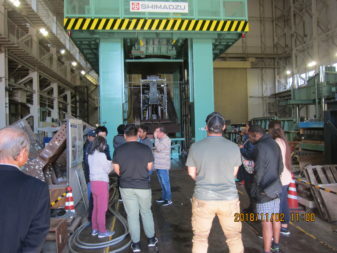 We saw in awe the Japan’s largest loading test machine which presses test structure member by the force of 30MN. In the afternoon, we had a lecture, “Planning of highway Bridges”, delivered by Mr. Okada, Chief Researcher at NILIM, followed by another lecture, “Pavement Technologies and Management in Japan”, by Mr. Kawakami, Researcher at PWRI. 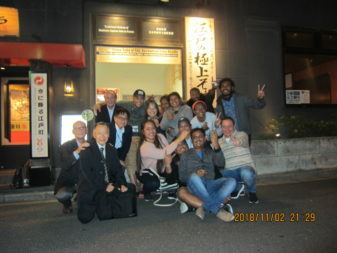 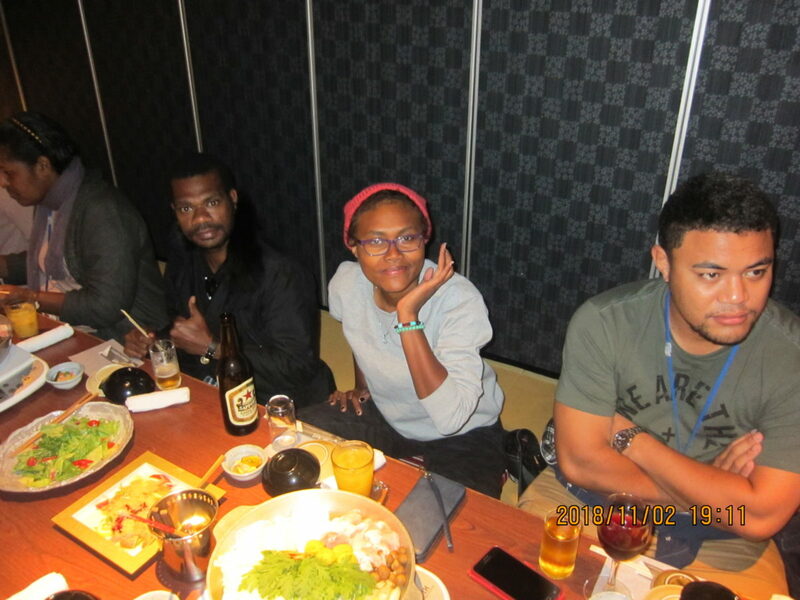 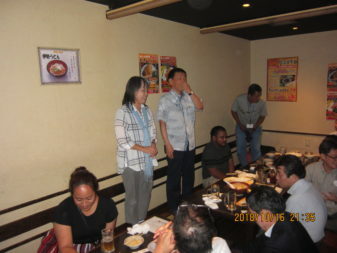 In the evening, all participants joined a dinner party in a restaurant in Akihabara, “Dofuuro”. 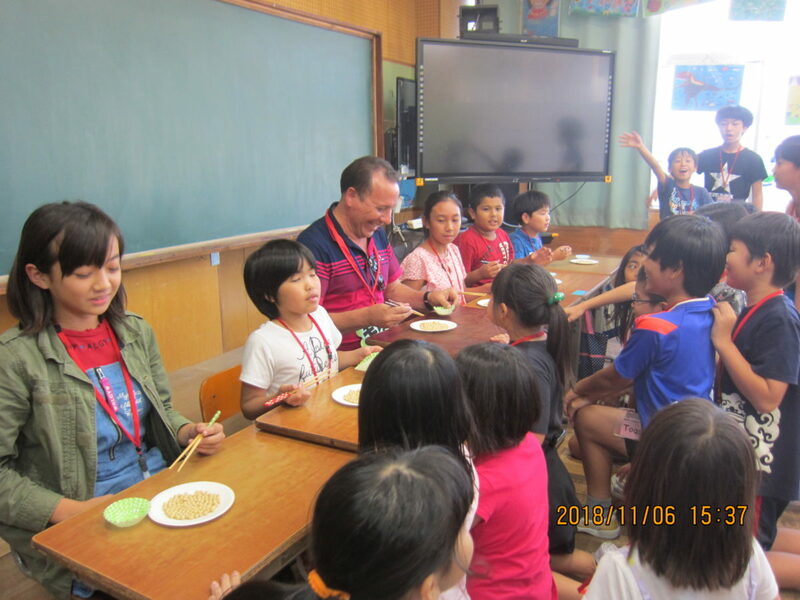 Despite the worry if participants may like Japanese stew, they finished all food including ramen. 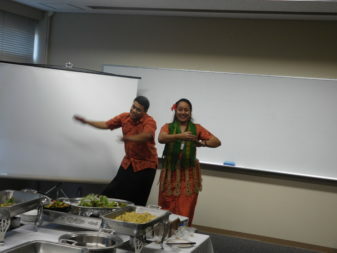 The party was filled with friendly atmosphere that some participants sang songs with dances. 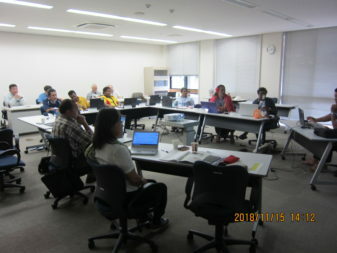 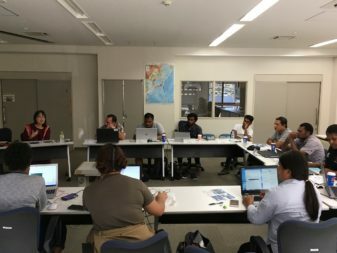 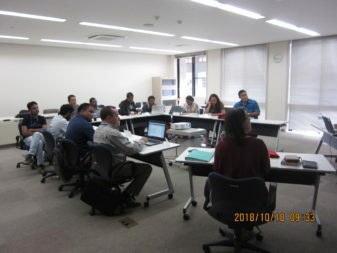 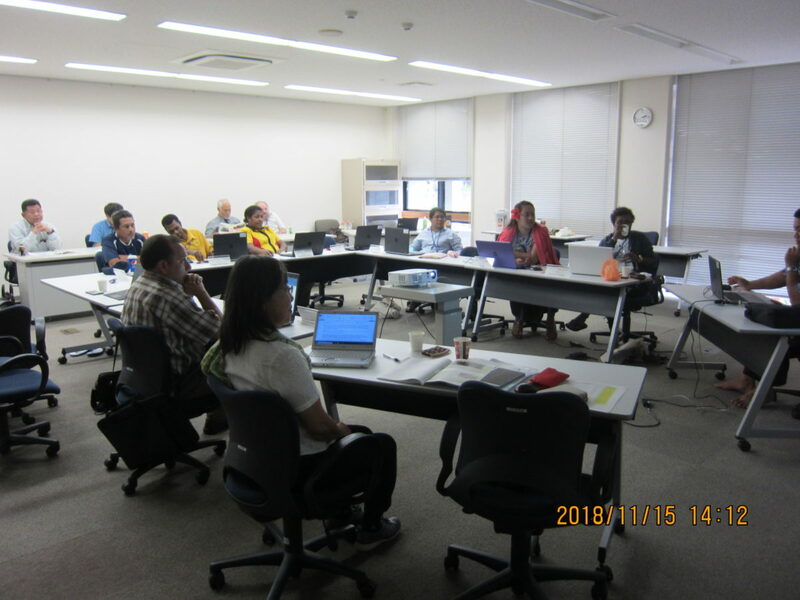 We had a lecture given by Professor Horita on “A Guideline for Bidding & Contract Systems for Management & Maintenance Projects: the Concept of Comprehensive Contracts” in a meeting room of library building, University of Tokyo Kashiwanoha Campus in the morning. He presented that Sasago Tunnel Incident was a trigger of establishment of road maintenance system and elaborated on new system of bidding for road maintenance contract. 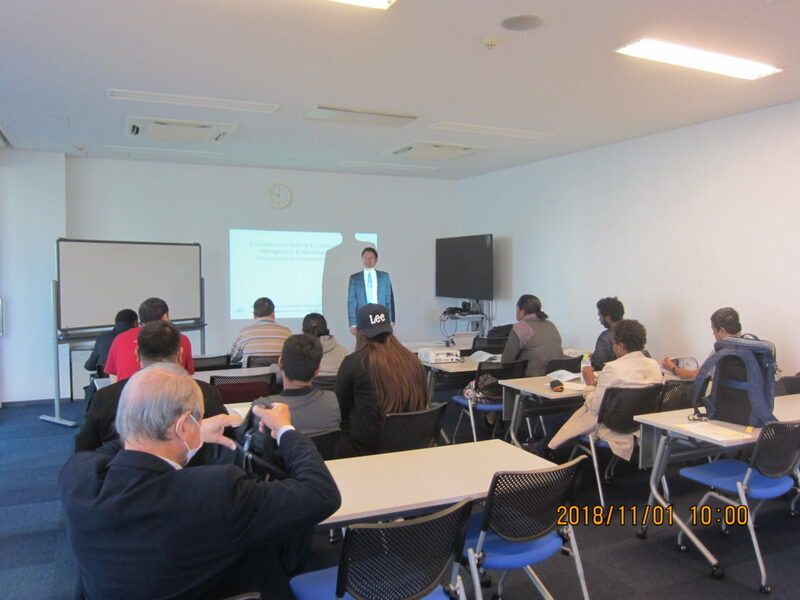 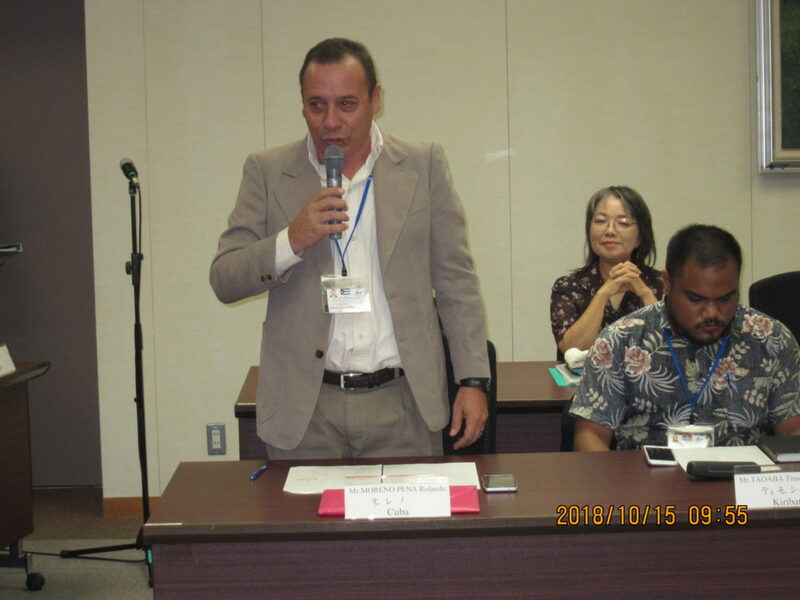 Participants answered to the questions posed by Prof. Horita and listened carefully to the lecture as they compared the system of bidding and contract of their countries and that of Japan. 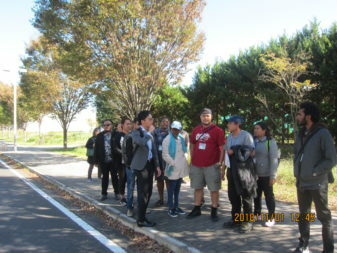 After lunch, Mr. Inoue, a graduate student, showed us university facilities on the campus. There was a surprising event that we accidentally saw Prof. Kajita, a novel prize winner in physics, in front of his laboratory building. 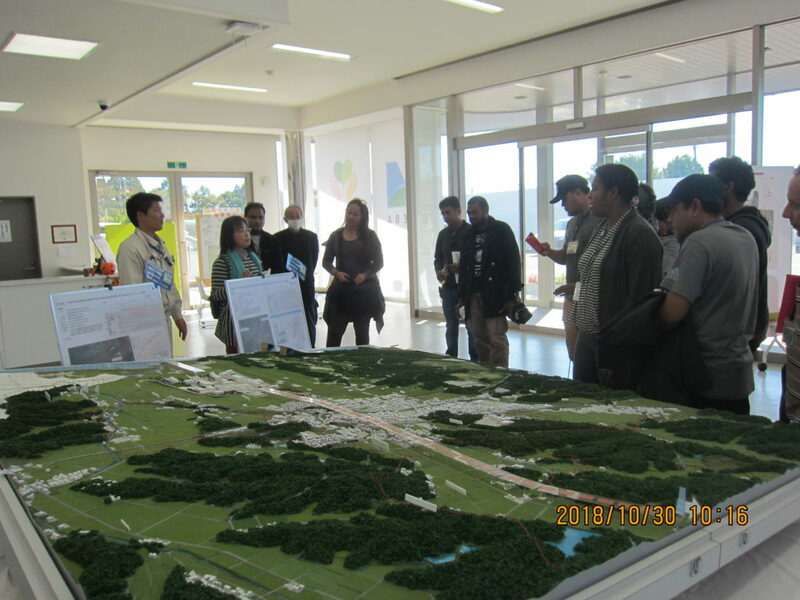 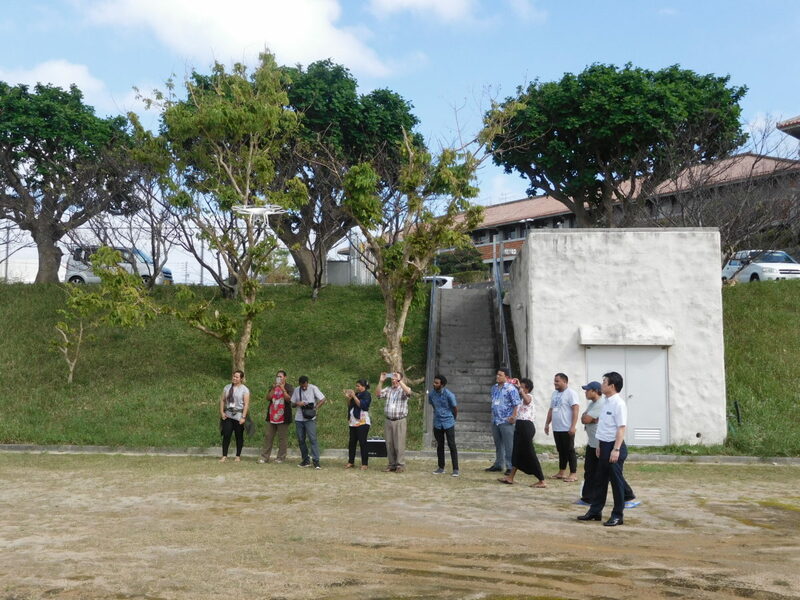 At the end of the campus tour, Mr. Inoue escorted us to a conceptual model of eco-friendly community installed in front of Kashiwanoha Campus Station. 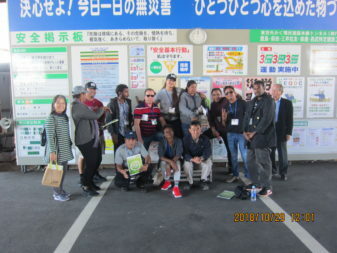 We rode on a minibus, and travelled a long distance by transferring several Expressways, then reached to Futaba Town of Fukushima Prefecture which had been designated as “difficult-to-return zone” by Japanese government as it was significantly inflicted by East Japan Great Earthquake. 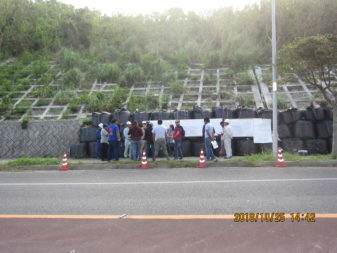 There was a barricade at the entrance of the town, restricting entry of cars and people. 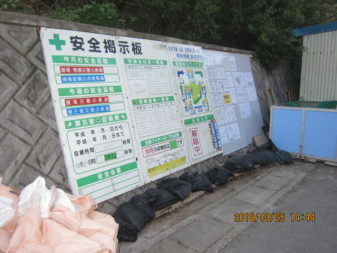 We saw the ravaged town with many abandoned houses and buildings. 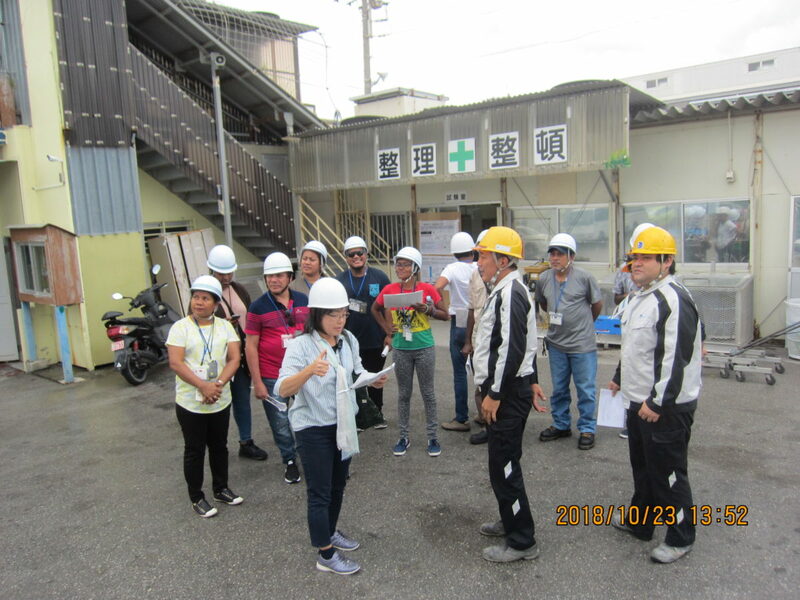 We first had a briefing about the site visits at office, then went to see the interim storage facility of waste and soil generated out of decontamination works, and disposal site in the morning. 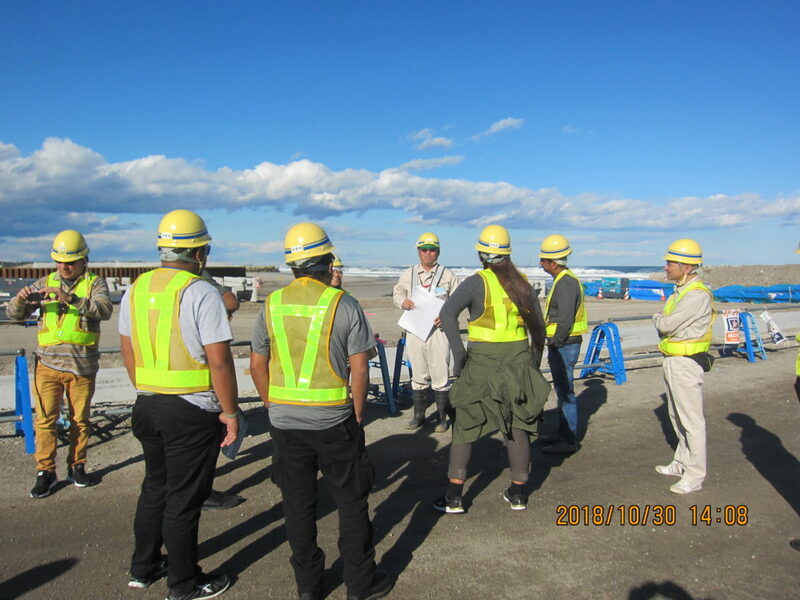 In the afternoon, we went to a construction site of Futaba interchange of expressway and another work site of revetment at sea and river. The radiation dose was indicated in many points along road and at the site. 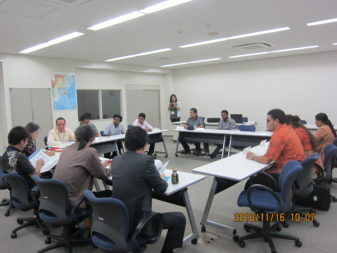 Participants were interested in the measured value and asked questions. Then we moved to Naraha Center for Remote Control Technology Development. 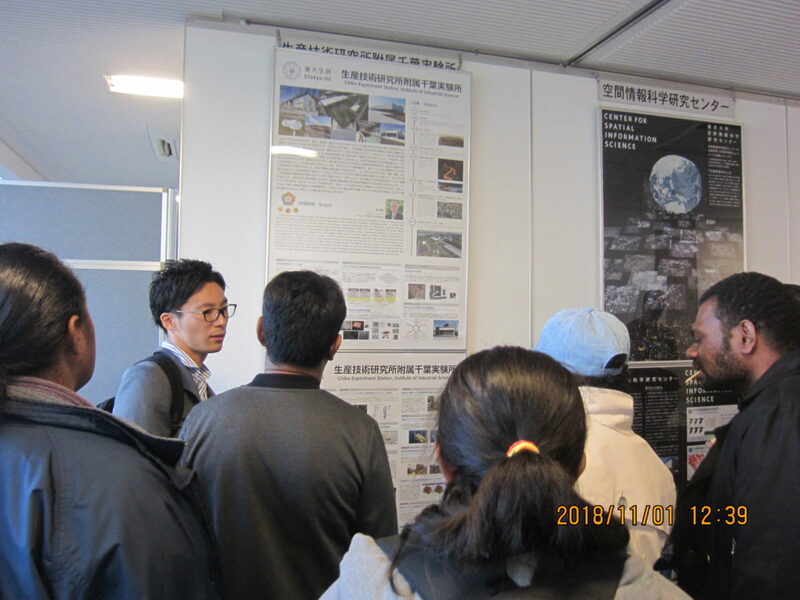 This center promotes researches to promote and operates the remote control technology with robots to be used in the decommissioning of the Fukushima Nuclear Power Plant. 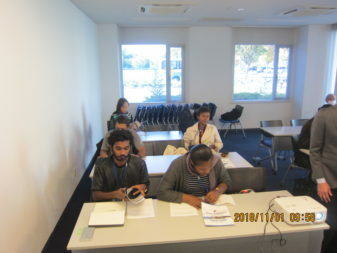 Participants had a chance to experience virtual reality system and were cheered with 3-dimentaional images. 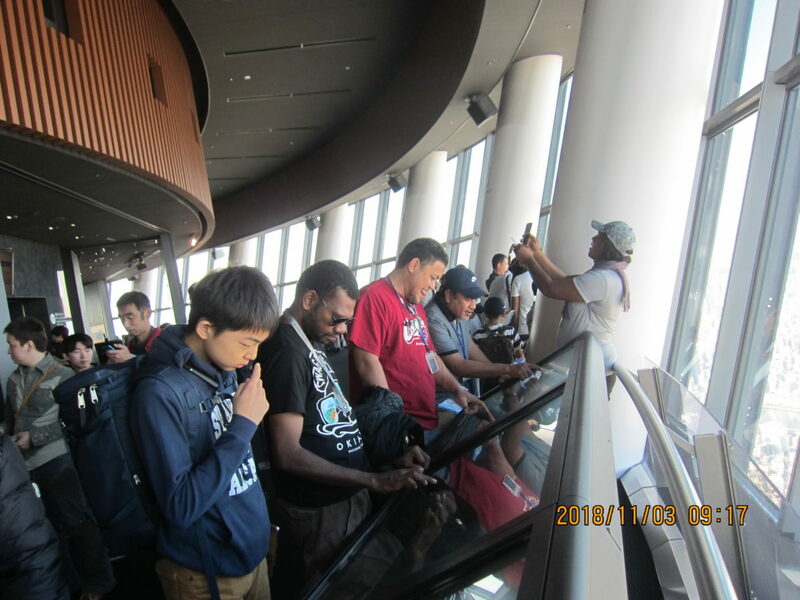 No photographing inside the center was allowed. 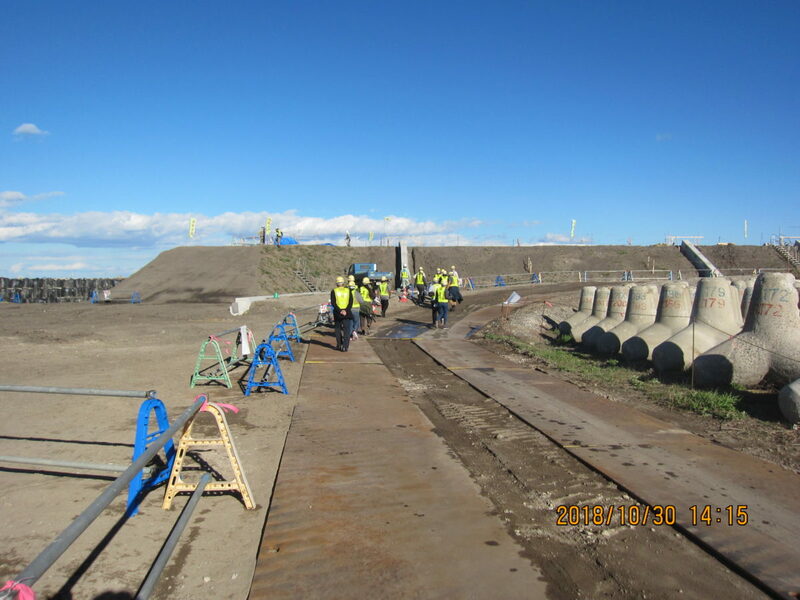 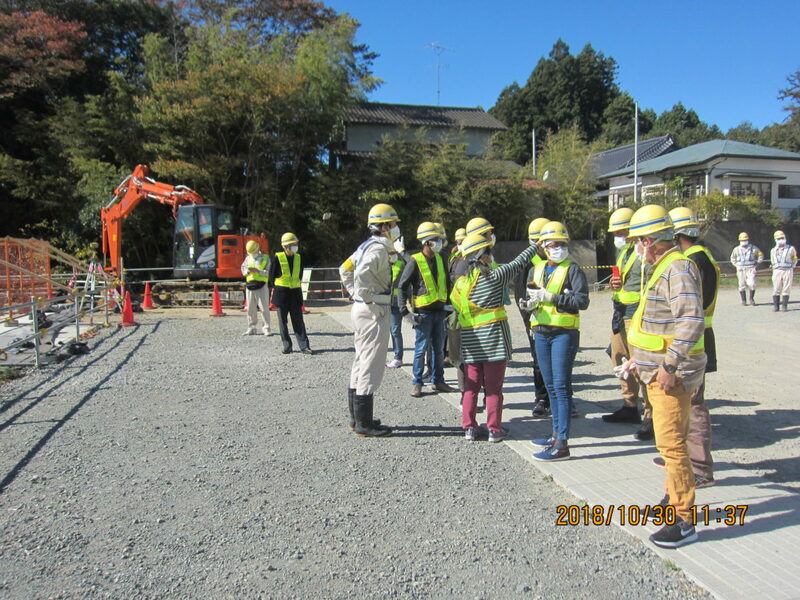 We observed the construction site of Main Line Tunnel (south bound) Tomei North Section, ordered by NEXCO East Japan Expressway Co. Ltd. It was the Japan’s largest tunneling work with 15.8m of outer tunnel diameter (14.5m inner tunnel diameter) and 9,155m of tunnel length. 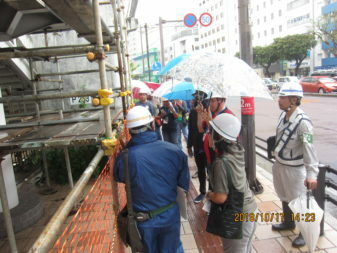 Last year, the work was still at the initial stage of excavation. But in this year, it has been making a steady progress since April, and advanced up to about 500m. Mr. Mochiki, vice director of the main tunneling work, briefed us on the work outline in meeting room. 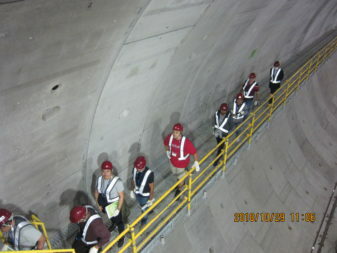 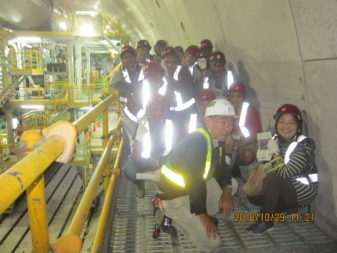 Then all participants wore helmet and safety vest, and were escorted to the actual tunneling site. 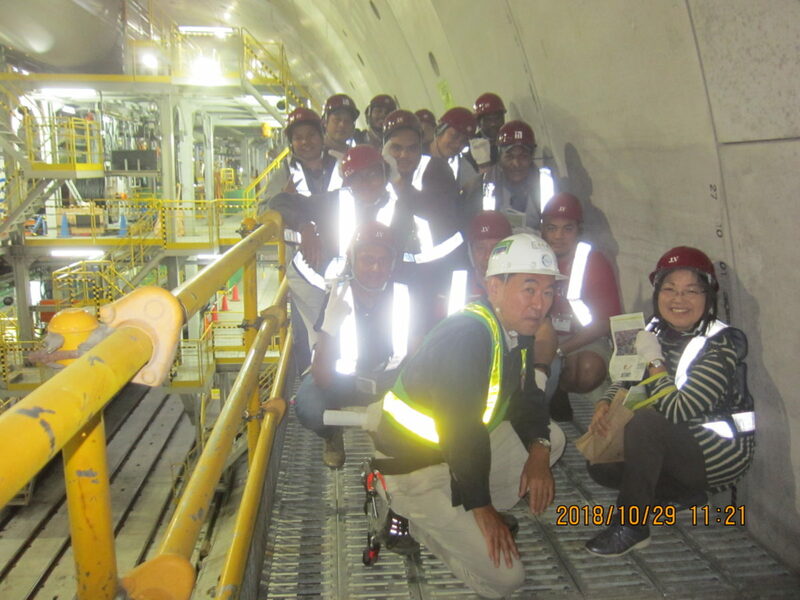 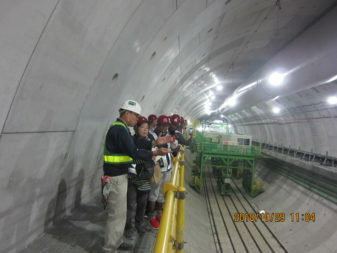 As it was the first time for the participants to see the shied tunnel work, they showed great interest in it and were overwhelmed with its hugeness. 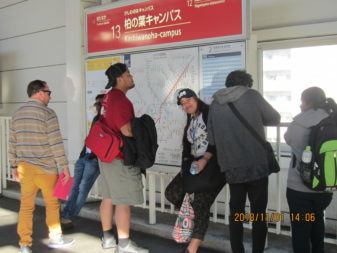 After the observation, the group moved from Tokyo to Koriyama by shinkansen. 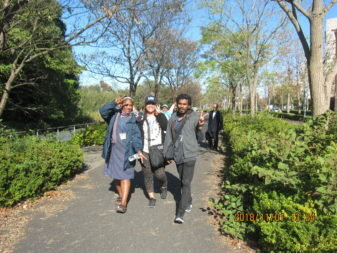 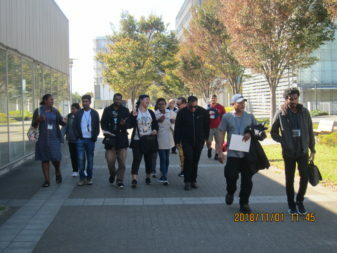 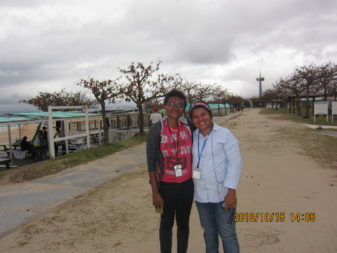 Upon arrival, some participants put on coats as they found Koriyama was much colder than Tokyo. 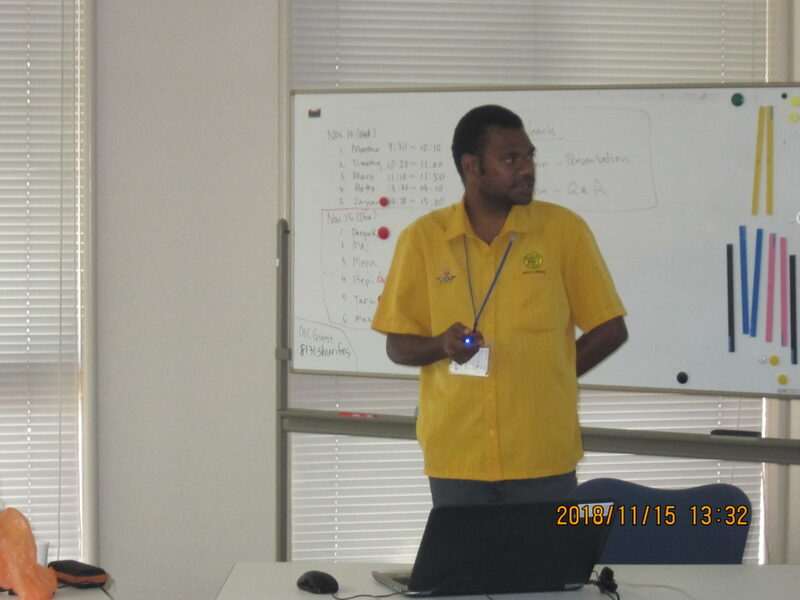 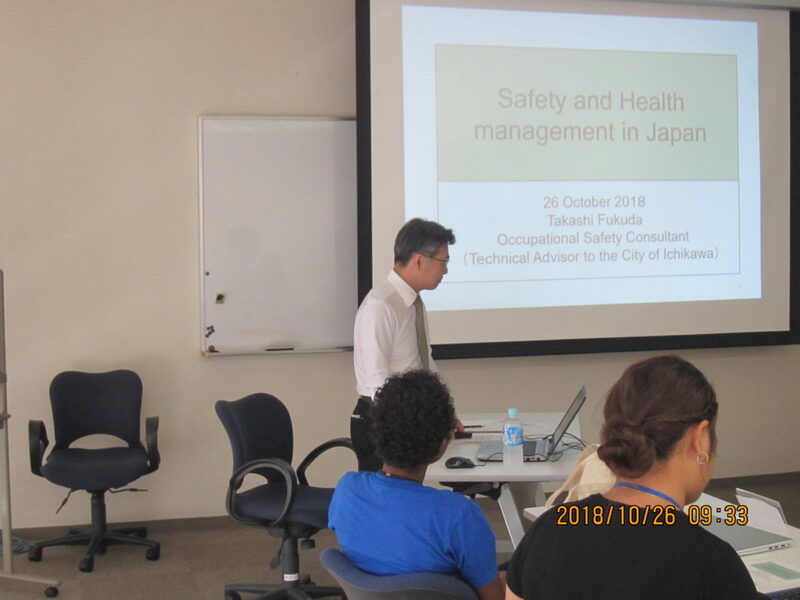 The lecture in the morning was titled, “Safety and Health Management in Japan”, delivered by Mr. Takashi Fukuda. 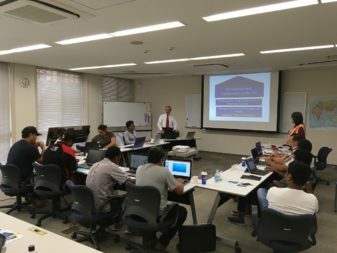 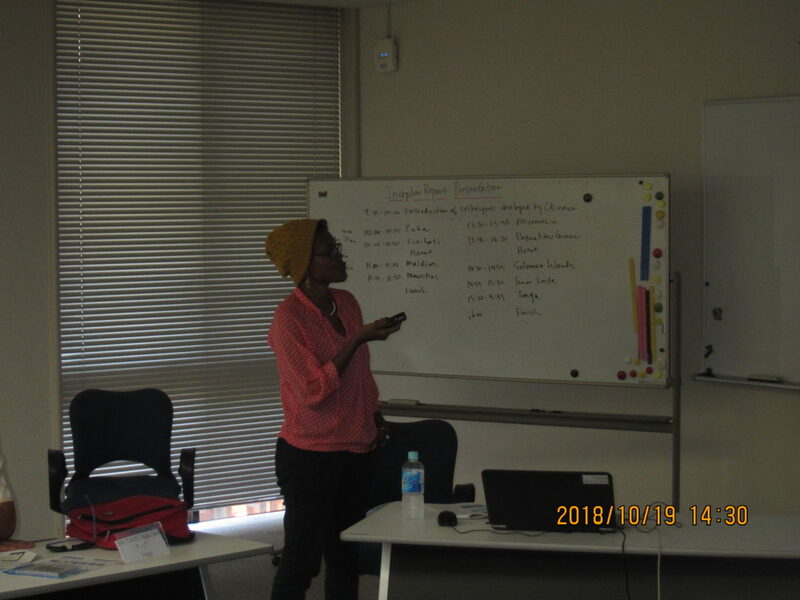 In the first half of the lecture, participants learnt related laws such as Labor Standards Act and Industrial Safety and Health Act, and the background of establishment and major contents of these laws. Later half of the lecture was in practical style where the lecturer showed pictures of actual work sites and asked the participants to assume they were patrolling to find out unsafe arrangement or behavior. 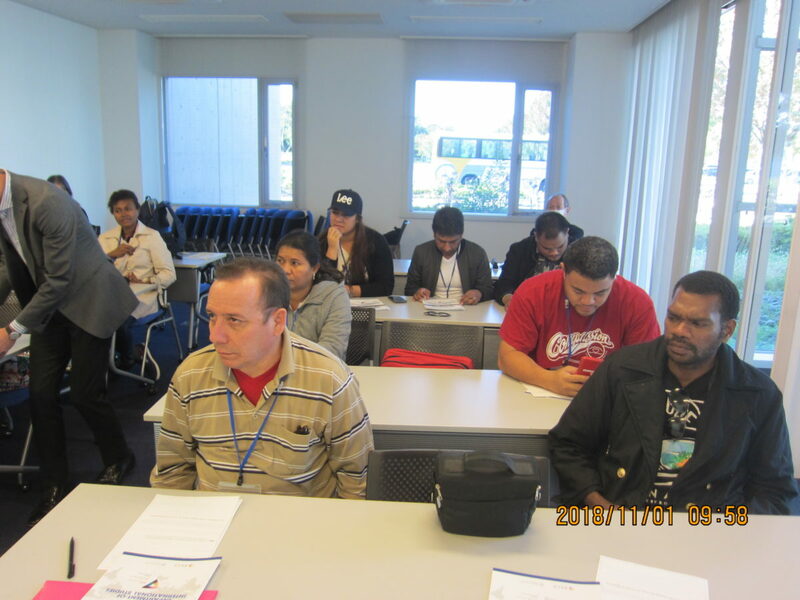 In most of the cases, participants gave unerring answers rated highly by the lecturer. In the afternoon, Mr. Fukashi Oguchi gave a lecture on “Environment Conservation Technology for Road Maintenance”. 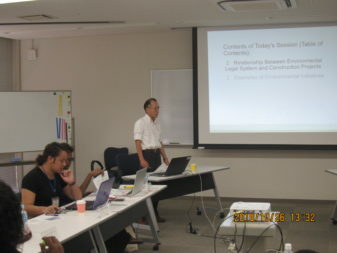 At first, he explained about legal structure of environment conservation in Japan and how these laws relate to construction sector. In the later half, he explained the possible measures for conservation including actual procedures of turbid water treatment and water disposal. 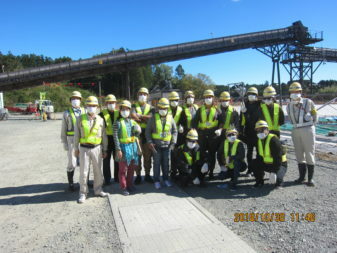 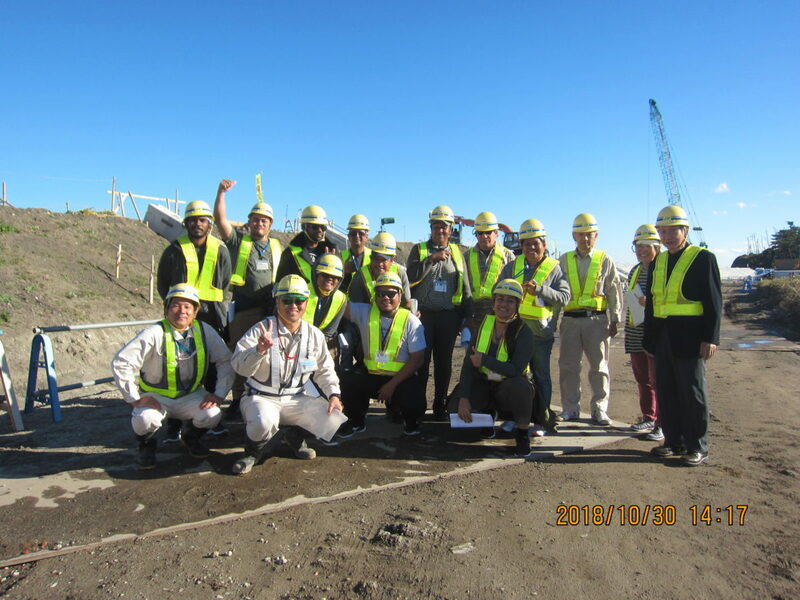 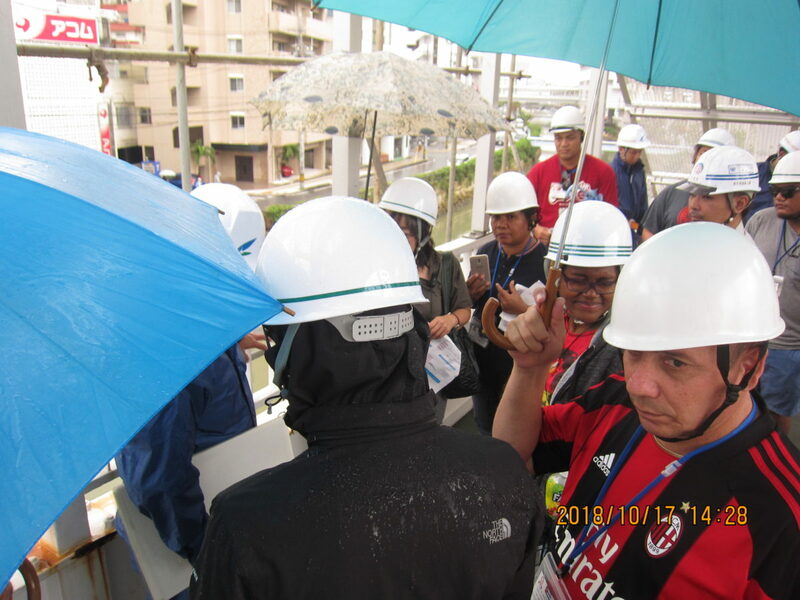 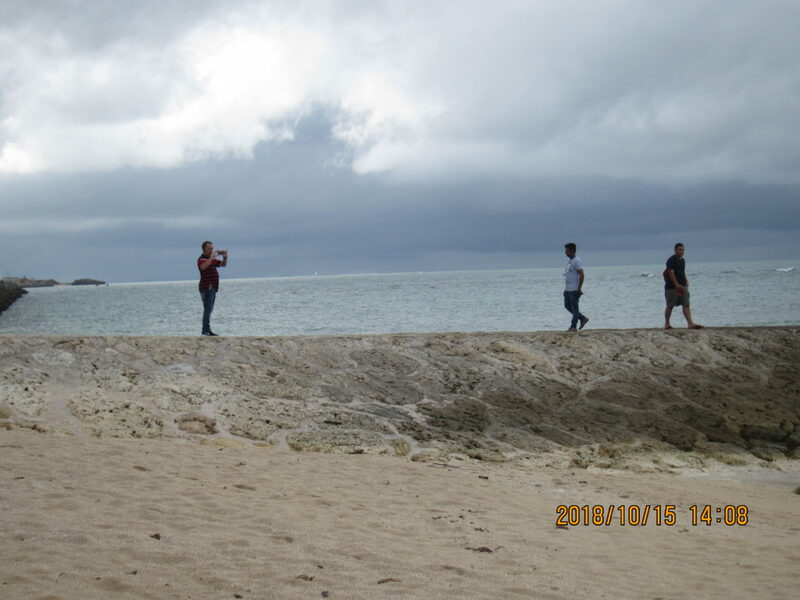 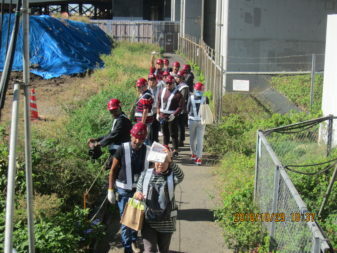 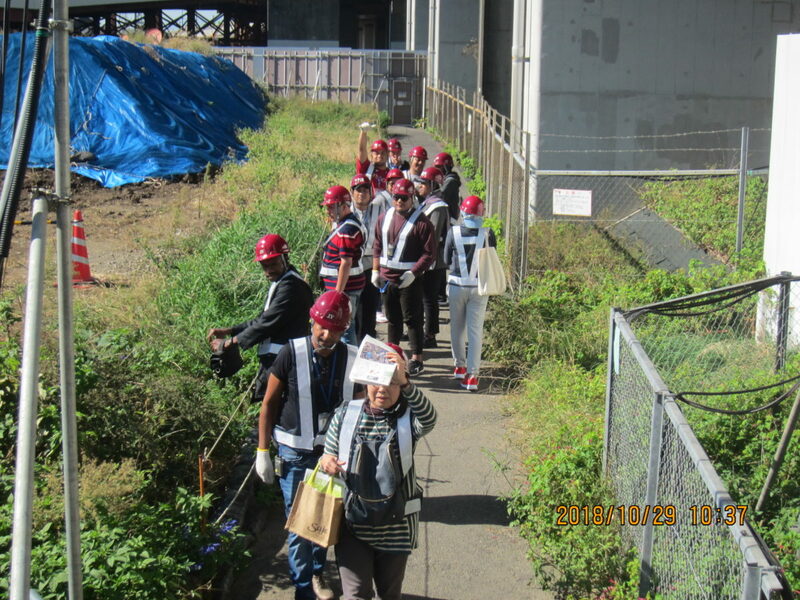 In the morning, the group went out to observe the aseismic reinforcement work on arch-type bridge in Haebaru ordered by Okinawa General Bureau. 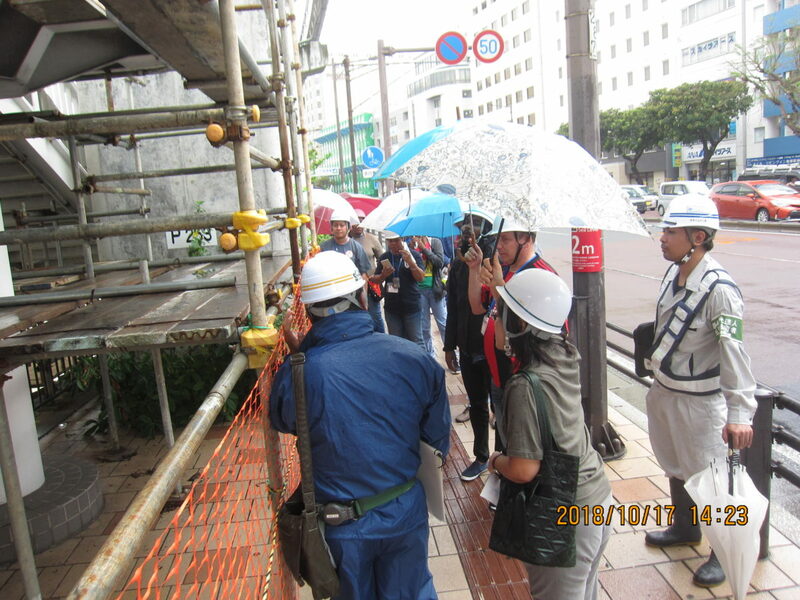 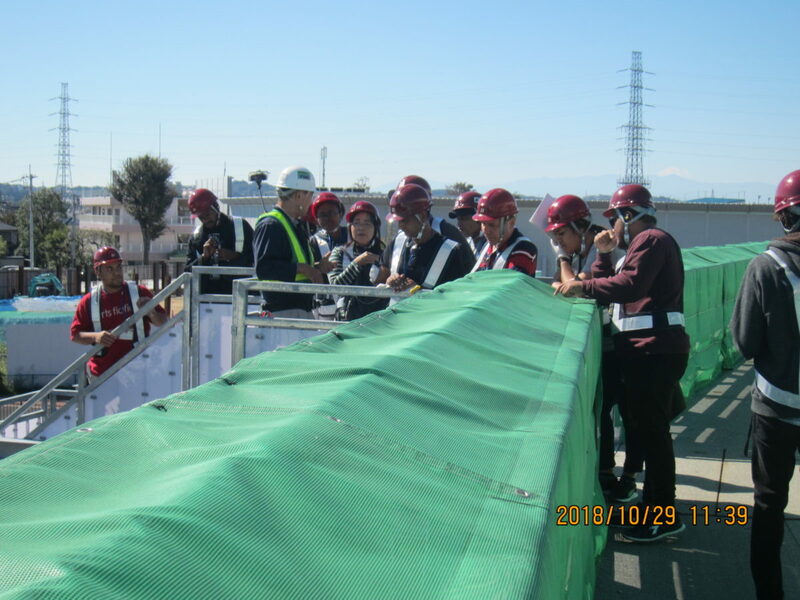 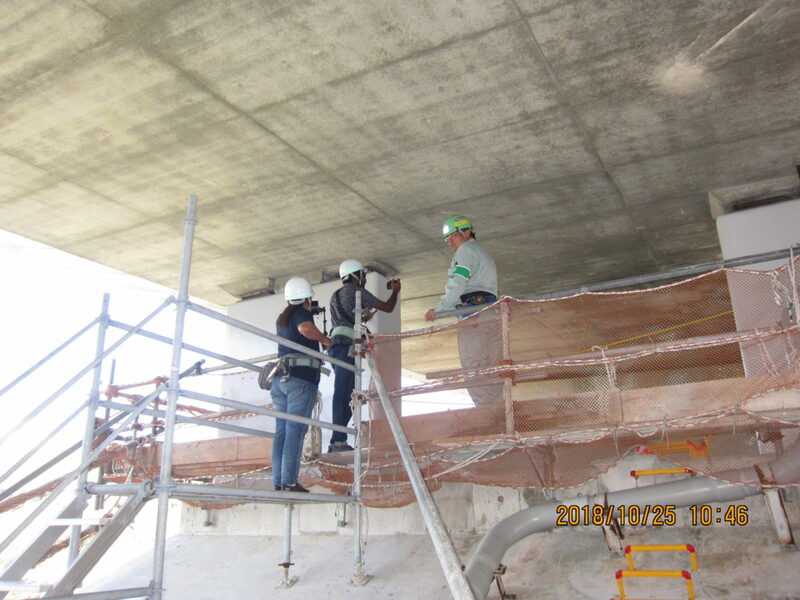 At first, a staff from Nanbu National Highway Management Office briefed us an outline of the work, then we walked up the scaffold at 30 m above the ground to observe the actual work. 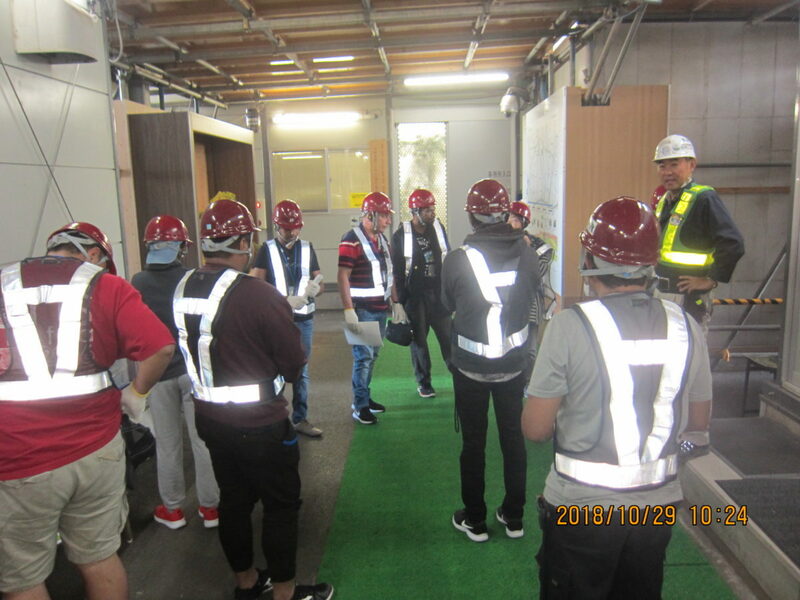 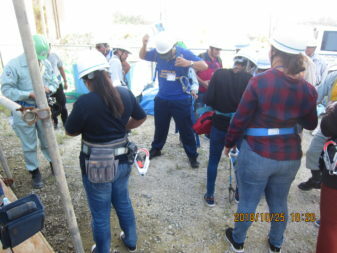 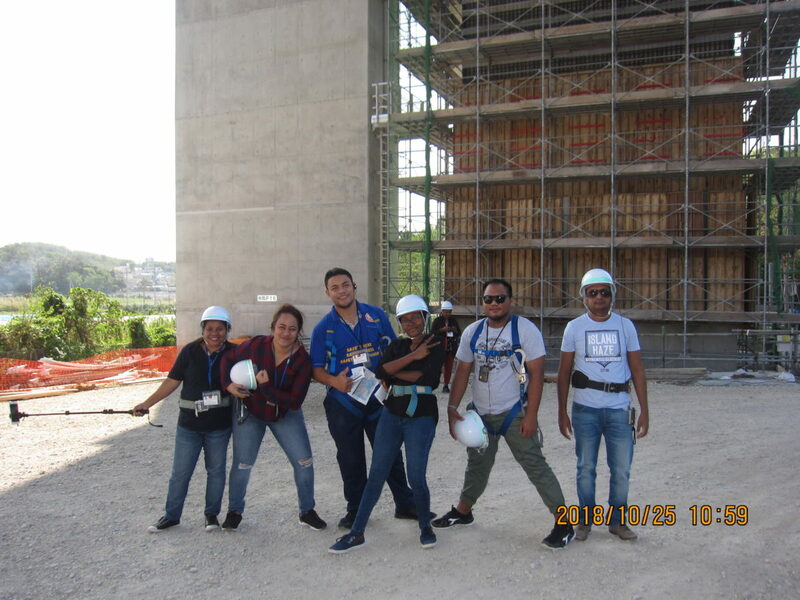 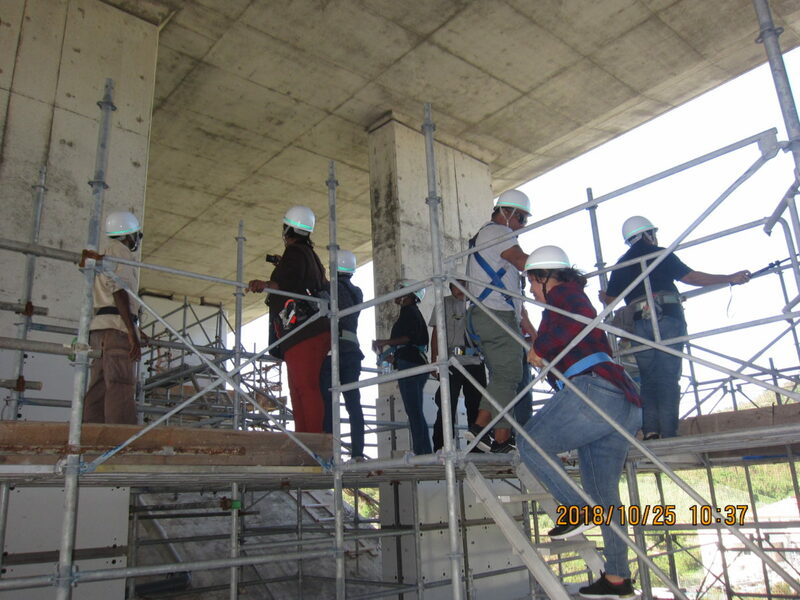 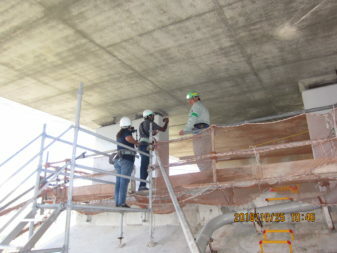 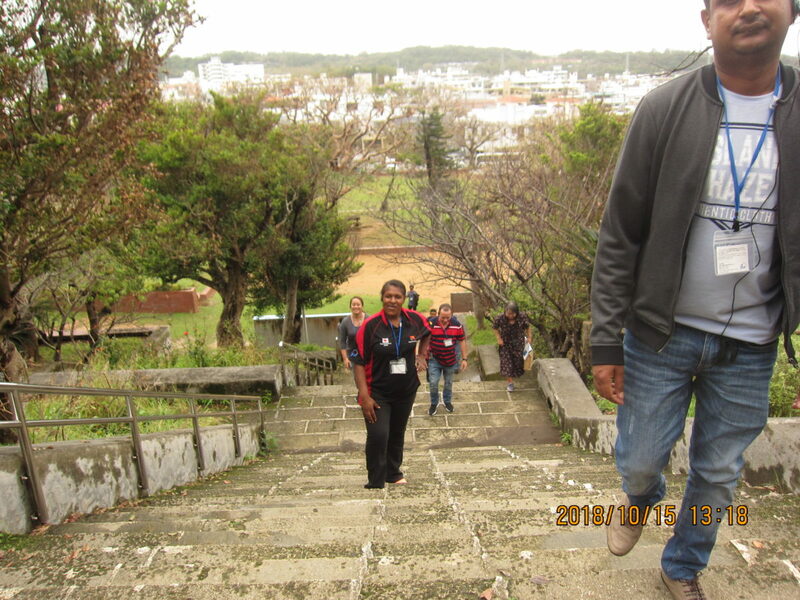 All participants wore safety belt (harness) and slowly moved up the stairs, watching their steps carefully. It was the RC multiple span continuous balanced bridge. 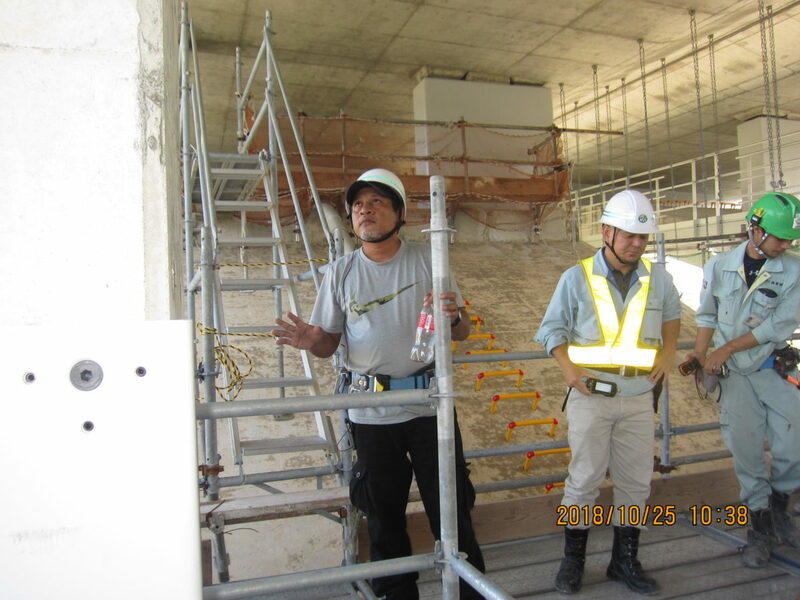 The reinforcement work needed to be conducted as to fit to the current standard that is to be resistant to large-scale earthquake. 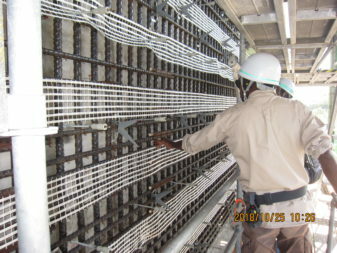 For instance, individual bars to be connected to the bridge main body is done alternatively. 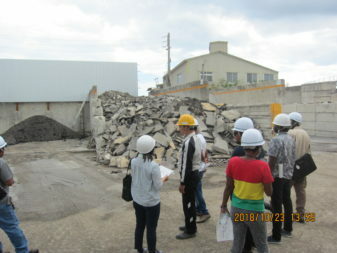 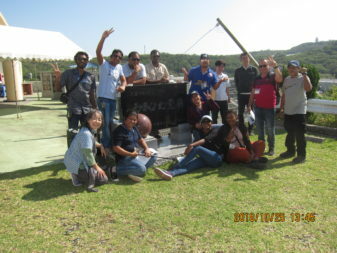 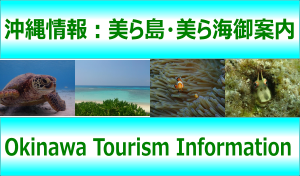 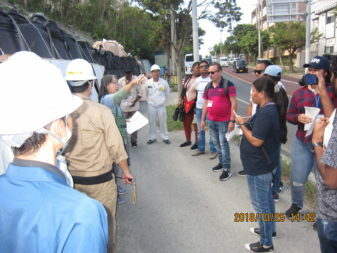 The site the group visited in the afternoon was the work ordered by Okinawa prefectural government. 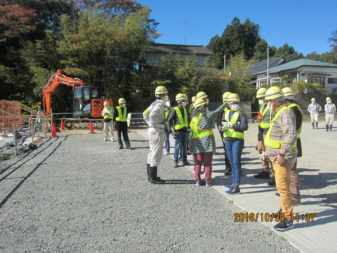 We looked at road under construction from the hill of Ozato Memorial Park. 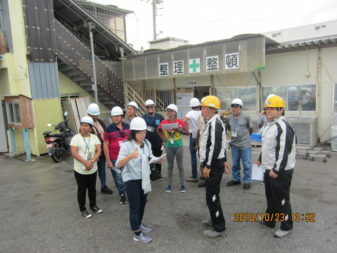 The staff from Nanbu East Road Construction Management Office explained the outline, how this road construction would contribute to promotion of southern region community, and other effects out of the work. 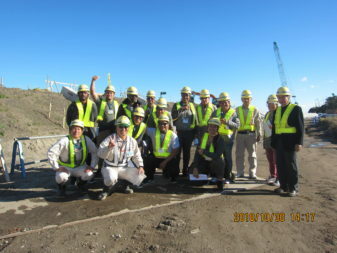 It will be completed 8 years later. 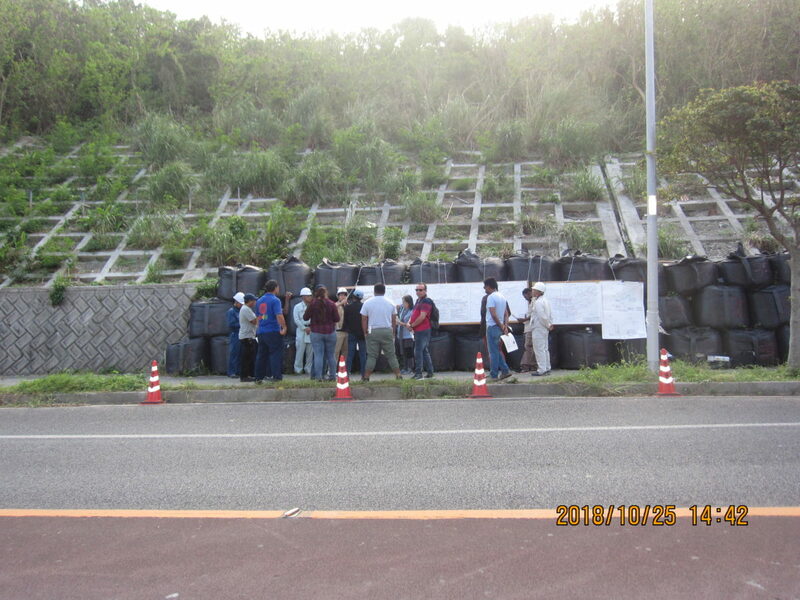 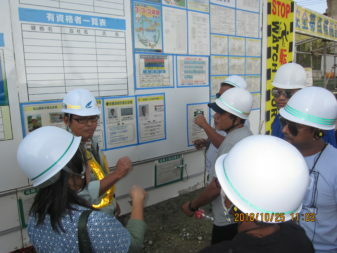 Then we moved to Urasoe-Nishihara line road to observe a disaster prevention work. 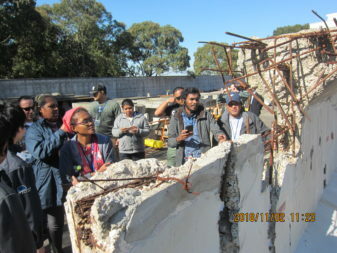 The work was determined because retaining wall had cracks after severe rain last year, and further damage was expected to occur if left it without any treatment. 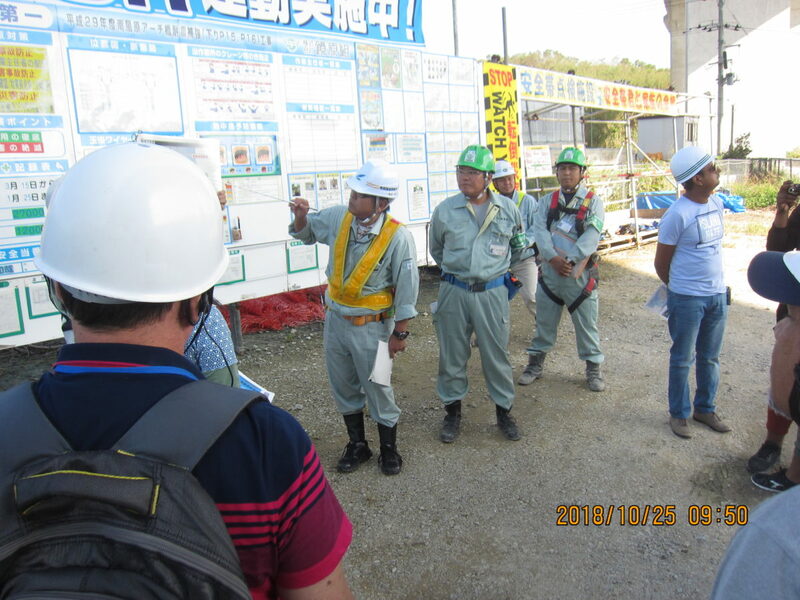 Use of restraining pile (H steel pile) was adopted to prevent landslide. The participants were interested in the pile drive by the tower installed in provisional staging. The lecture in the morning was given by Mr. Morimasa Furuki, Senior Advisor at Japan Society for Civil Engineering on “Pavement Design and Damages in JICA Project Sites”. 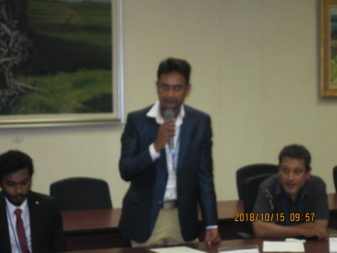 He stressed the importance of quality management of asphalt plant, and introduced how to design appropriate pavement according to the traffic load using formula, and actual cases of pavement repair in JICA project sites. 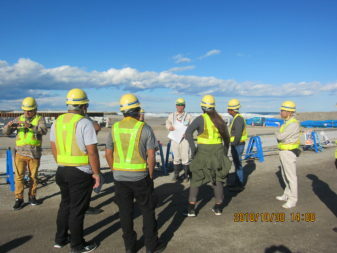 At the end, he showed some cases of pavement failure and their countermeasures. 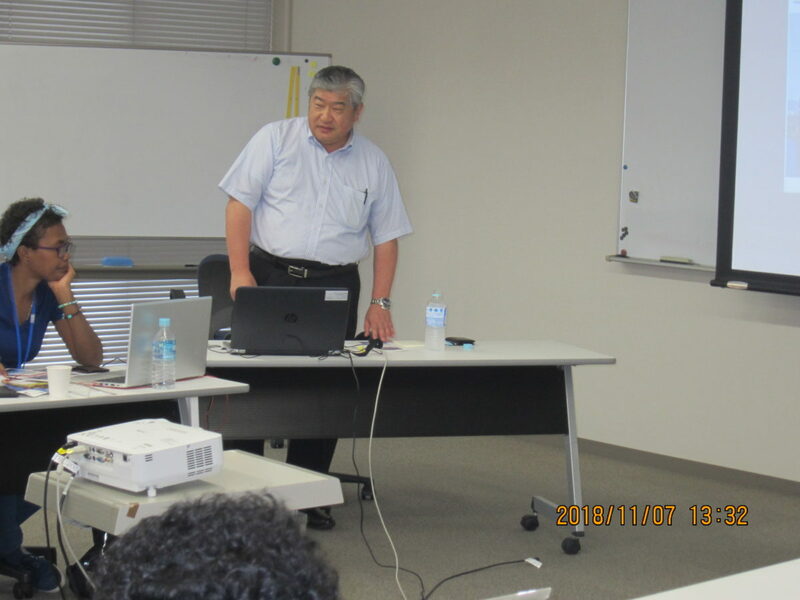 In the afternoon, Mr. Kazuo Mita, president of Choju Hokyo Doko (meaning, long-life reinforcement earthwork in Japanese) Co. Ltd. delivered a lecture on “Slope Technology”. 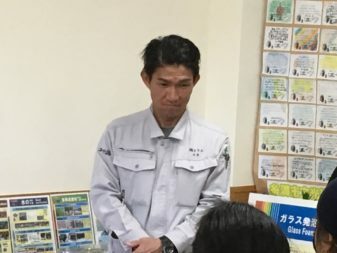 He shared an actual case when an earthquake at seismic intensity of 6 caused a collapse of banking in Tomei Expressway in 2009, the collapsed region was restored within 4 days (where it usually takes more than 2 weeks to restore). 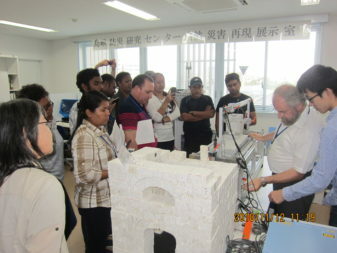 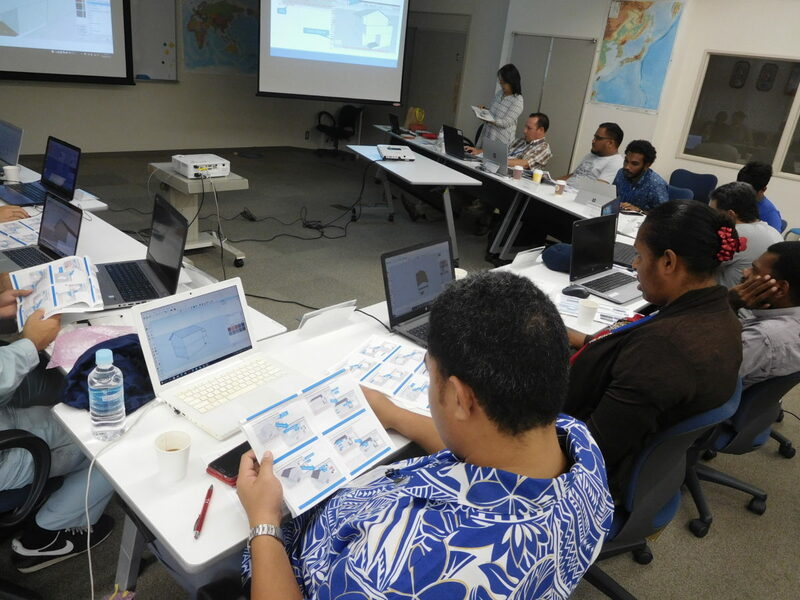 Participants were surprised with the Japan’s high technology of making it possible. Then he showed pictures to illustrate the vulnerability of slope reinforcement works today and stressed the importance of LCC (Life Cycle Cost) and new techniques and products to use to reinforce slopes. Participants were showing their interest in highly durable members. In the morning, Mr. Morita from Maeda Road Construction Co. Ltd. delivered a lecture on “Asphalt Pavement Maintenance Technology”. He explained about the various asphalt pavement damages using actual examples, illustration and photos. 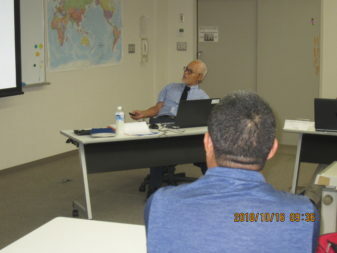 In the latter half of lecture, he elaborated on the cases of porous asphalt. 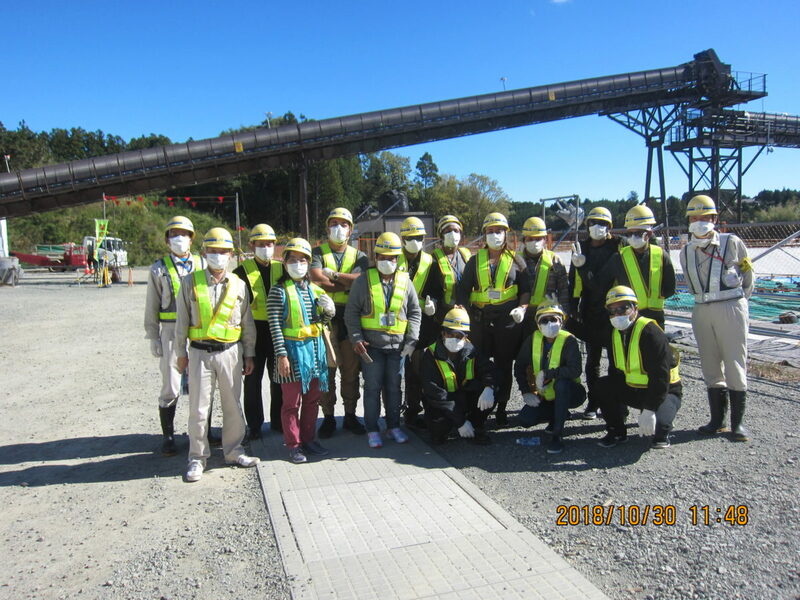 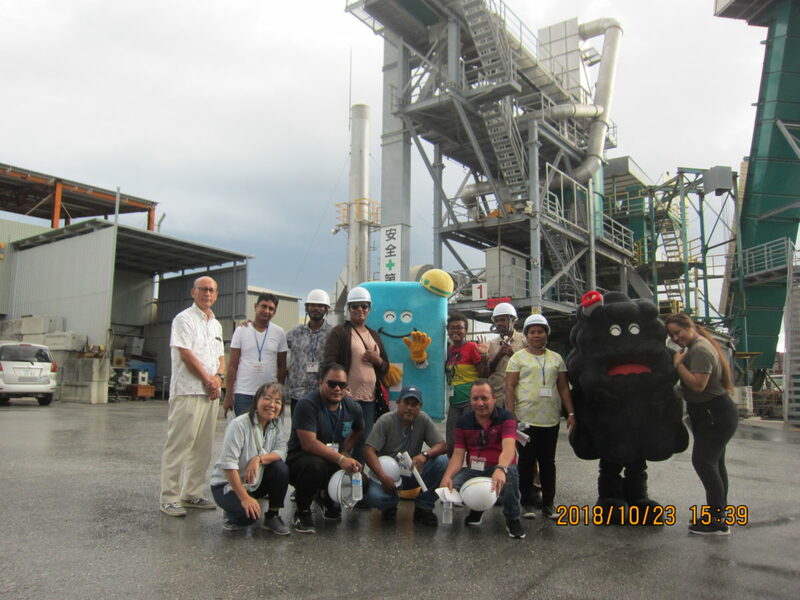 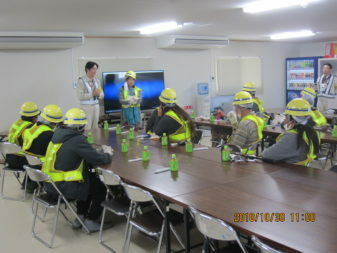 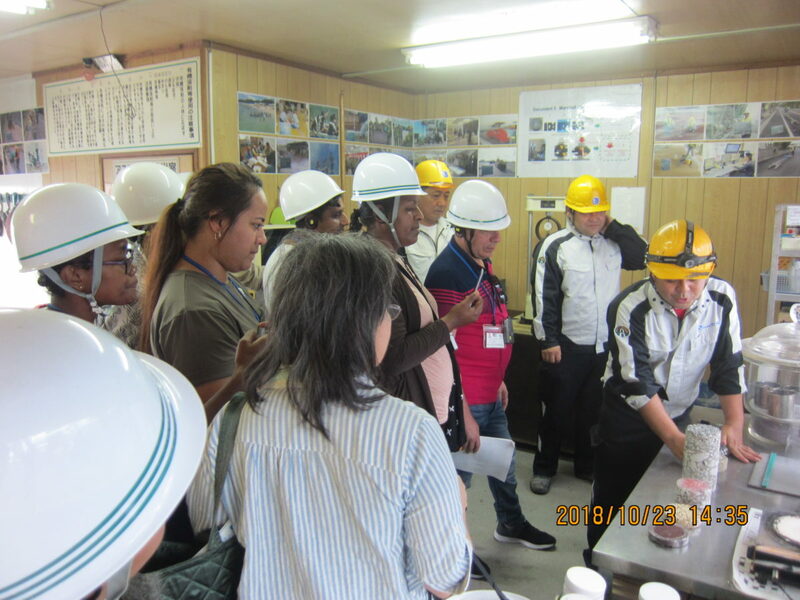 Afternoon session was the observation of asphalt plant owned by Nanawa Co. Ltd. At the beginning, the staff of Nanawa briefed us about the facilities installed in the plant and manufacturing flow. 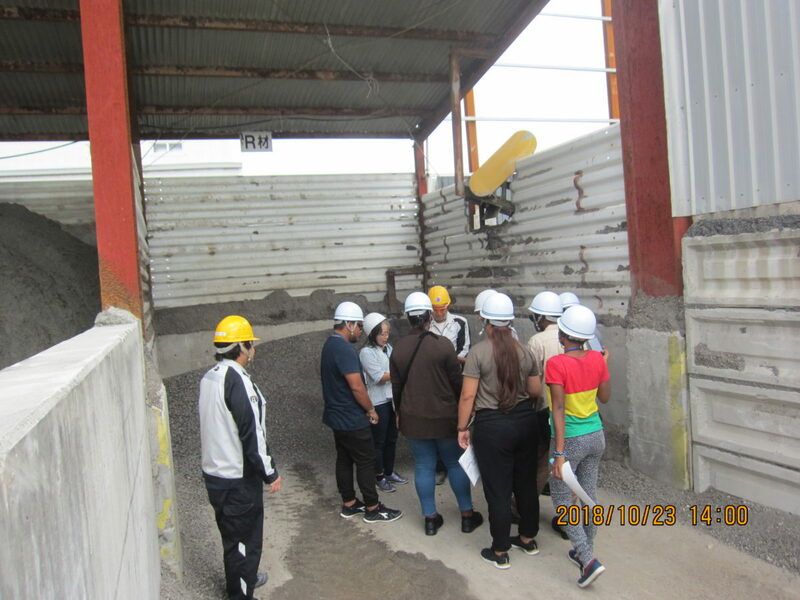 This company installed asphalt storage silo since last year. Then the group was shown the actual facilities and stock yard. 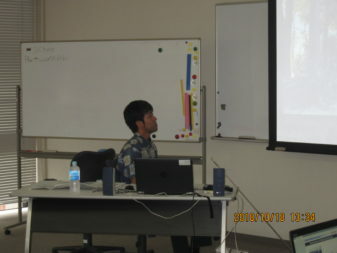 Whenever the participants asked questions, Mr. Kishimoto and two other staffs from Nanawa responded to them. 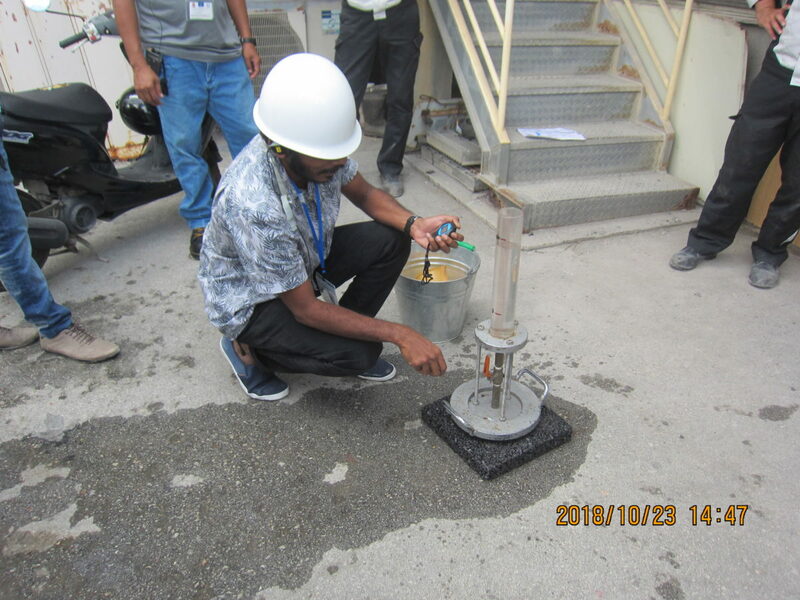 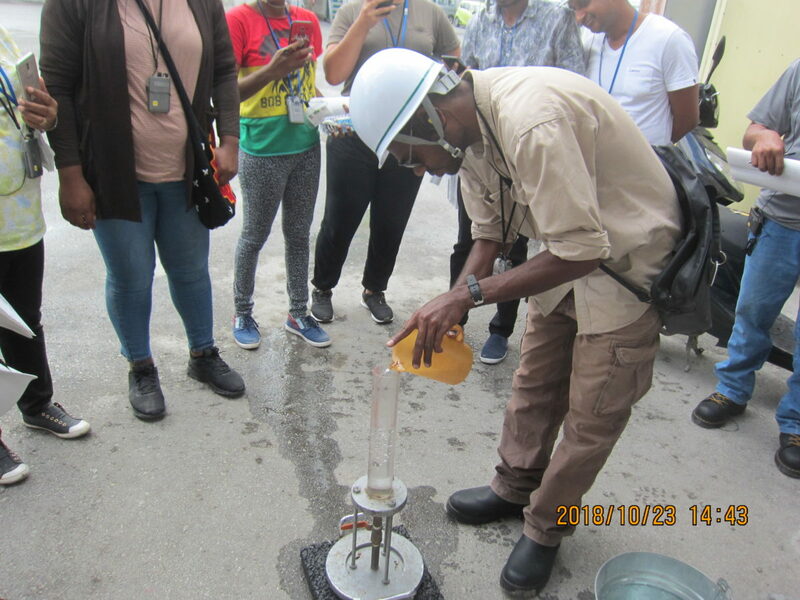 In the lab, the group experienced water permeability test and road surface roughness test after they were shown newly developed measurement devices. 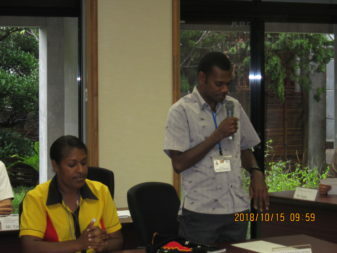 At the end of the observation, the staff of Nanawa showed their successful works so far in slides and shared their corporate policies. 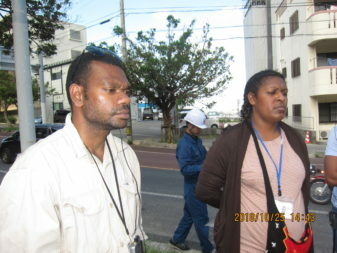 When we were leaving the plant, “Ascon” and “Road”, official characters of the company, appeared and cheered us. The lecture in the morning was titled, “Road Administration in Okinawa”, delivered by Mr. Nagamine, Chief Engineer, Mr. Kohatsu, Chief Examiner, and Ms. Kawakami, Section Chief at Road Administration Division, Department of Civil Engineering and Construction, Okinawa Prefectural Government. 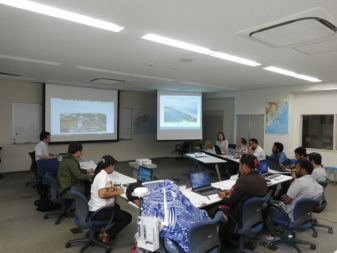 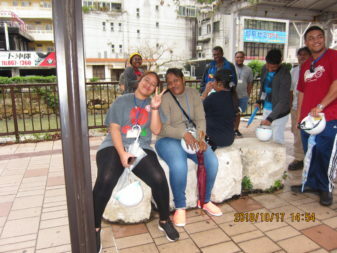 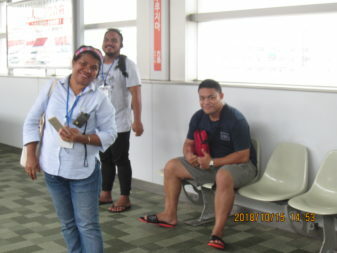 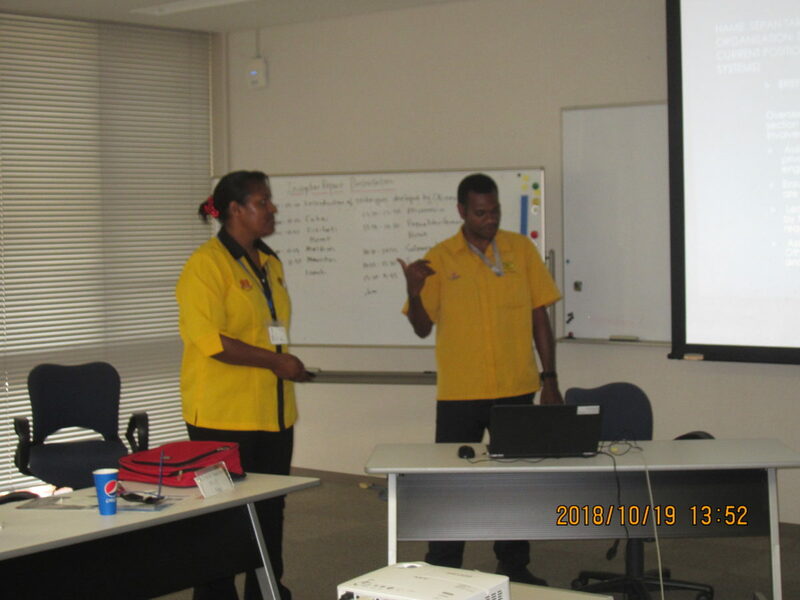 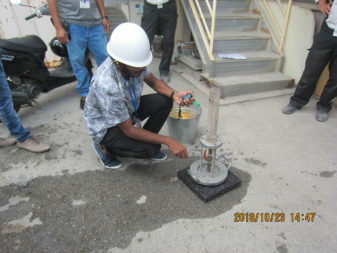 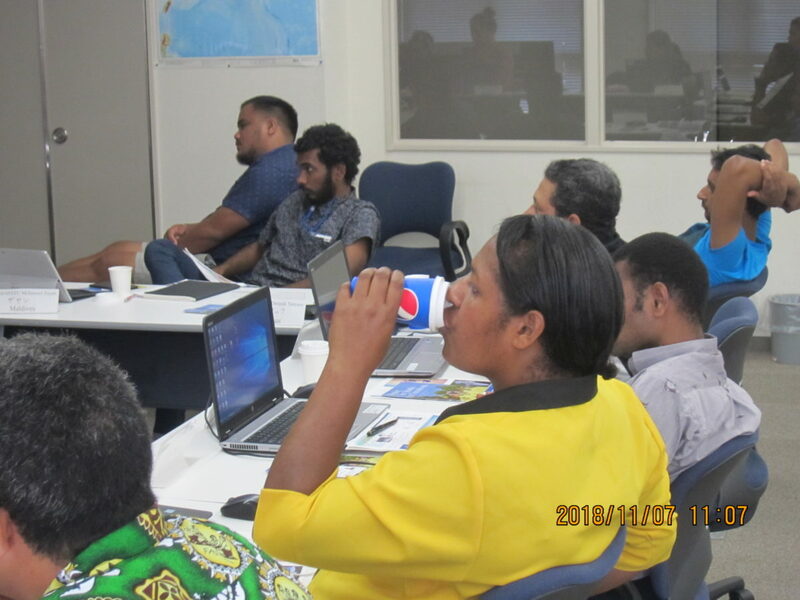 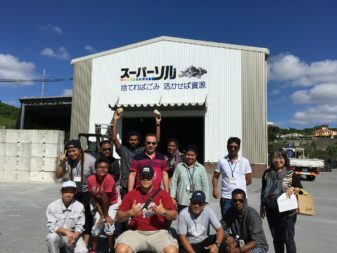 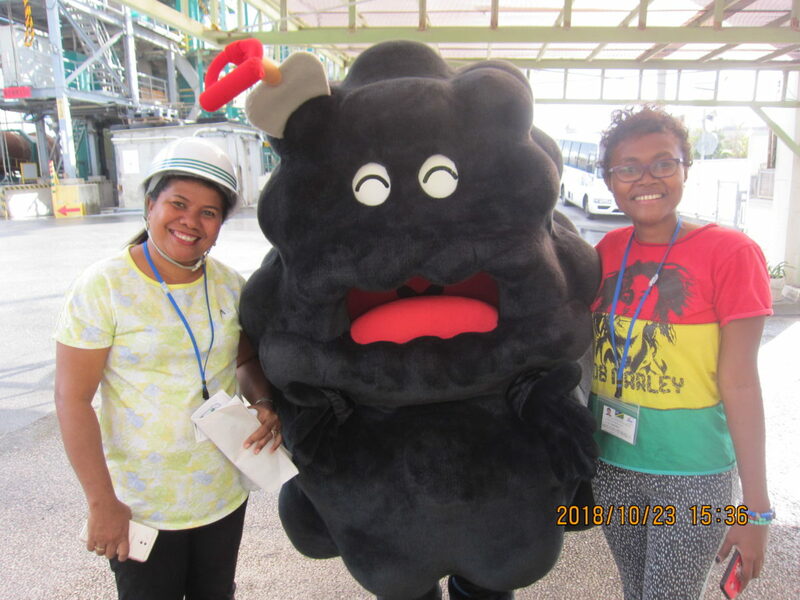 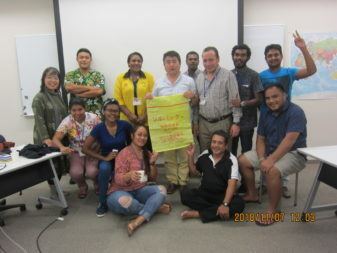 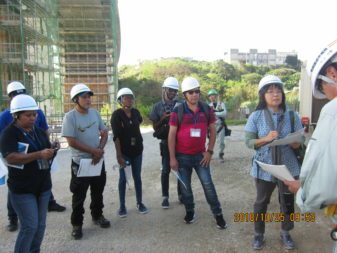 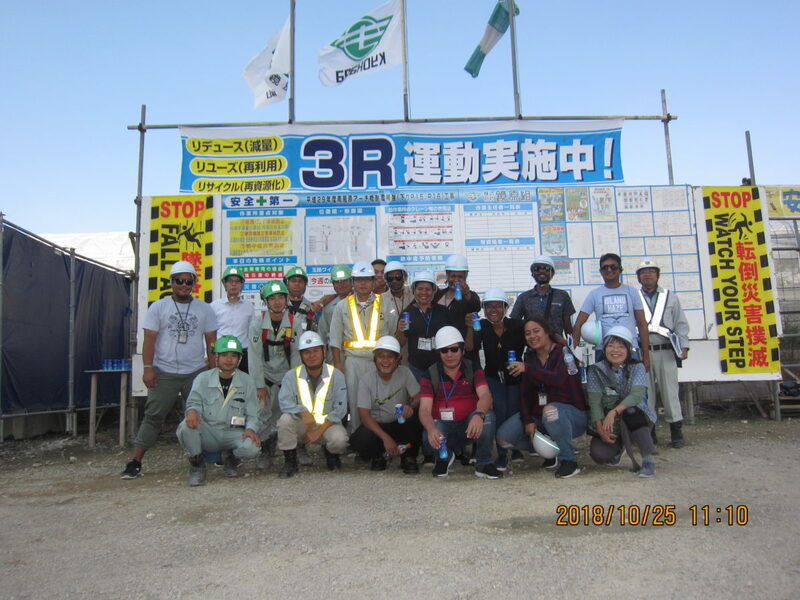 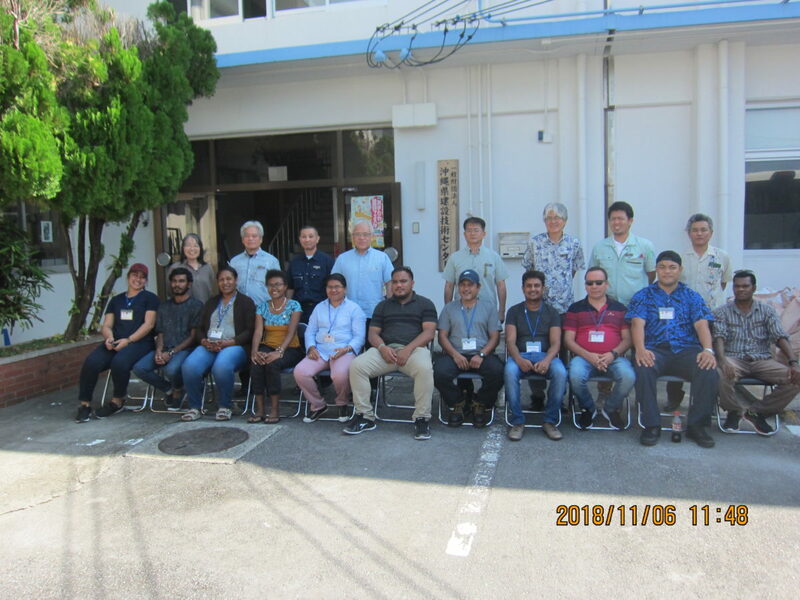 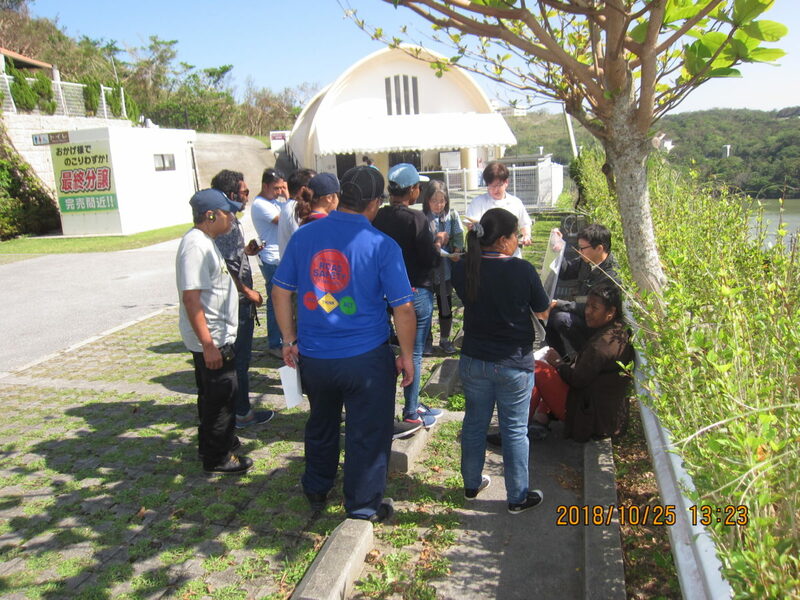 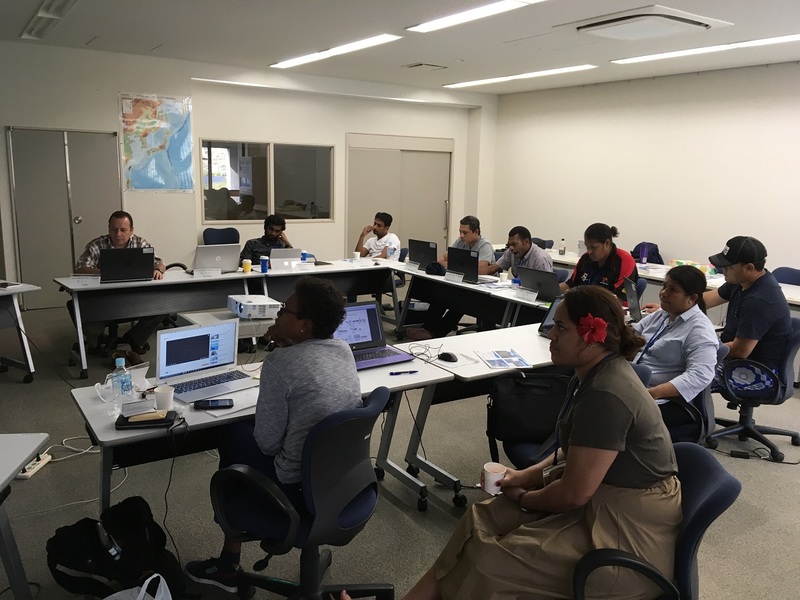 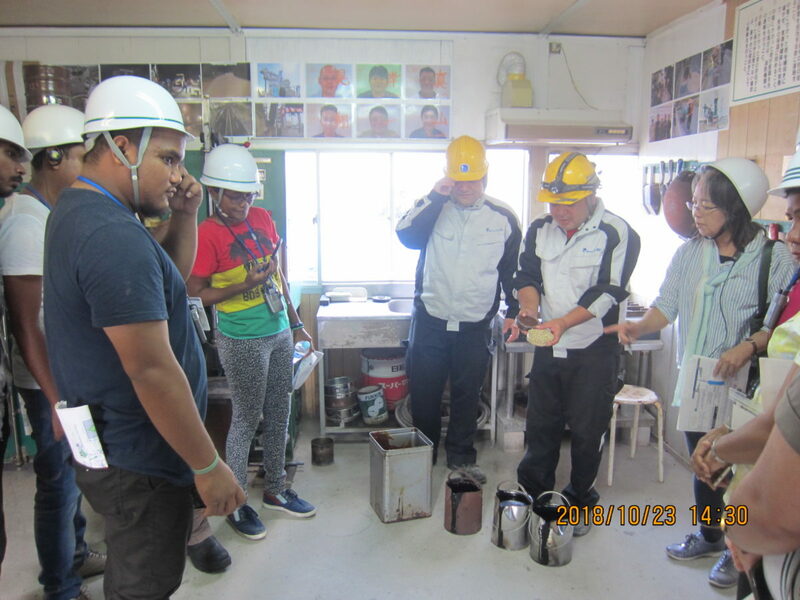 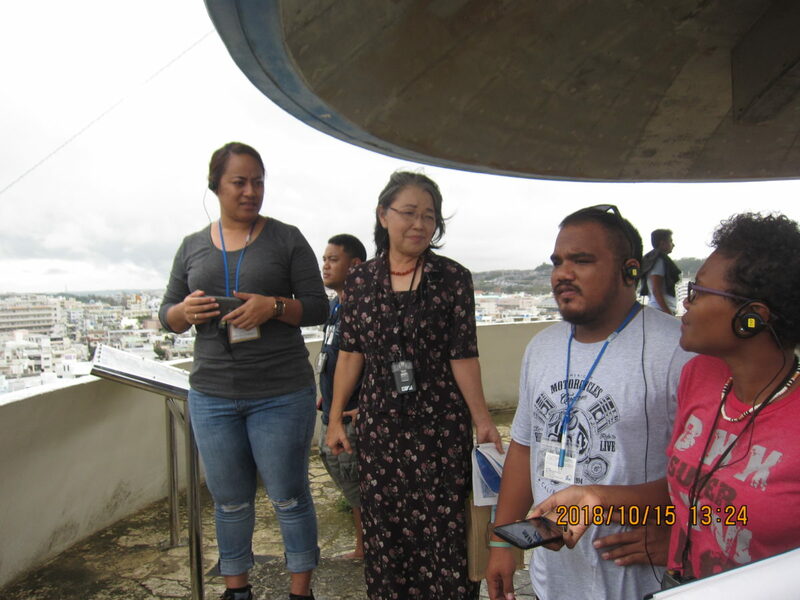 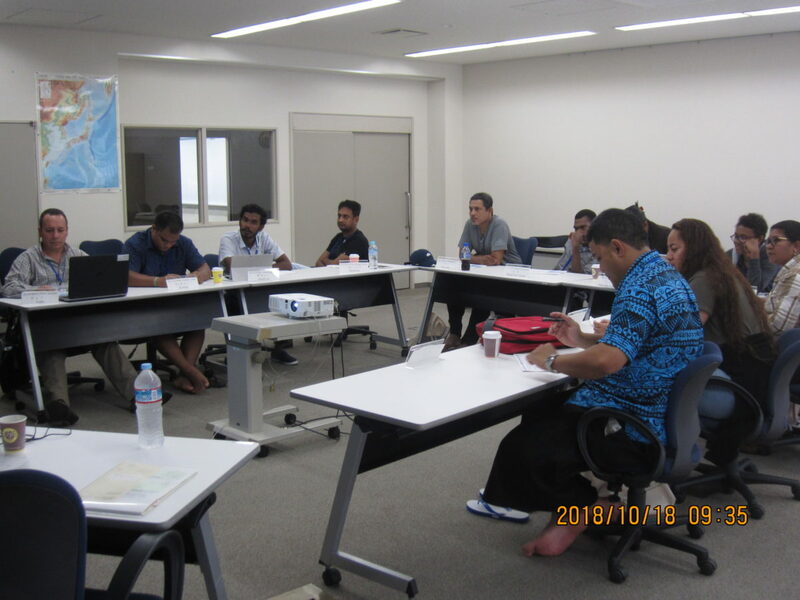 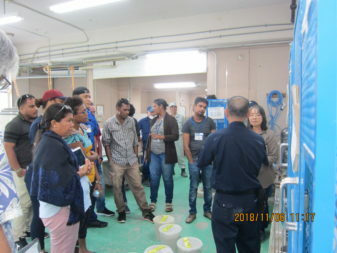 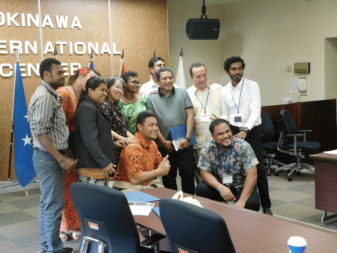 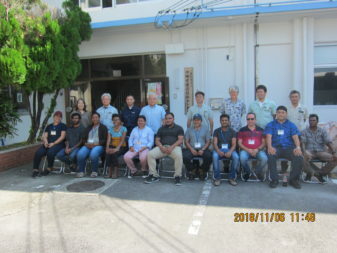 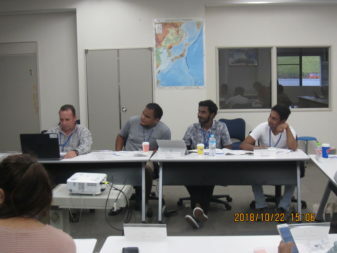 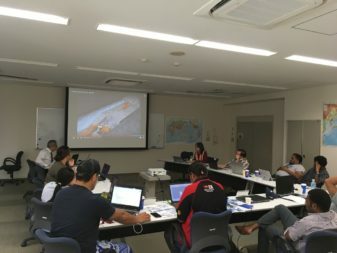 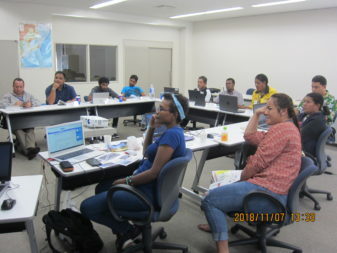 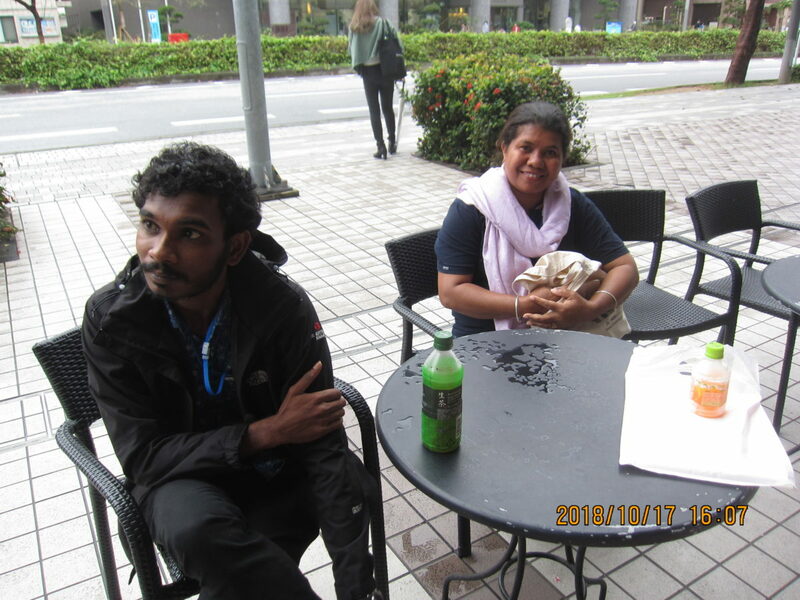 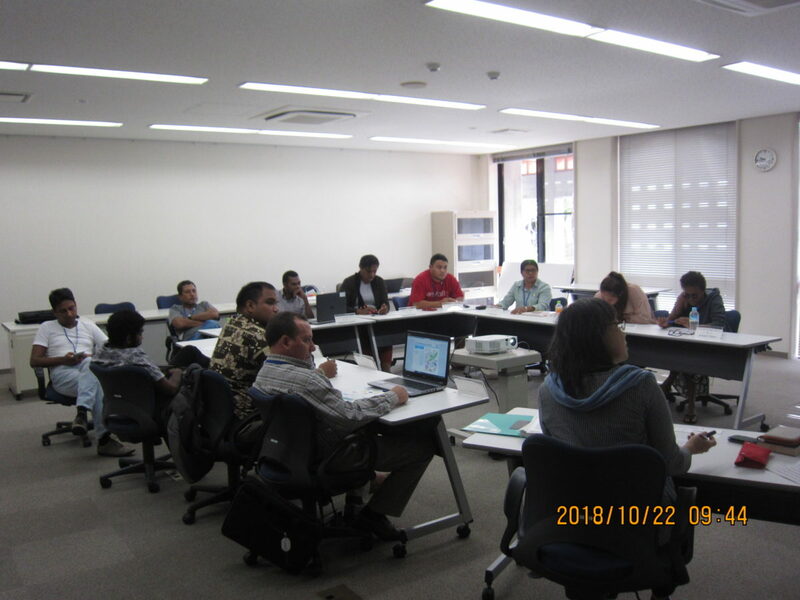 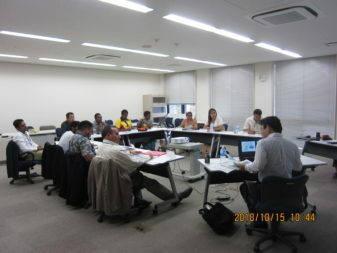 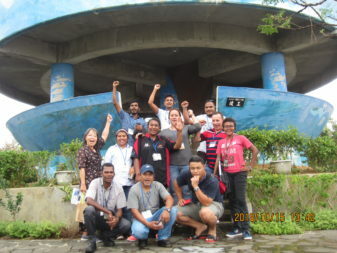 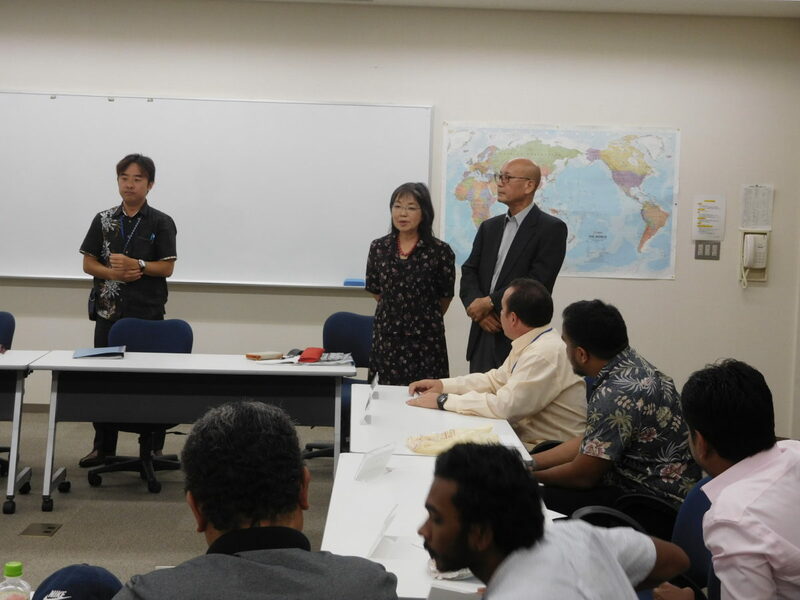 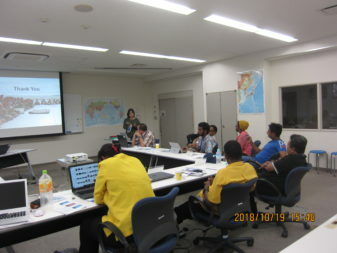 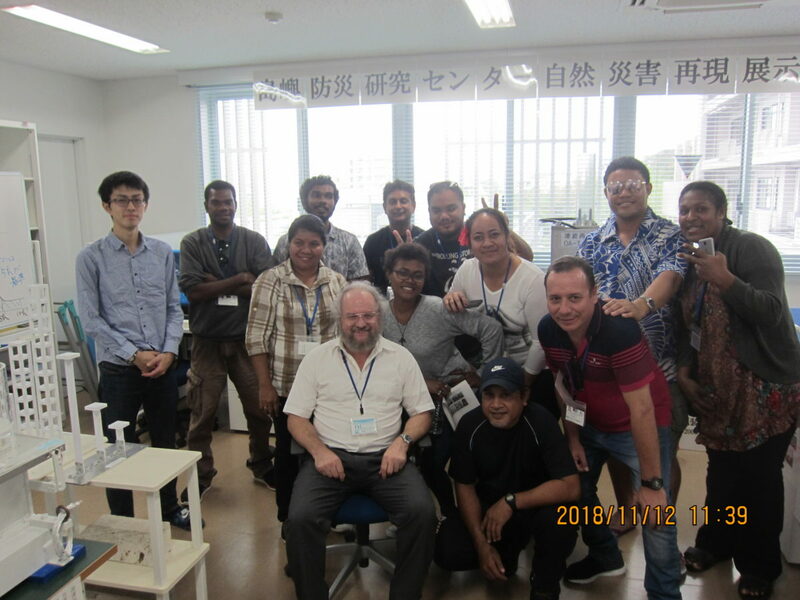 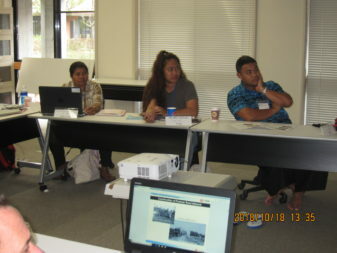 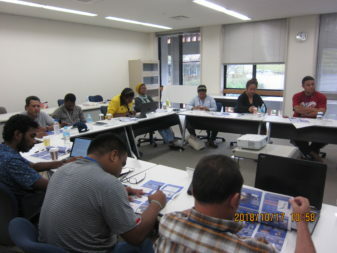 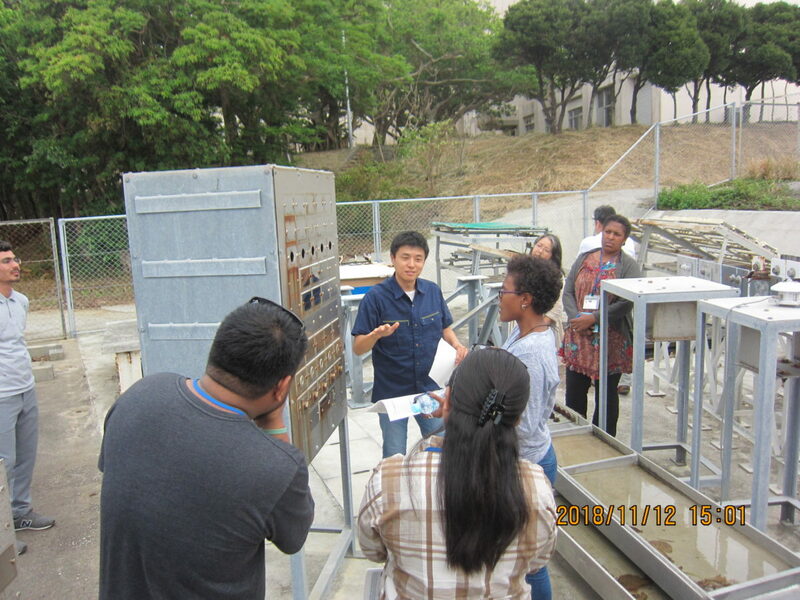 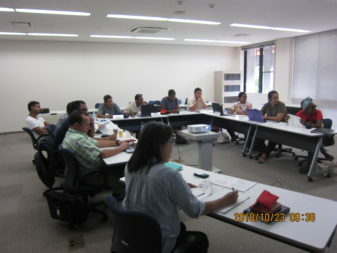 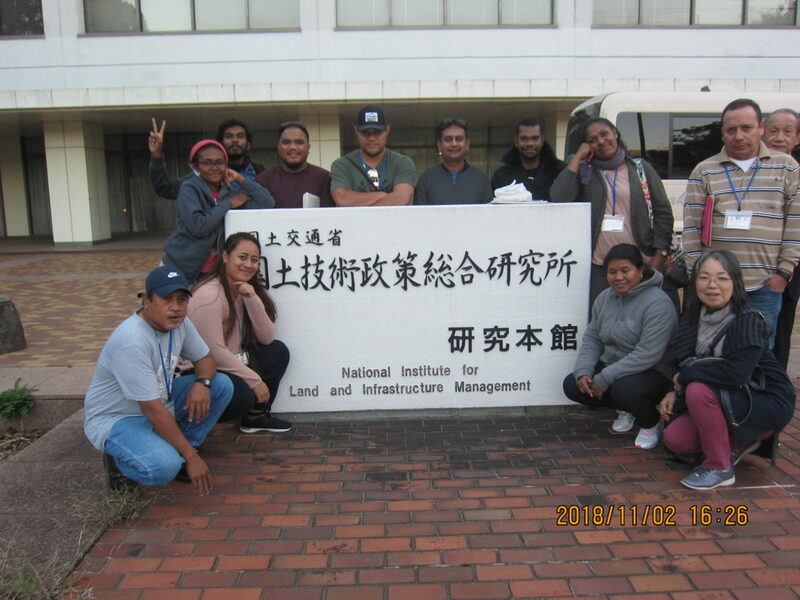 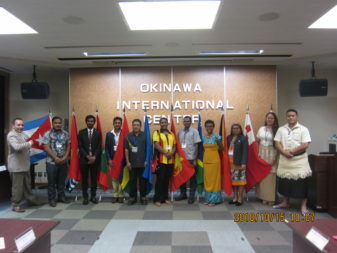 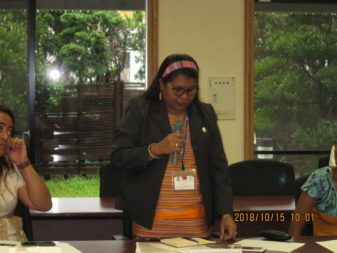 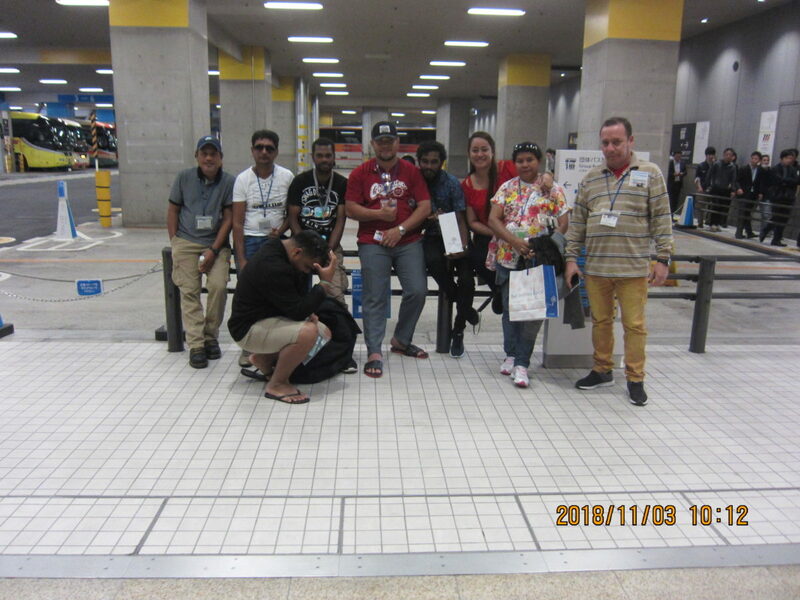 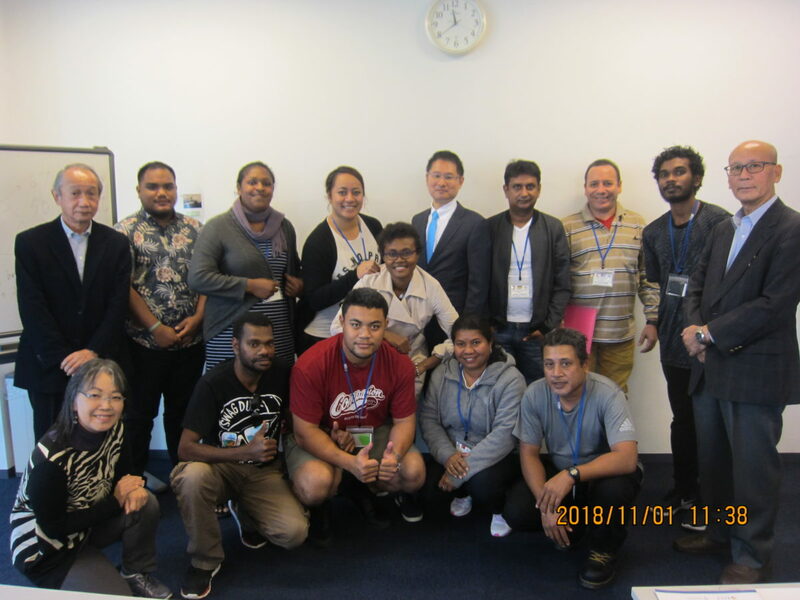 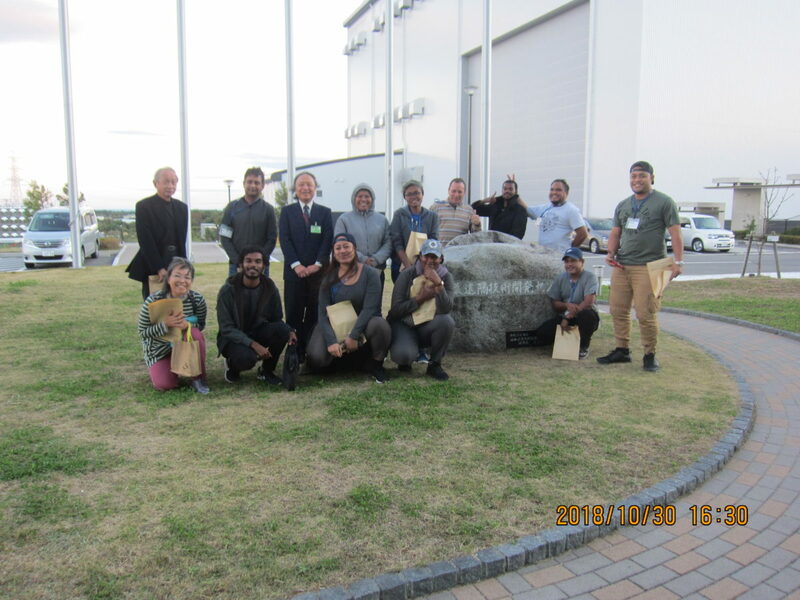 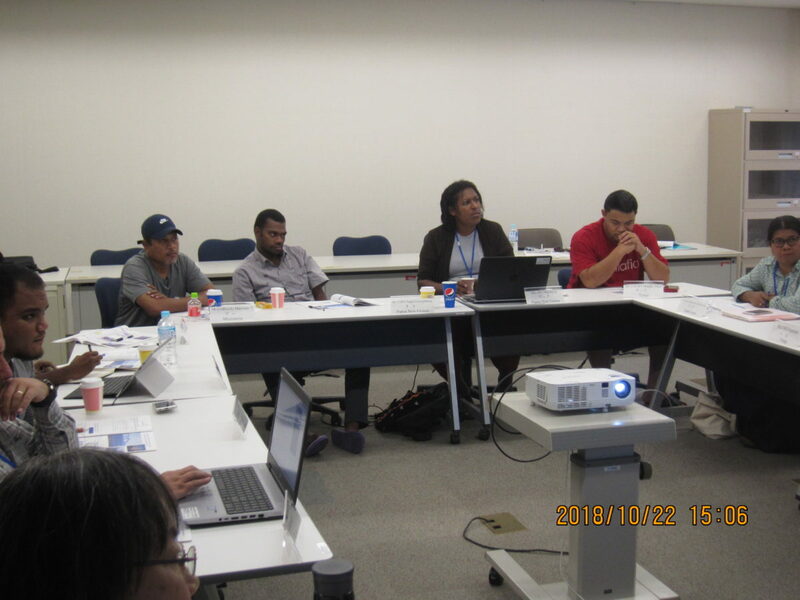 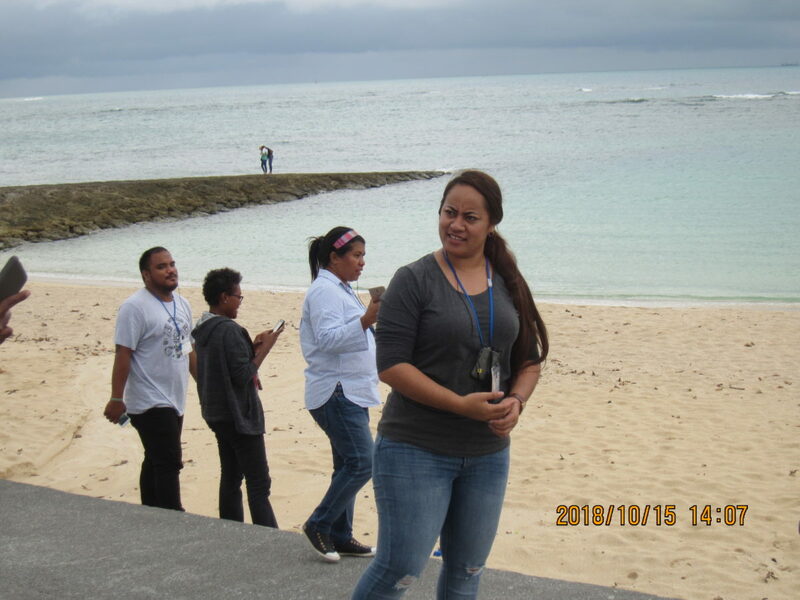 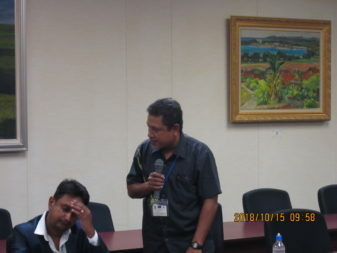 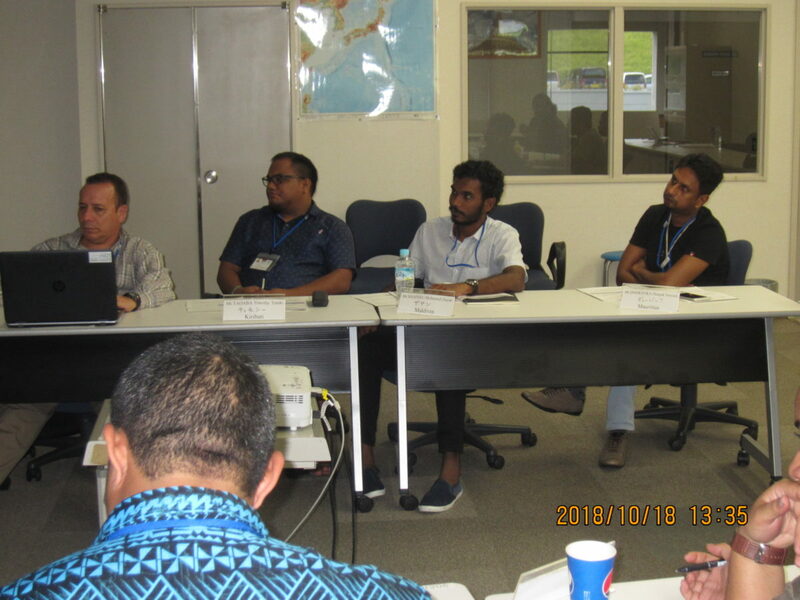 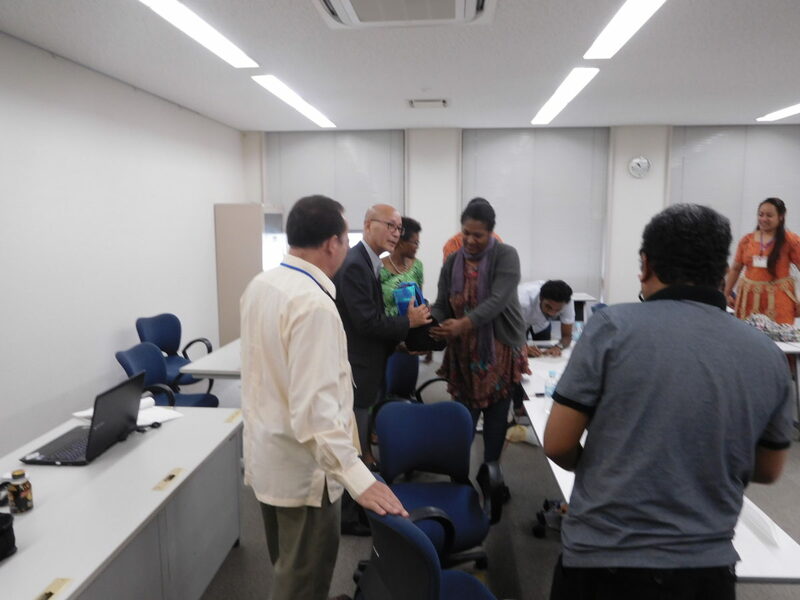 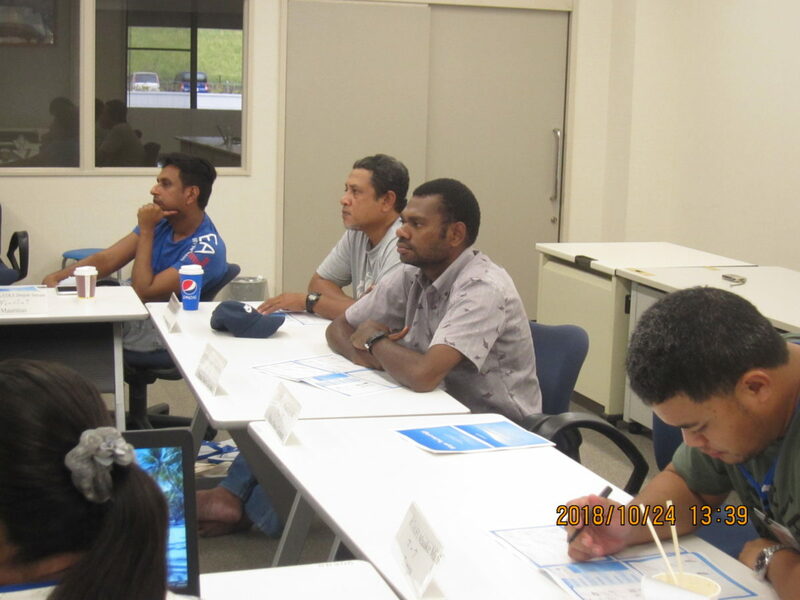 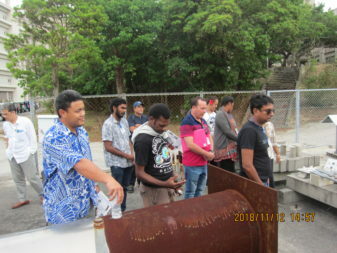 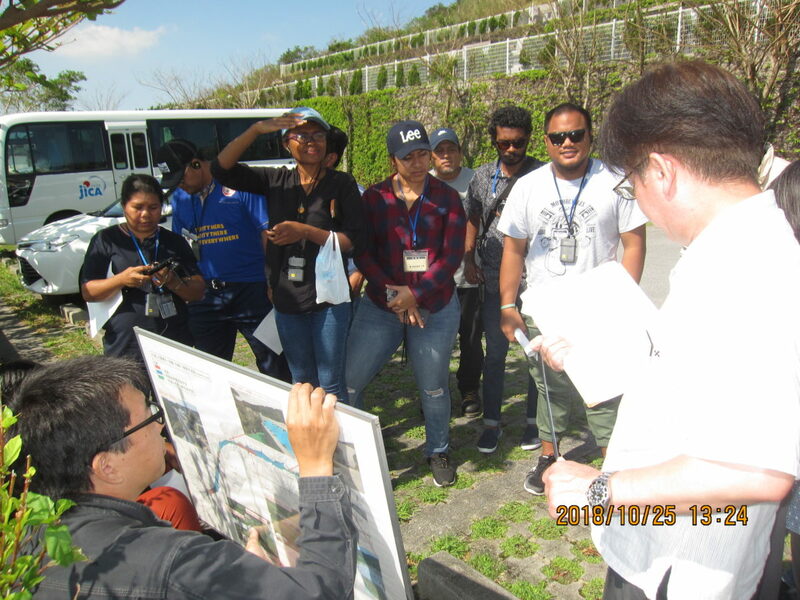 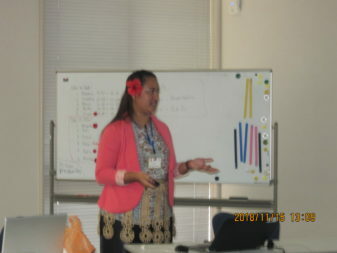 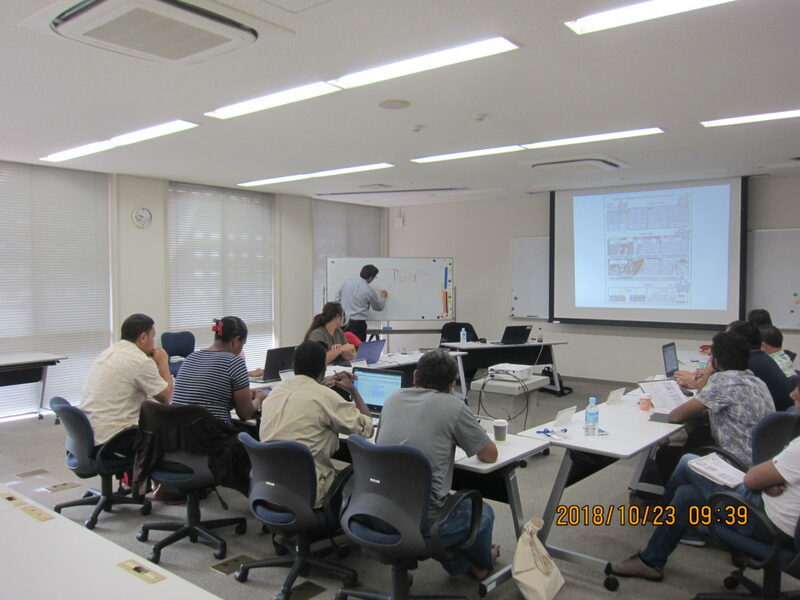 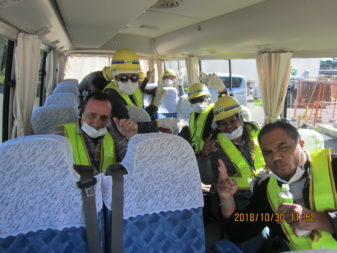 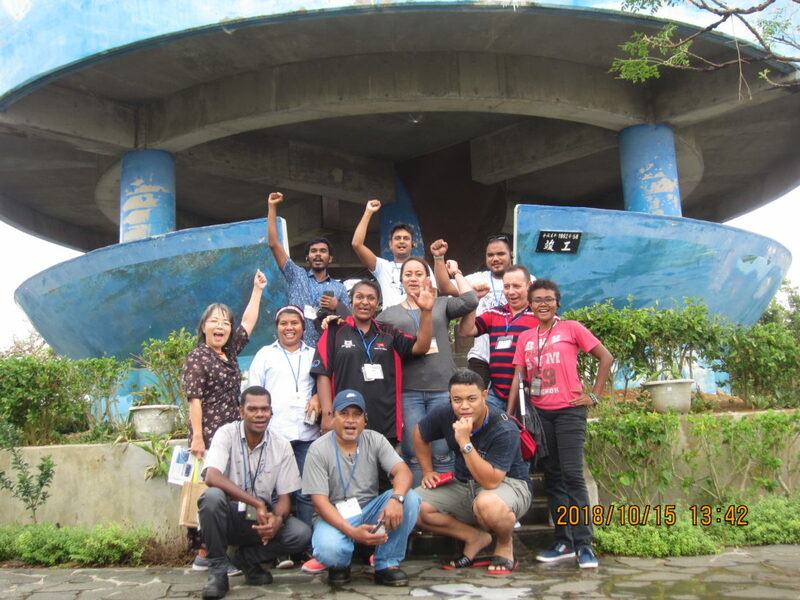 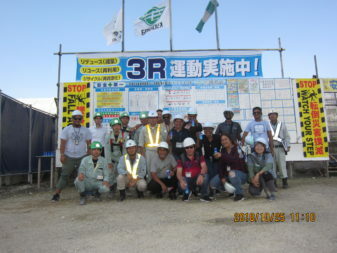 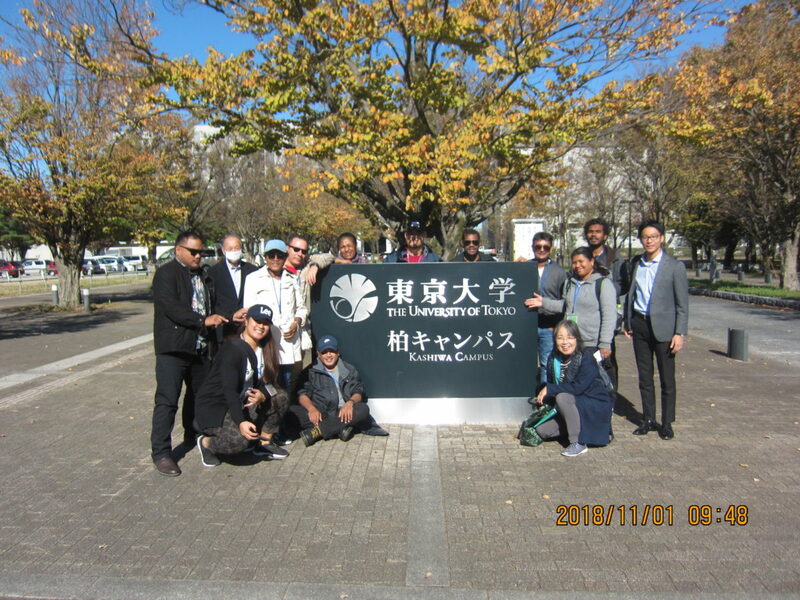 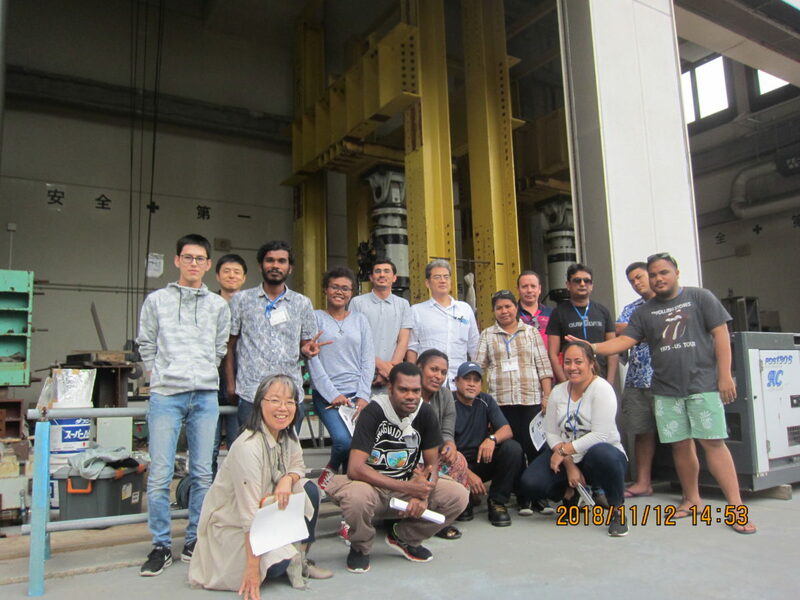 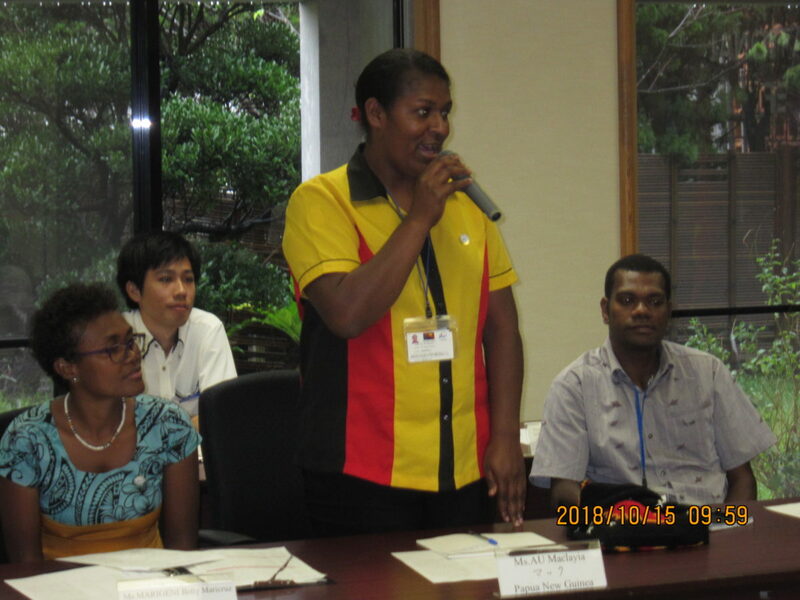 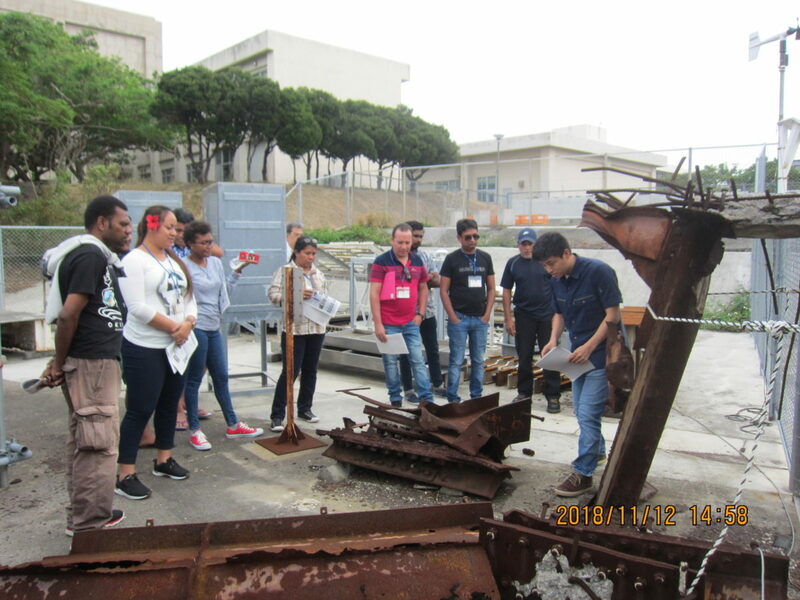 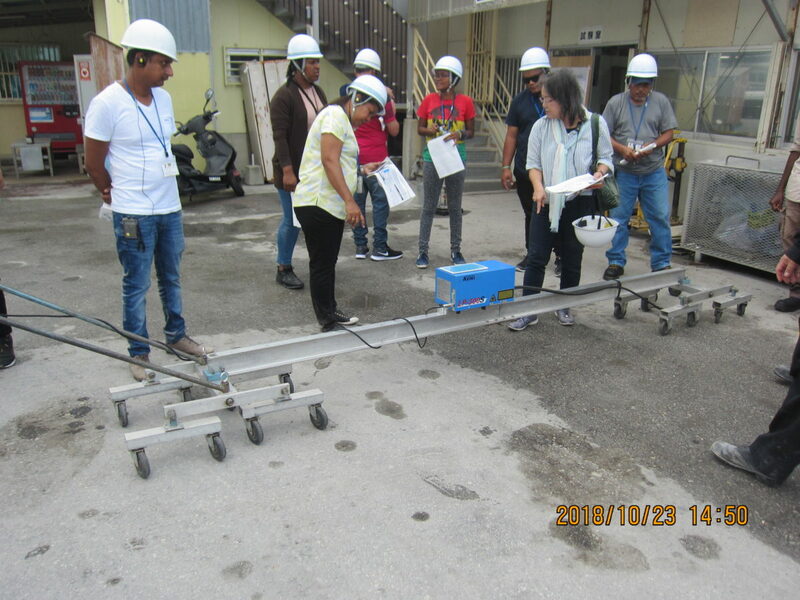 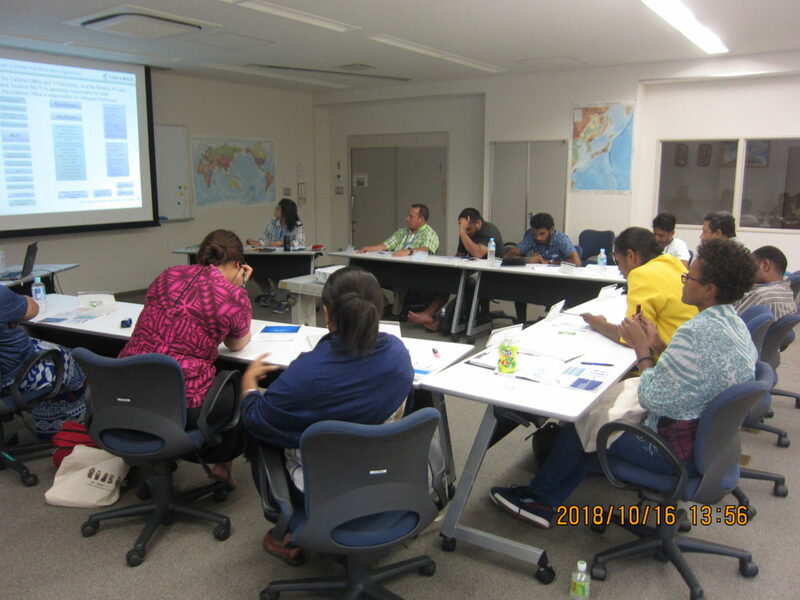 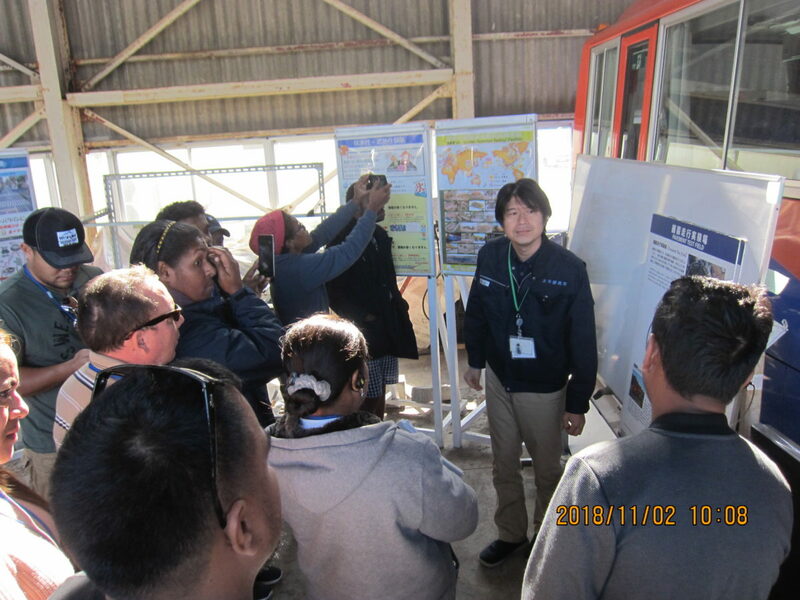 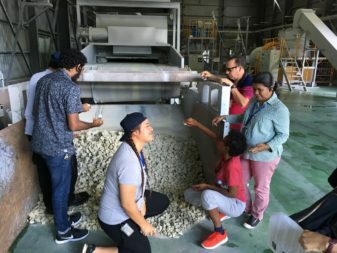 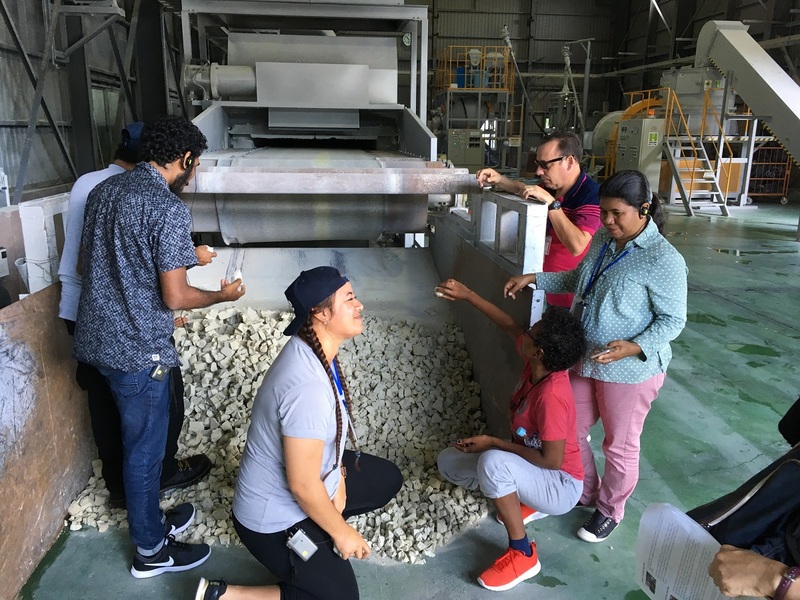 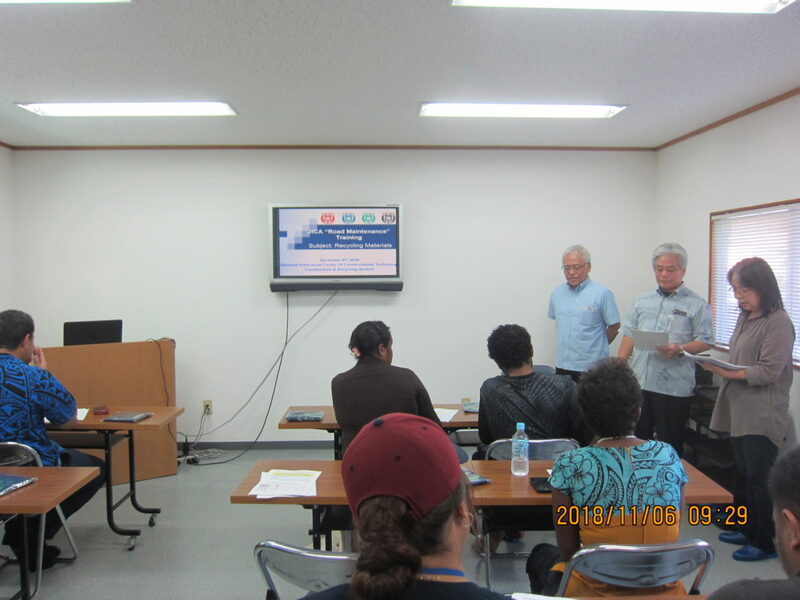 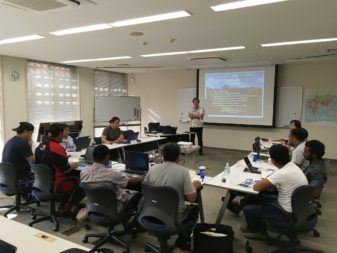 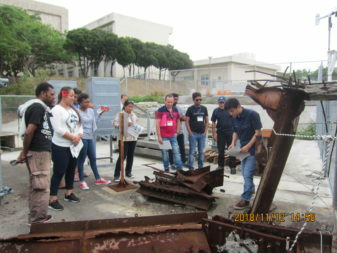 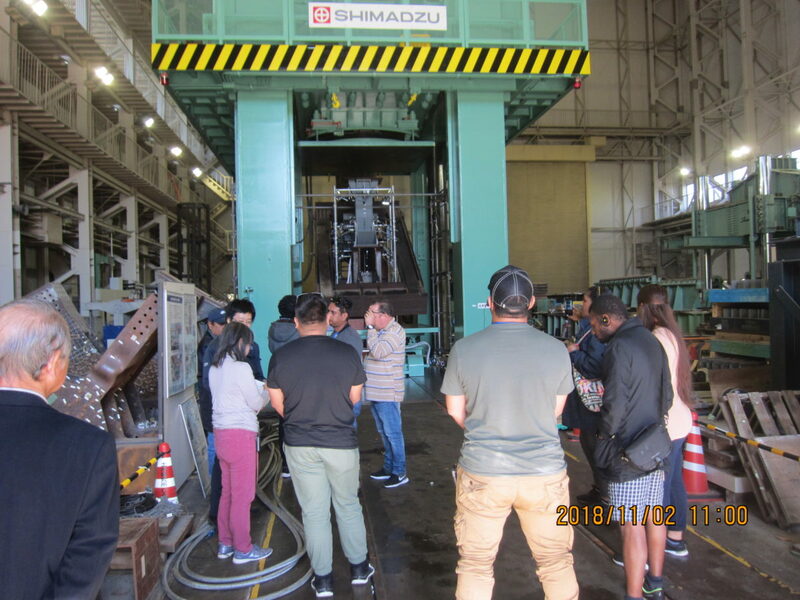 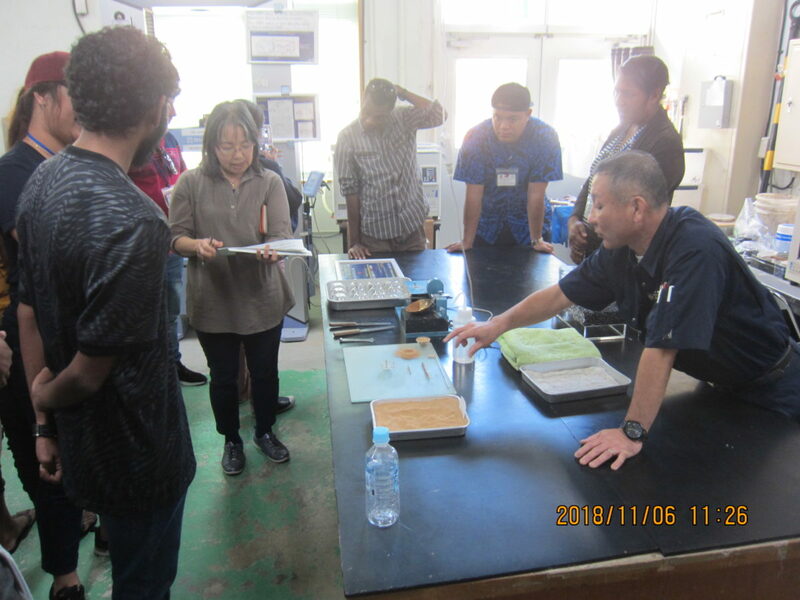 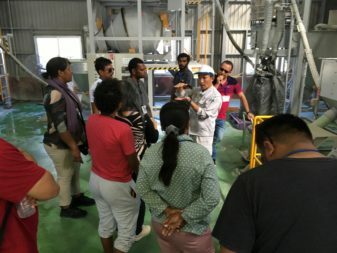 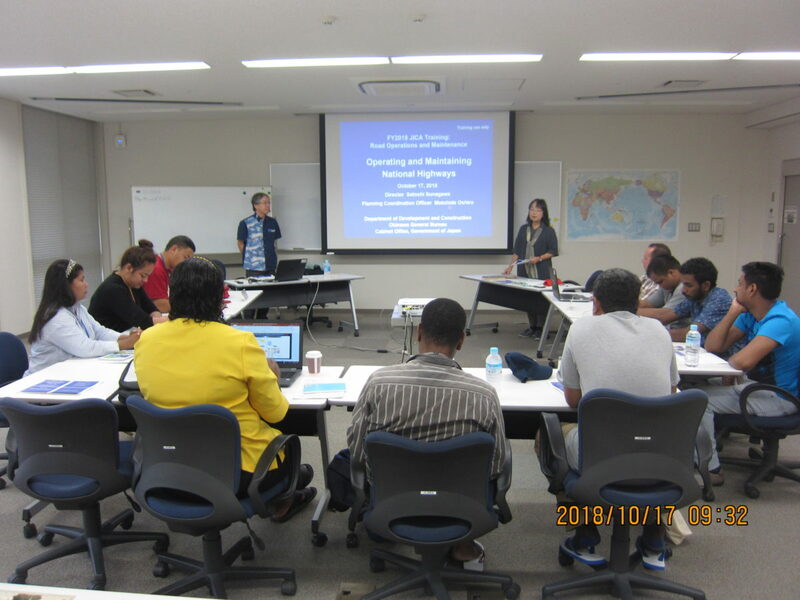 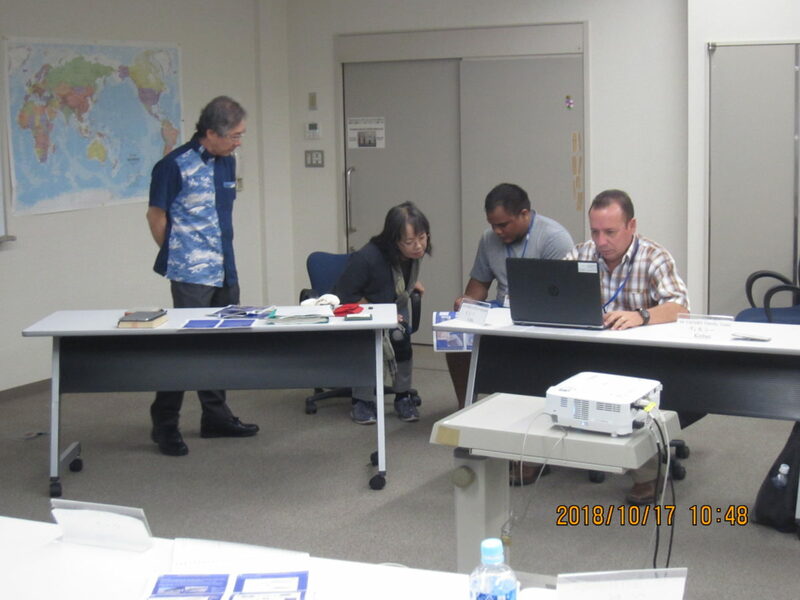 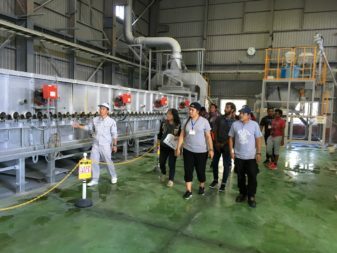 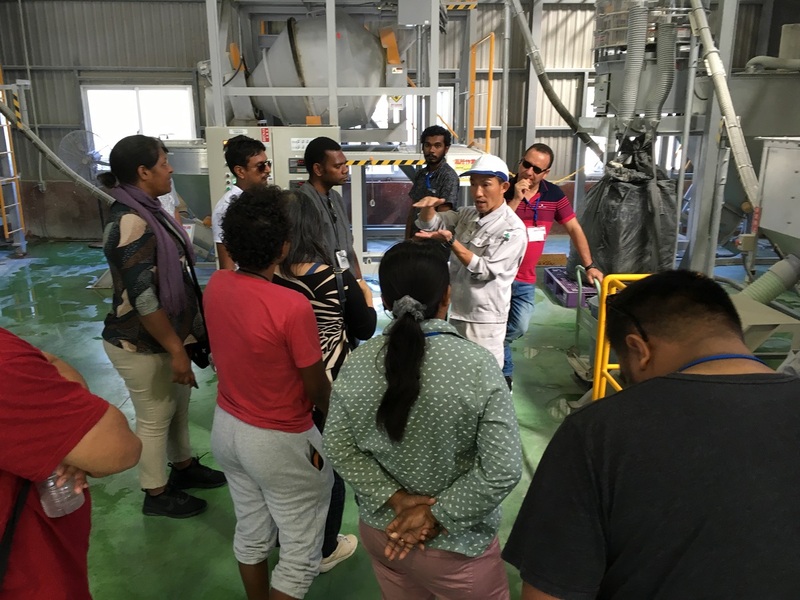 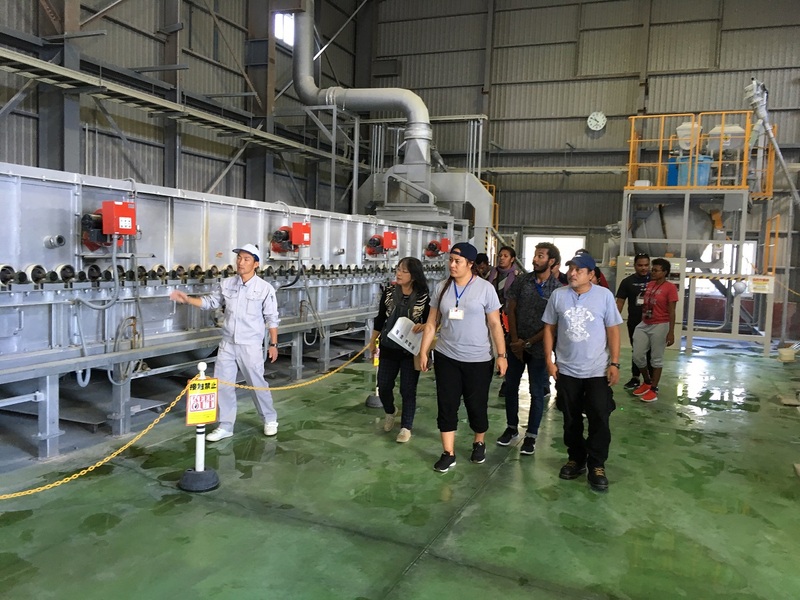 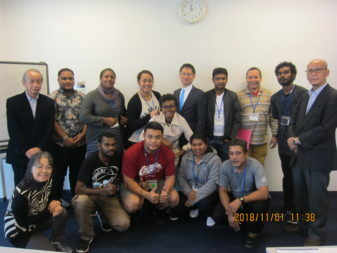 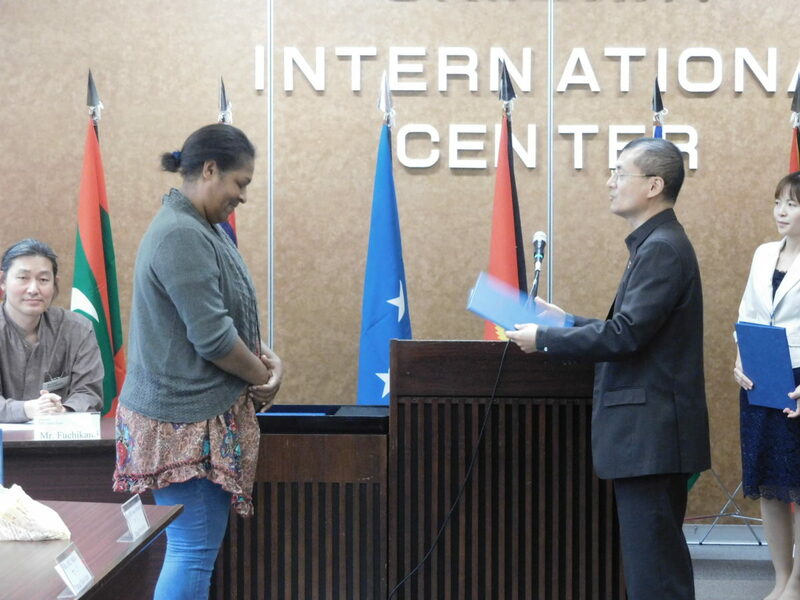 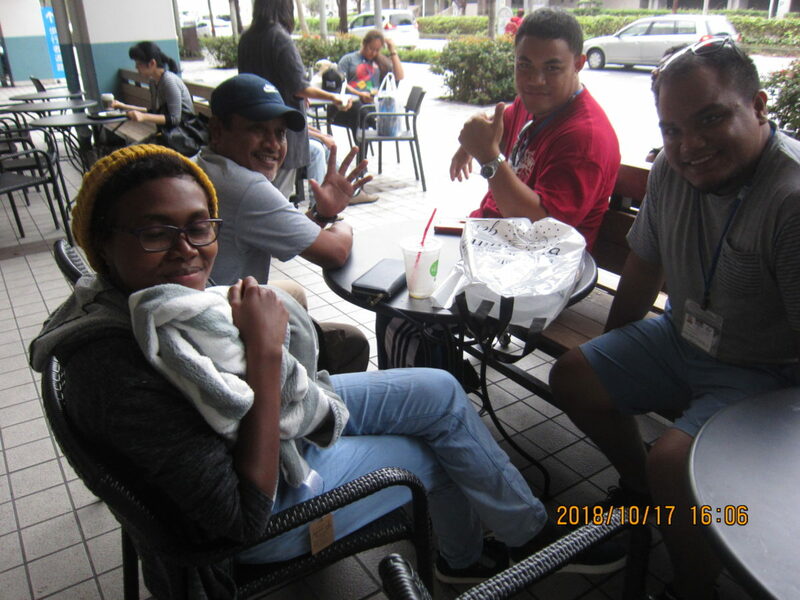 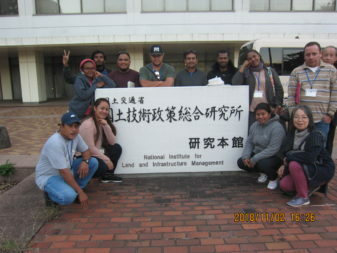 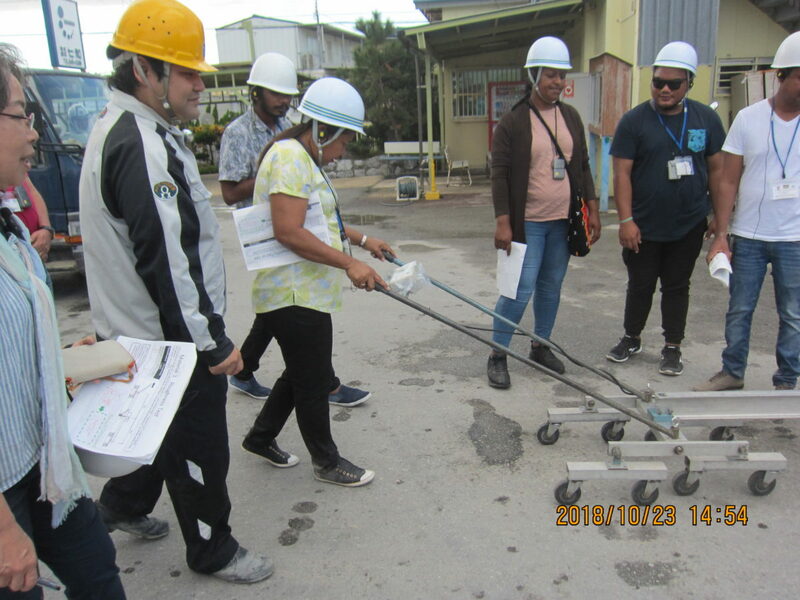 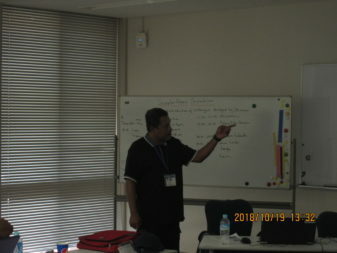 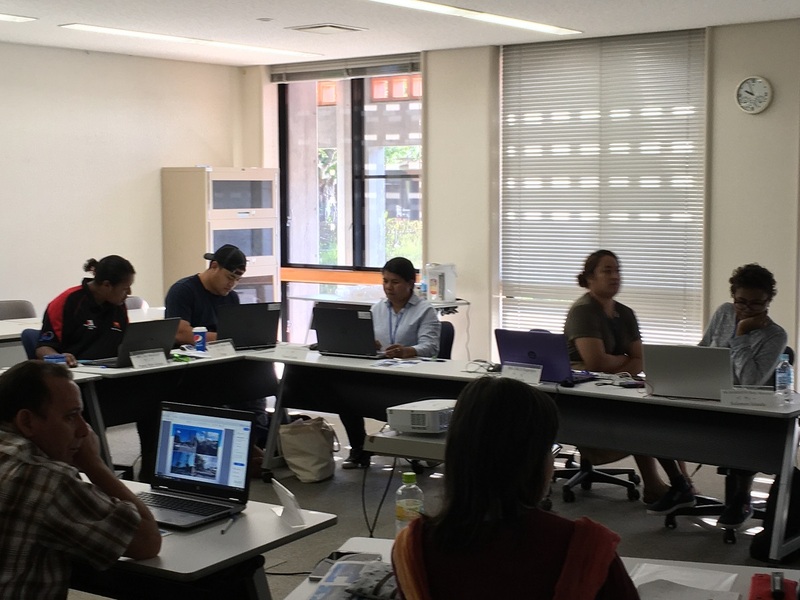 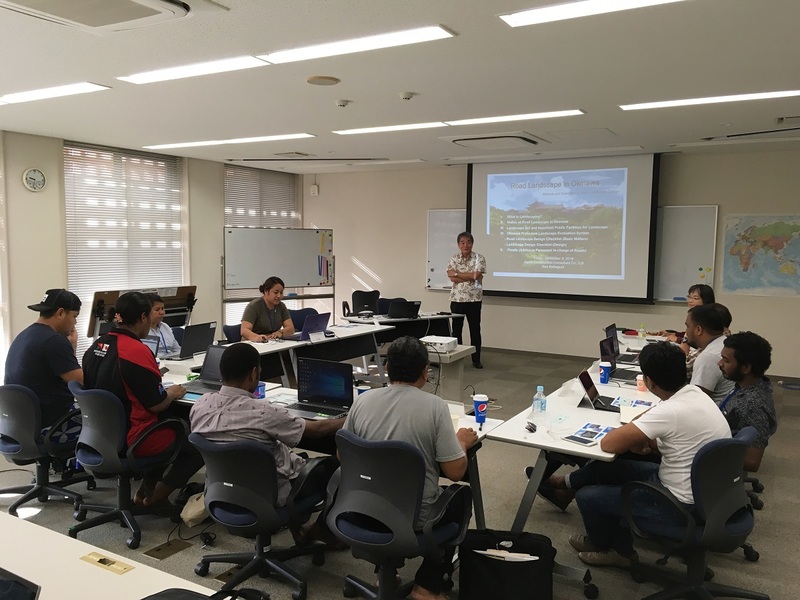 Participants learnt the conditions of road and administration system in Okinawa, routine maintenance duties, various projects, and authorization and permit. The participants showed a special interest in the authorization and shared some cases in their counters. 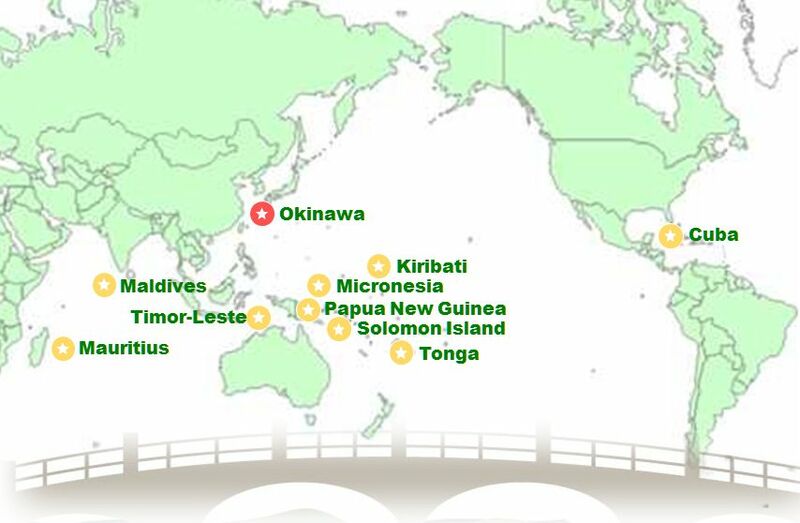 There are some countries who have not established legal structure as an enactment of road act. In the afternoon, Mr. Shinoda (Dr. Engineering, Professional Engineer, Authorized Concrete Diagnosis & Maintenance Engineer) delivered a lecture on “Corrosion-induced Damage due to Salt Attack and Durability of Concrete Structure” and “Basics of Concrete Pavement”. 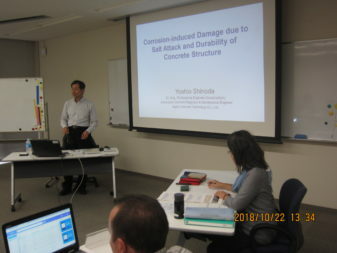 He started his lecture by asking questions about the basics of concrete. 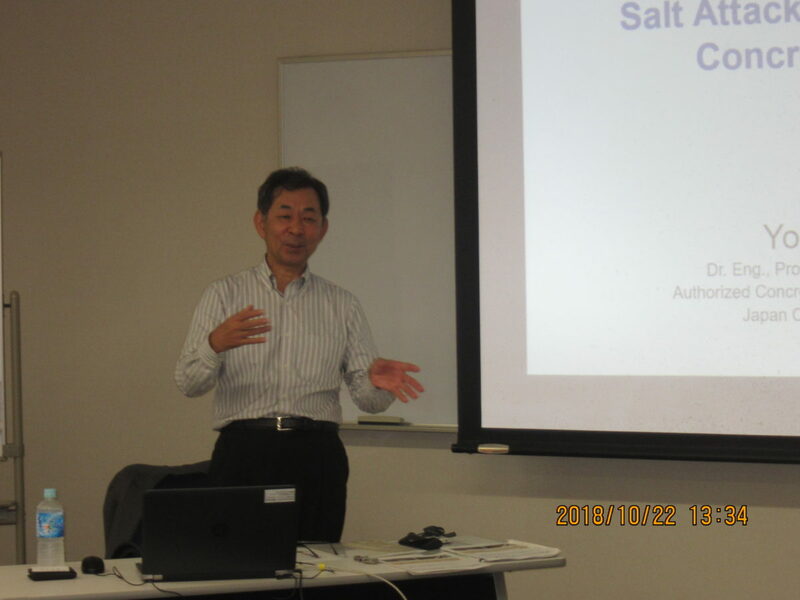 Then he continued explaining in detail the mechanism and progression of salt attack, contributing factors to deterioration and countermeasure technology against salt attack (e.g. 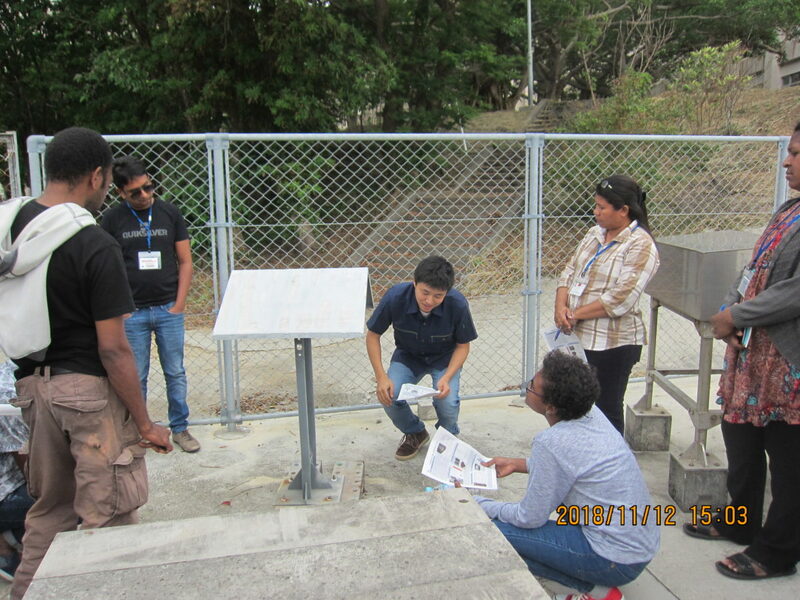 use of stainless reinforcement) from the perspective of durability of concrete, asking questions to participants at times. 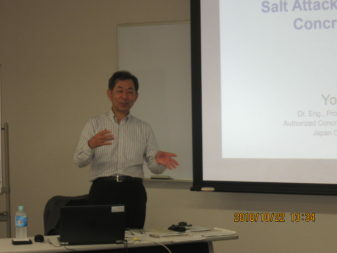 The participants showed their interest in criteria of salt attack and changes in deterioration factors. Then towards the end of lecture, the participants learned the basics of concrete pavement. This day was dedicated for country presentations (road conditions) of the participants. 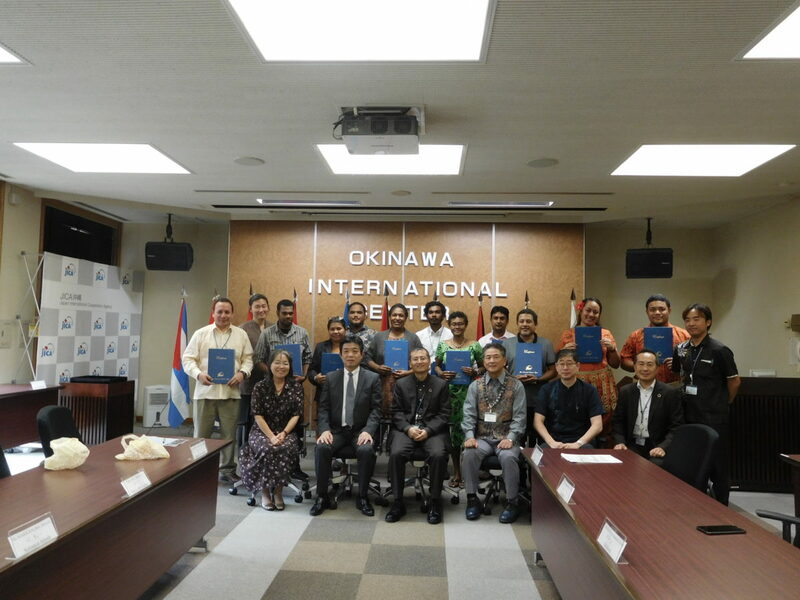 The session was joined by Mr. Yamanaka and Mr. Nishizato from Planning Unit, Civil Engineering Administration Section, Department of Civil Engineering and Construction of Okinawa Prefectural Government who is promoting globalization of enterprise activities of Okinawa. Questions raised by participants or audience including Mr. Nishizato after each presentation helped us find some common issues among countries. The title of morning lecture was “Natural Disaster Prevention System” given by Mr. Uehara, Chief of Disaster Prevention Section, Development and Construction Department, Okinawa General Bureau. 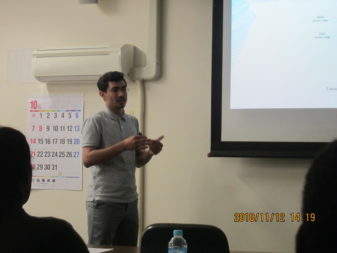 He explained about the system of disaster prevention against earthquake, tsunami, volcanic eruption, and severe rain. 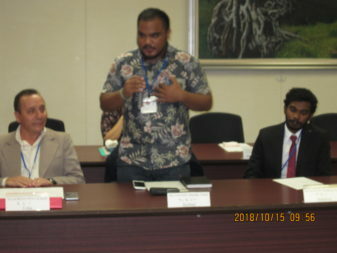 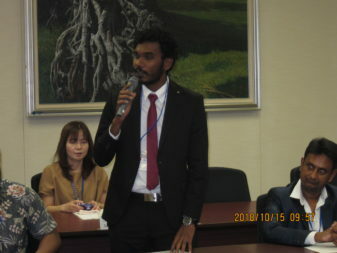 The participants shared the same concerns and tried to understand the difference in the system of disaster prevention and response between their countries and Japan. 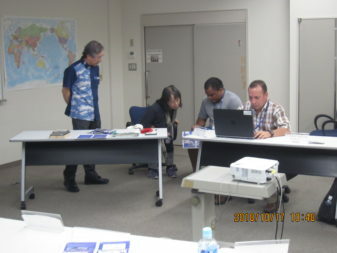 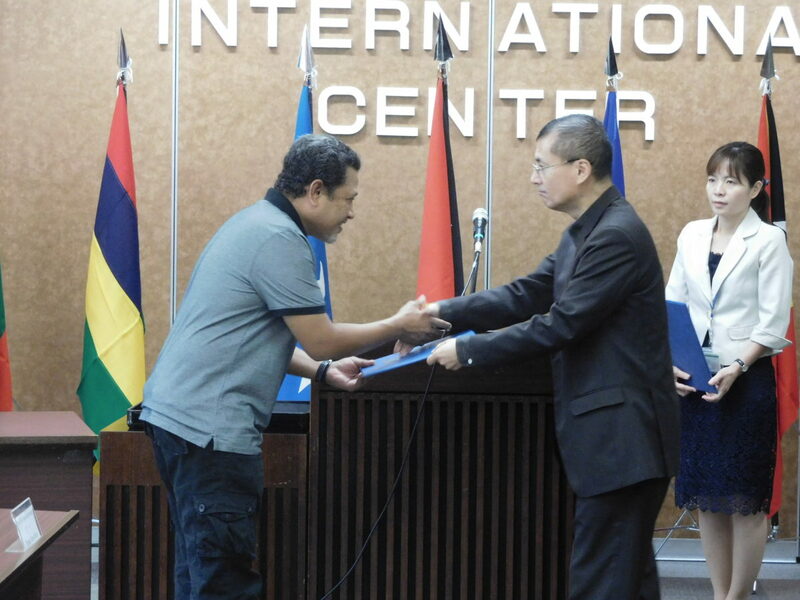 They asked for administrative manual (translated into English) for disaster response. As globalization is in progress, we found that some local municipalities translated their disaster response guideline for local citizens into English. 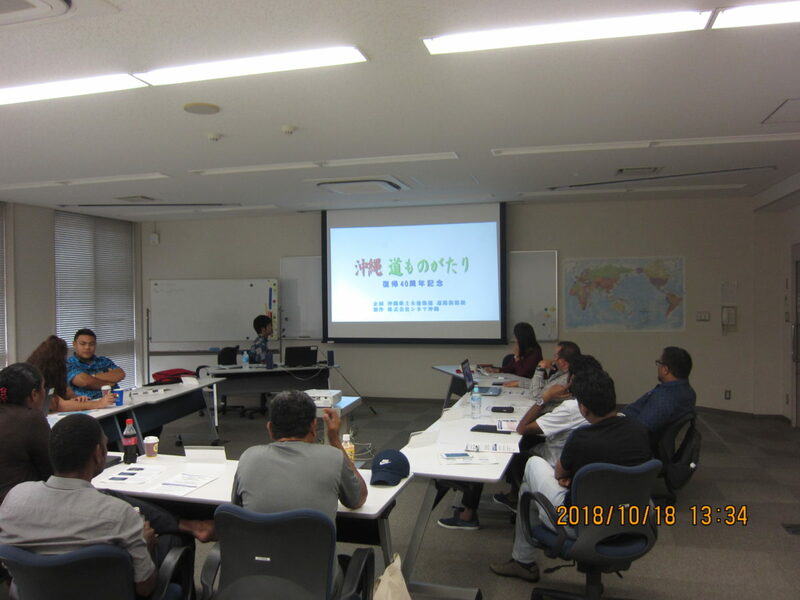 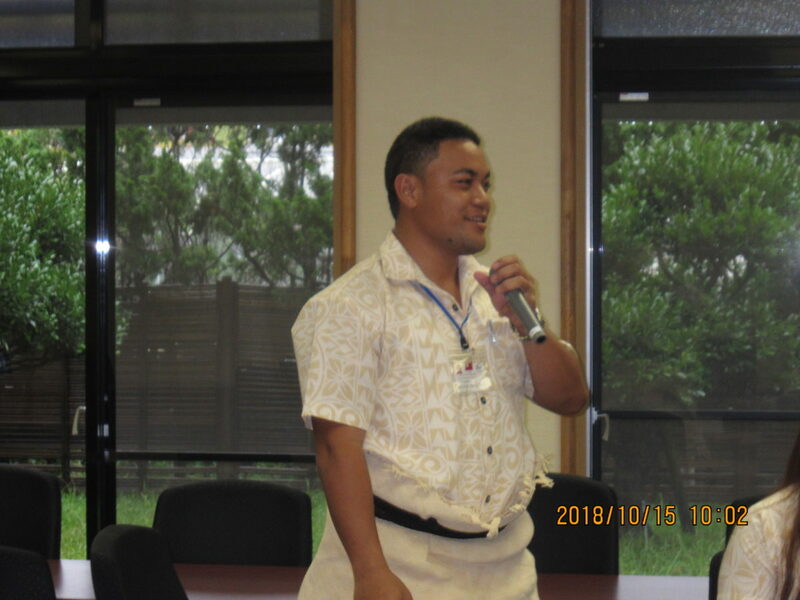 In the afternoon, a lecture, “History of Road Maintenance in Okinawa Prefecture, Future Road Plan” was delivered by Mr. Ina, Chief of Planning and Coordination Unit, Road and Street Maintenance Section, Department of Civil Engineering and Construction, Okinawa Prefectural Government. 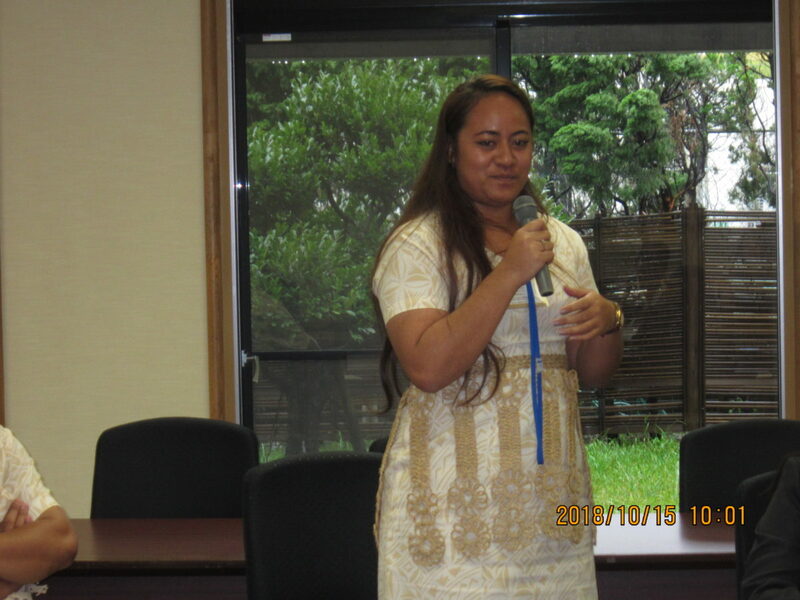 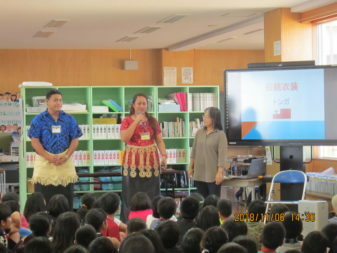 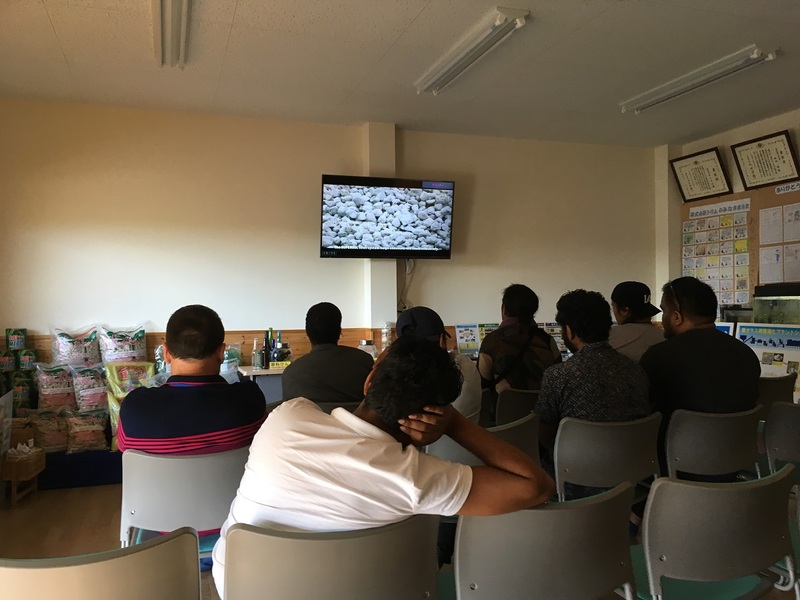 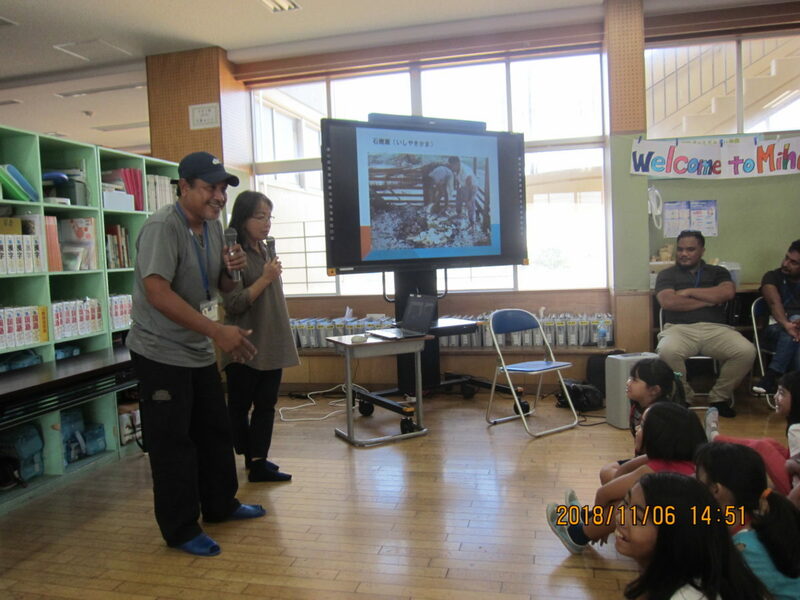 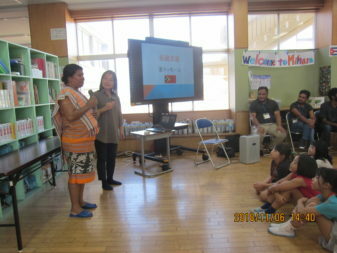 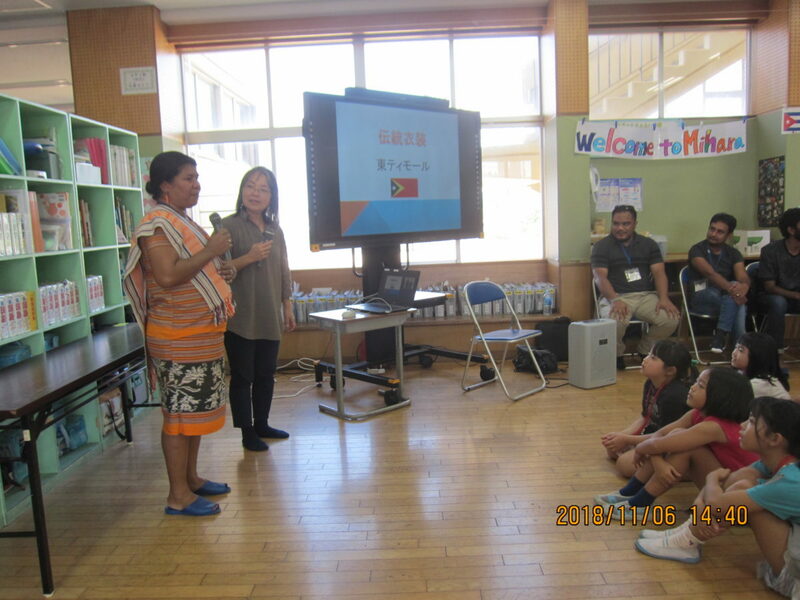 He first showed a video of “Road Story in Okinawa” narrated by coordinator Ms. Teruya. 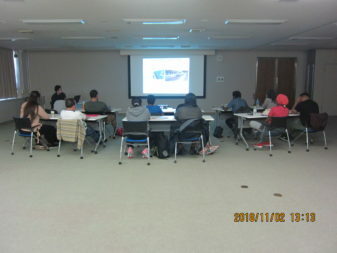 Then he discussed about the transition of road maintenance of Okinawa in postwar period and after Okinawa’s reversion to Japan. 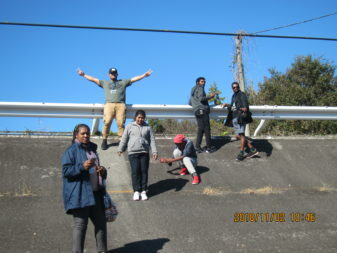 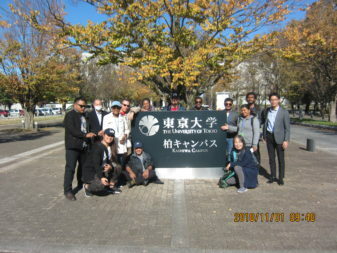 The participants also learned about the future visions of Okinawa. 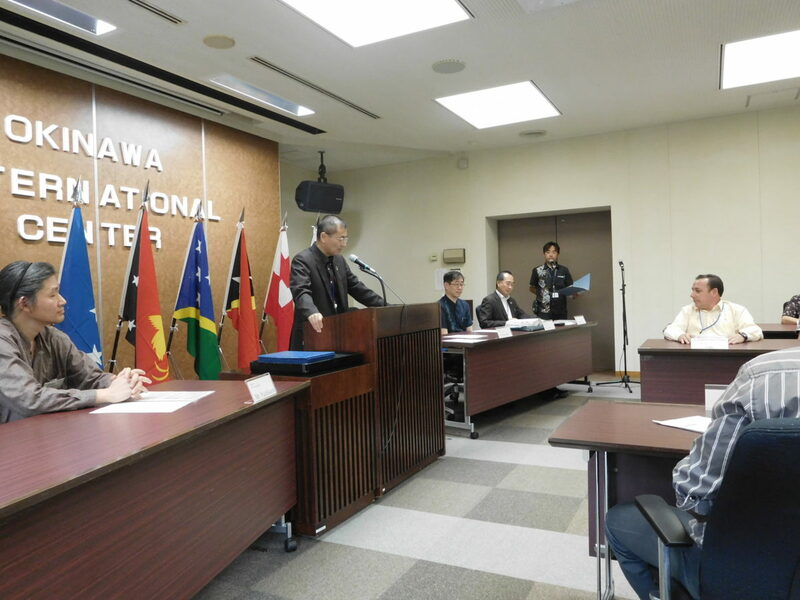 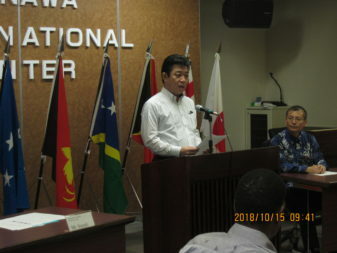 The lecture in the morning was titled “Operating and Maintaining National Highways” delivered by Mr. Sunagawa, Director of Department o Development and Construction, Okinawa General Bureau. Participants were listening to the lecture with high interest especially in routine maintenance (e.g. 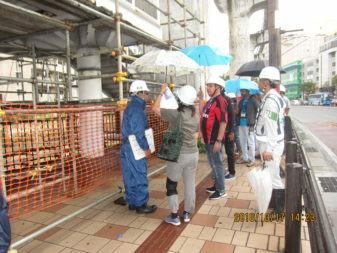 inspection) and emergency response. 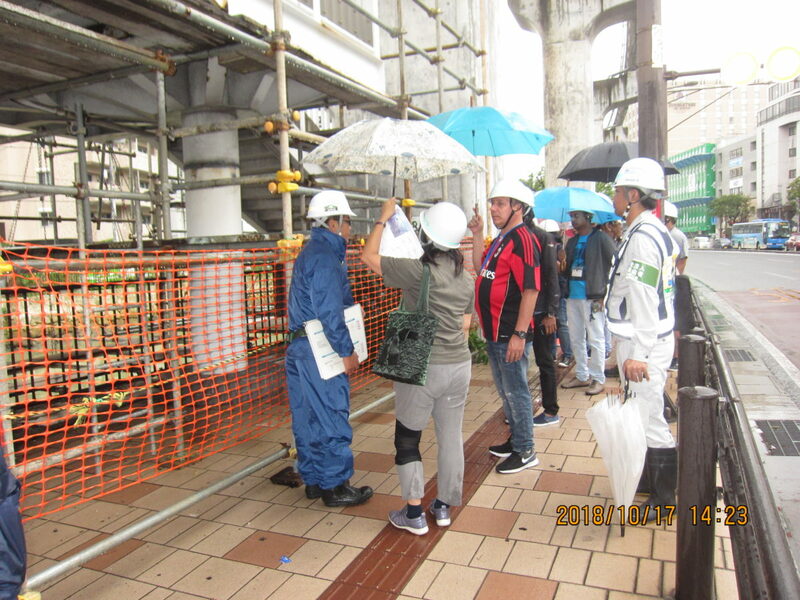 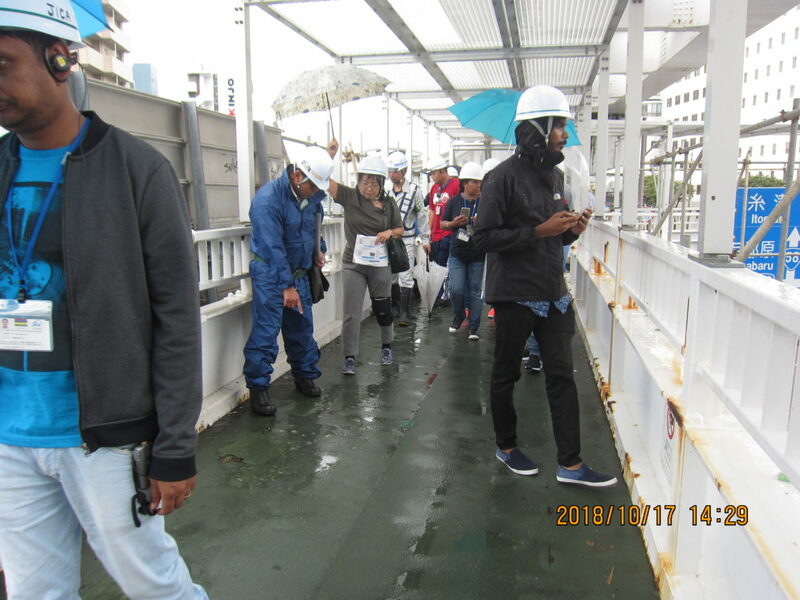 The participants went to see repair work of Izumizaki Pedestrian Bridge, a work ordered by Okinawa General Bureau in the afternoon. Rain had continued falling since the morning, so we had a briefing given by the contractee of the work with opening umbrellas. The participants were asking questions such as guarantee period or about scaffold. 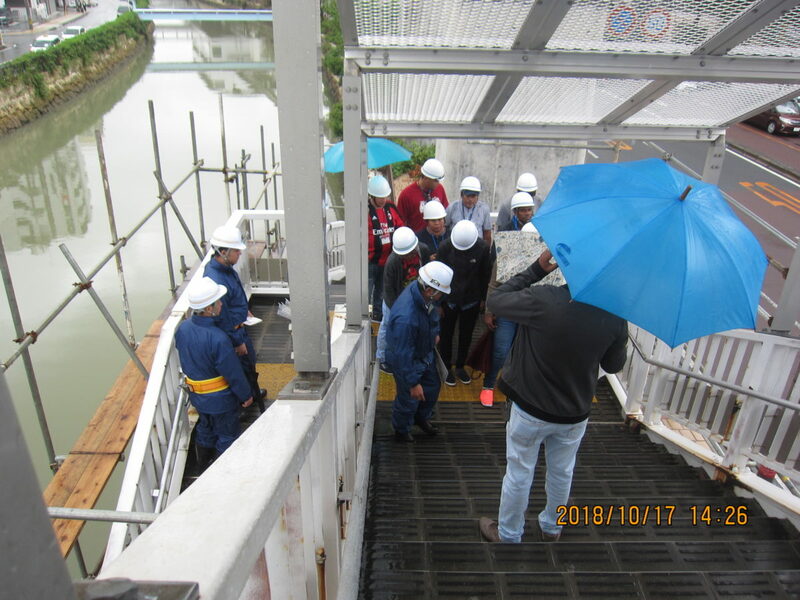 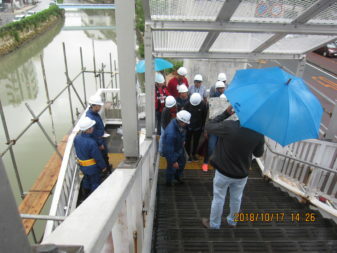 Then, the group walked on the bridge observing the condition of it, and asking specific questions such as how to select a method of repair depending on the degree of corrosion. In the morning, Dr. Yabuki, Emeritus Professor at University of the Ryukyus, delivered a lecture on “Basic Concept of Infrastructures”. Participants were listening attentively to his lecture. He gave some examples in Okinawa (e.g. Irabu Great Bridge) and in Tokyo (e.g. Tokyo Sky Tree). 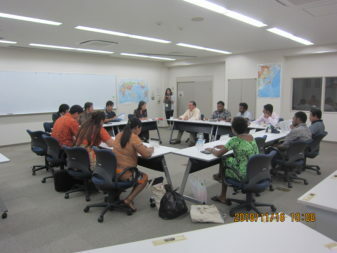 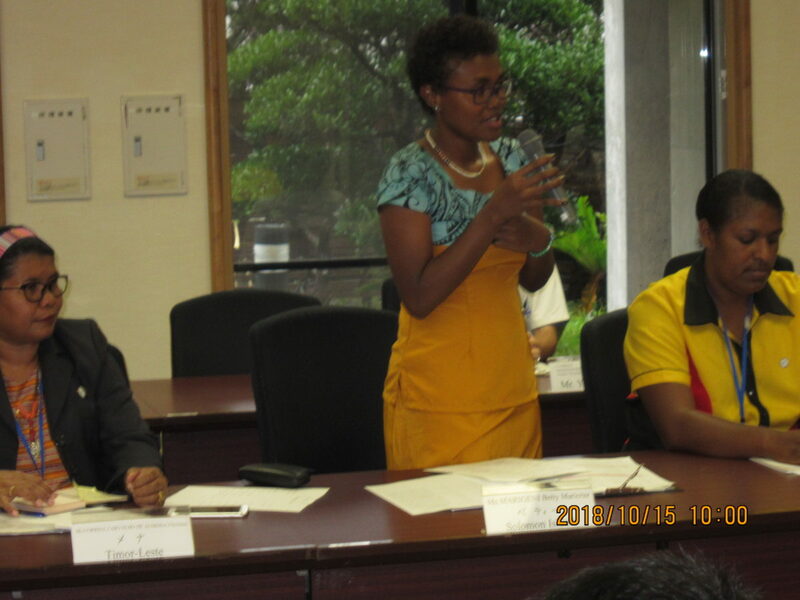 At the end of the lecture, Dr. Yabuki led a discussion with participants. In the afternoon, Mr. Mochizuki, Planning Coordination Officer at Department of Development and Construction, Okinawa General Bureau, Cabinet Office, delivered a lecture, “Road Network of Japan and Okinawa”. 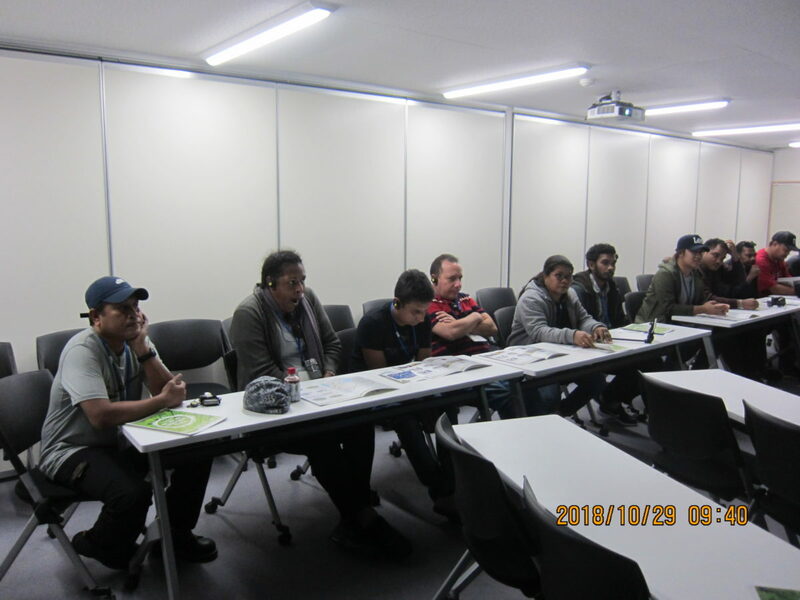 Participants were interested in the topic and asked many questions after the lecture. 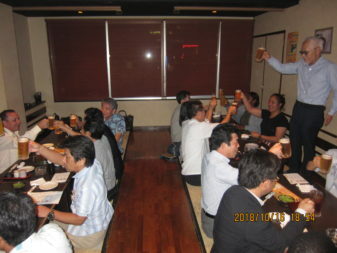 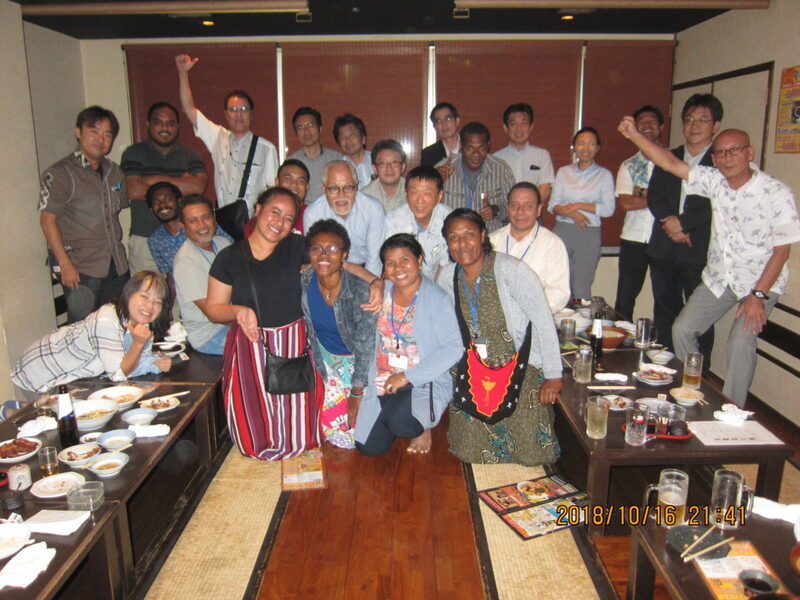 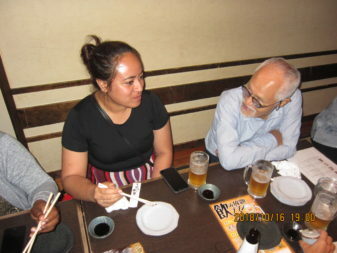 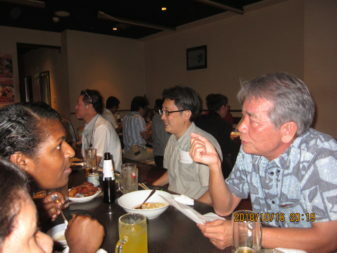 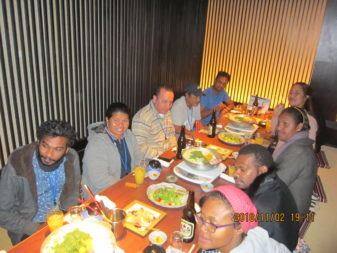 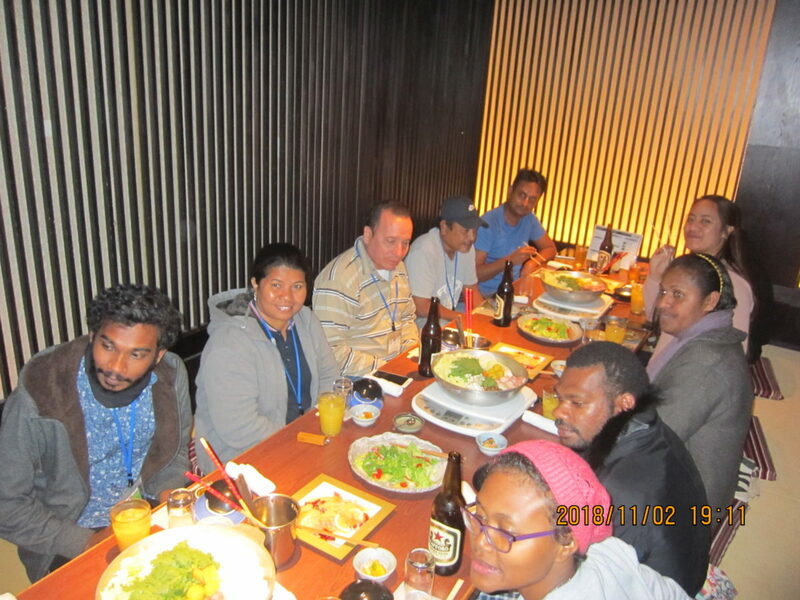 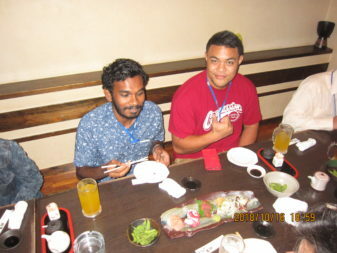 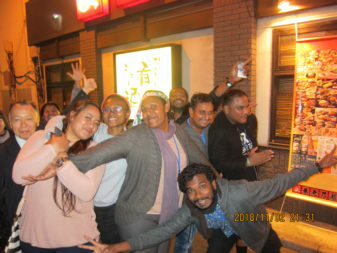 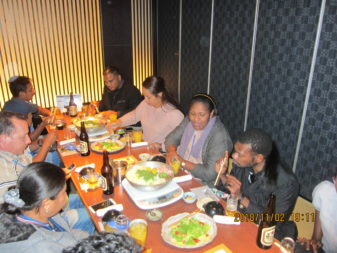 In the evening, NPO Green Earth hosted a welcome party for the participants in a restaurant in Naha city. The party was joined by the lecturers of our training who belong to national government, Okinawa prefectural government, university and private corporations. 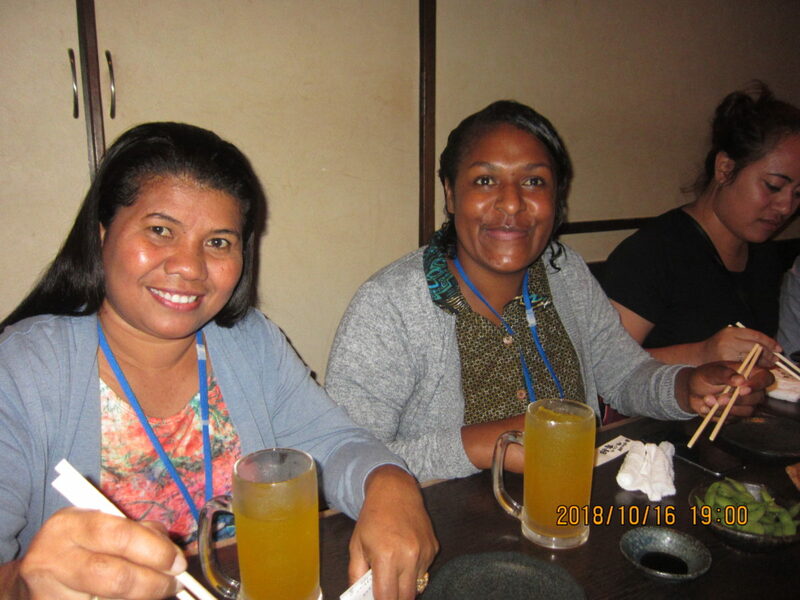 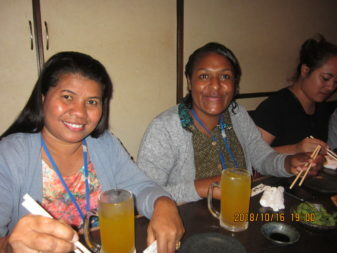 We all enjoyed the joyous evening together with local foods and drinks (some enjoyed the taste of Orion Beer and Awamori!). First day of the training. 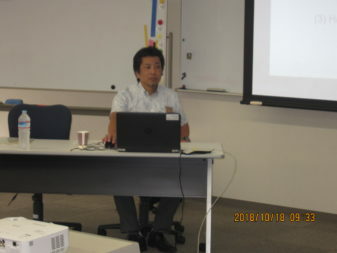 After opening ceremony in the morning (started at 9:30), Mr. Suzuki, representative executive of NPO Green Earth, gave a introductory lecture about the road conditions of Okinawa. 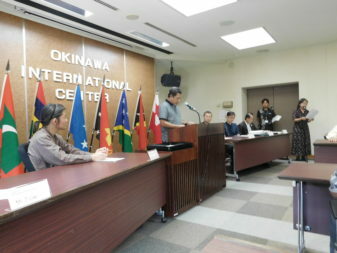 He explained not only about the roads but also the current situation and issues existed in Okinawa. The participants were listening carefully to the lecture translated by Ms. Teruya, and took notes down. In the afternoon, the group went to Kakazu highland where they learned about the harsh battle fought at that site during the last Pacific war, and saw US Marine Corps Air Station Futenma from the observatory. Then they moved to Tropical Beach and enjoyed strolling around there. 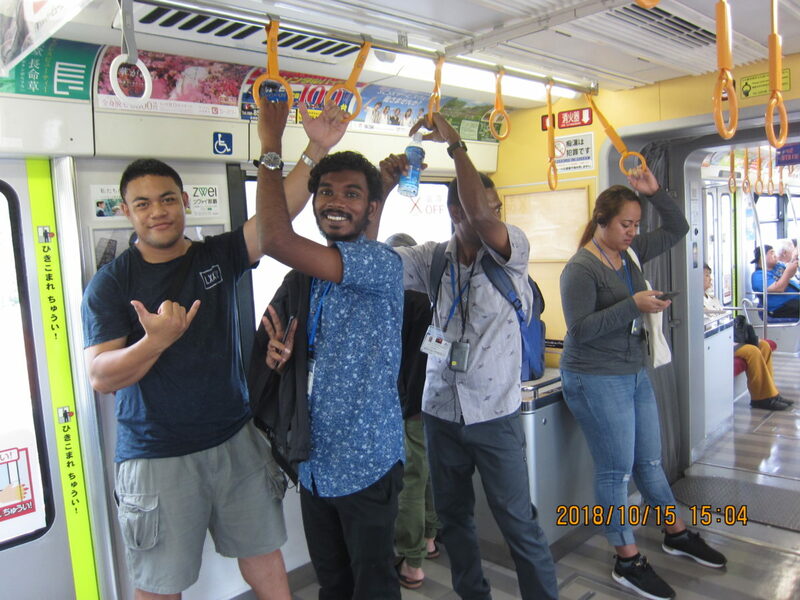 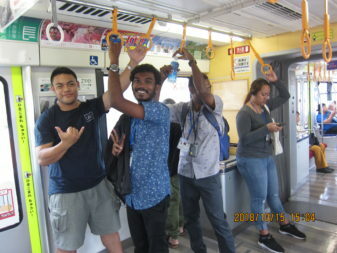 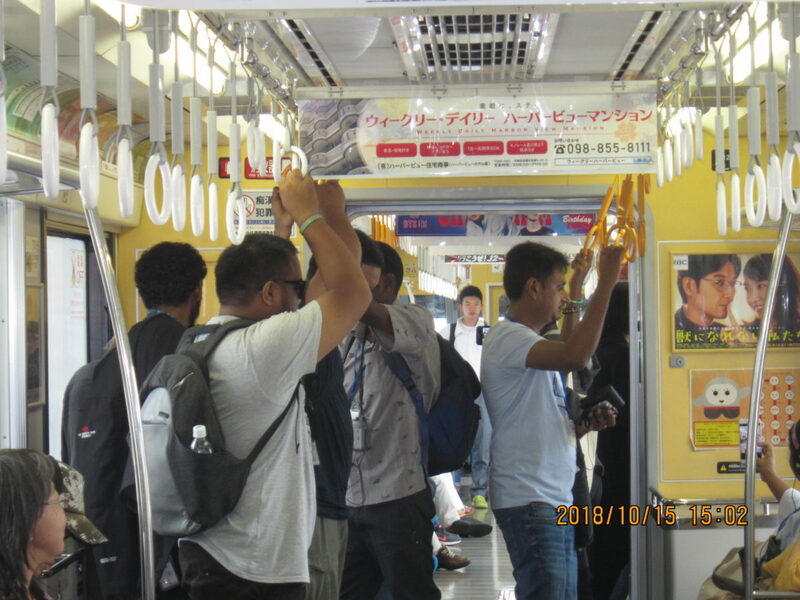 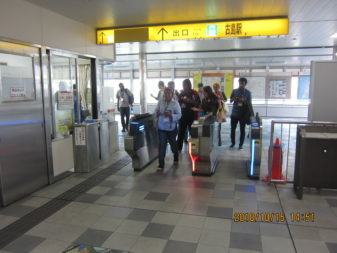 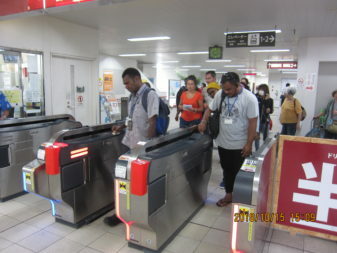 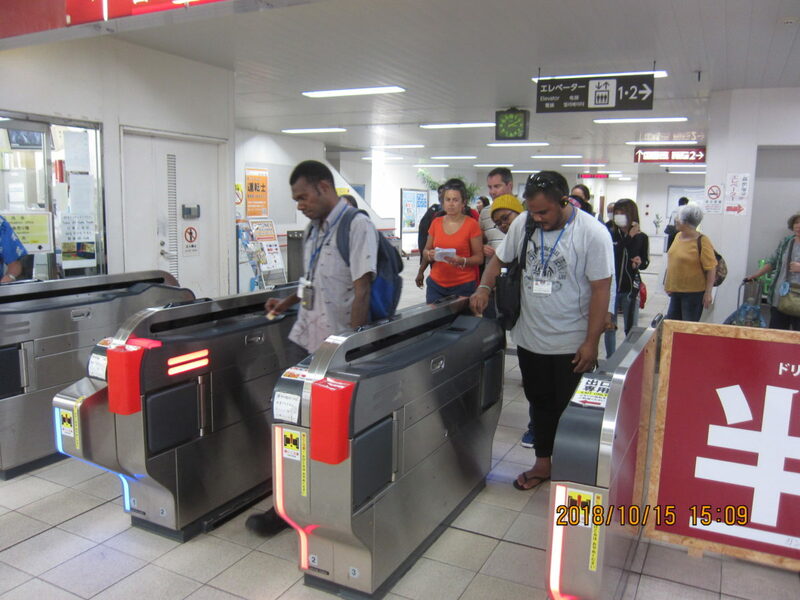 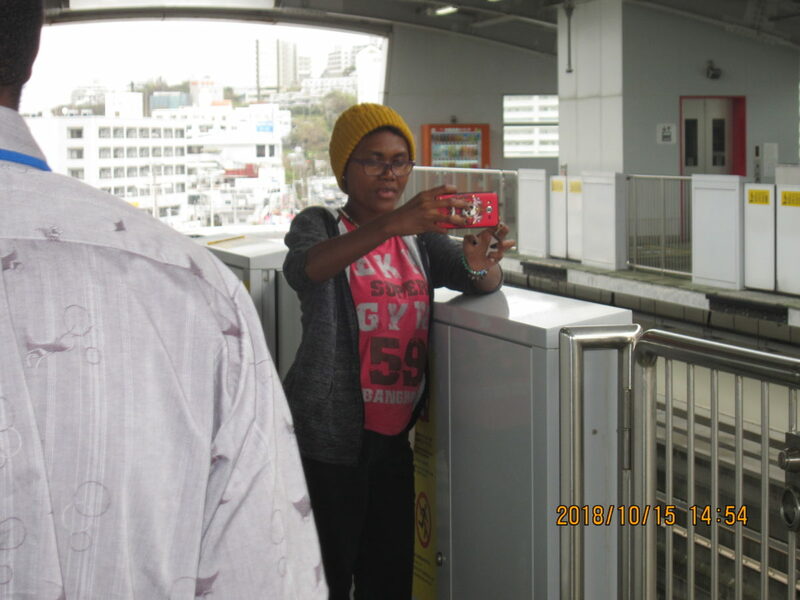 And they moved to Furujima station, one of the stations of Okinawa Urban Monorail Service, and experienced rising on the train up to Shuri Station, the destination station.